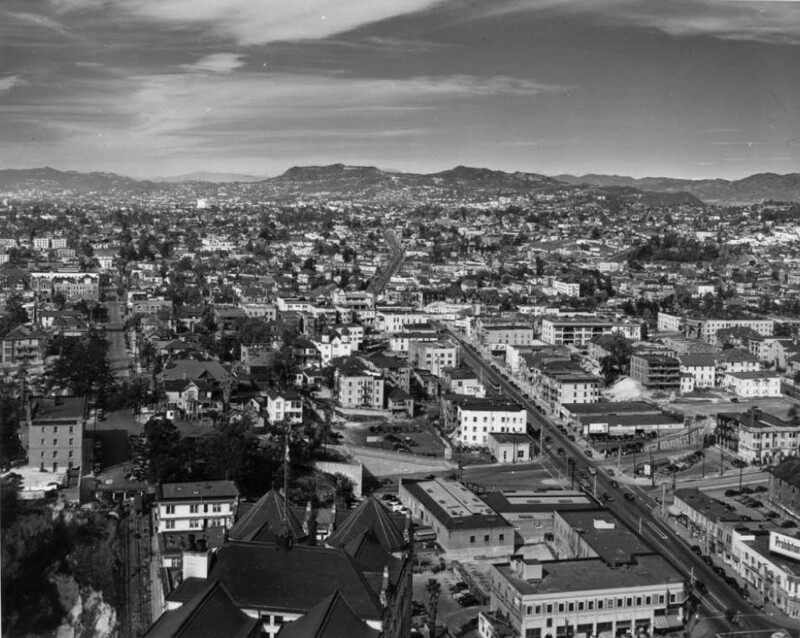 (1956)^ - Aerial view looking northwest showing the Hollywood business district, with the Capitol Records Building visible middle right. Other visible buildings include: Pantages Theatre, E.F. Hutton Building, Broadway-Hollywood, Hotel Knickerbocker, Guaranty Building, and the Taft Building. The streets are (diagonally, l to r): Selma Avenue, Hollywood Boulevard, and Yucca Street; and (bottom to top) Gower Street, Argyle Avenue, Vine Street, Ivar Avenue, and Cahuenga Boulevard, to name a few. 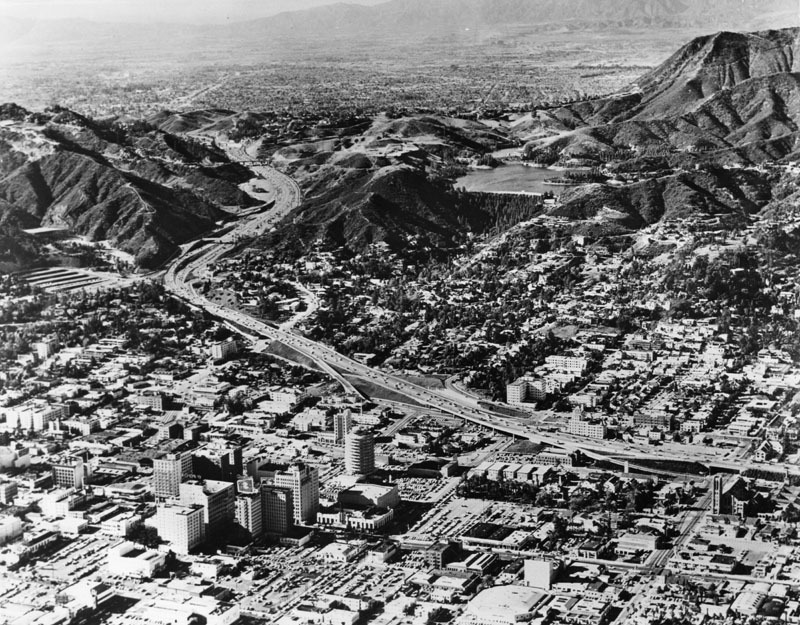 The Hollywood (101) Freeway is visible along the right as it heads its way through Cahuenga Pass. (1956)^ - Aerial view of the Hollywood business district, with the Capitol Records Building in the foreground; view is looking south. The cluster of tall buildings around the intersection of Hollywood and Vine can be seen at center of photo. 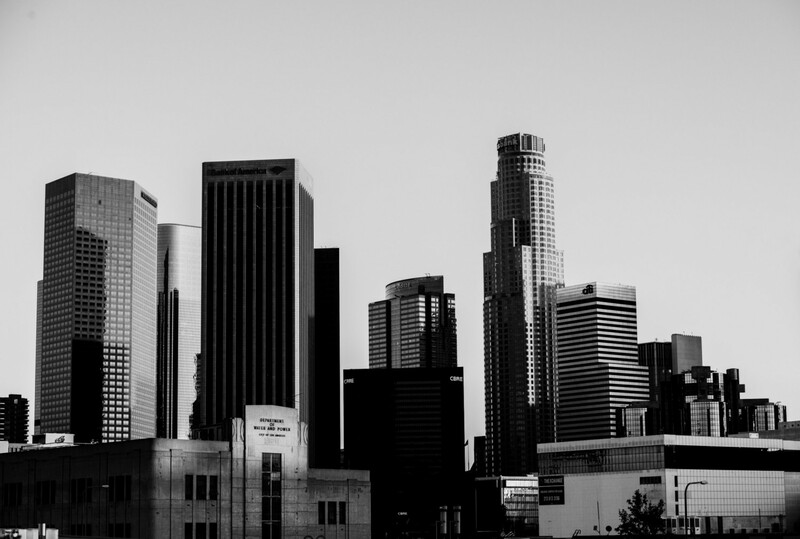 Visible buildings include: Pantages Theatre, E.F. Hutton Building, Broadway-Hollywood, Hotel Knickerbocker, Guaranty Building, and the Taft Building. The streets are (vertically, l to r): Argyle Avenue, Vine Street, Ivar Avenue, Cahuenga Boulevard; and (horizontally, bottom to top) Yucca Street (extreme bottom), Hollywood Boulevard, Selma Avenue, and Sunset Boulevard, to name a few. (1956)^ - Aerial view of Hollywood showing the Capitol Records Building in the center surrounded by other buildings near Hollywood Boulevard and Vine Street; view is looking southeast. The visible streets are (diagonally, r to l): Vine Street, Argyle Avenue, Gower Street, and Bronson Avenue and (l to r): Yucca Street, Hollywood Boulevard, and Sunset Boulevard. 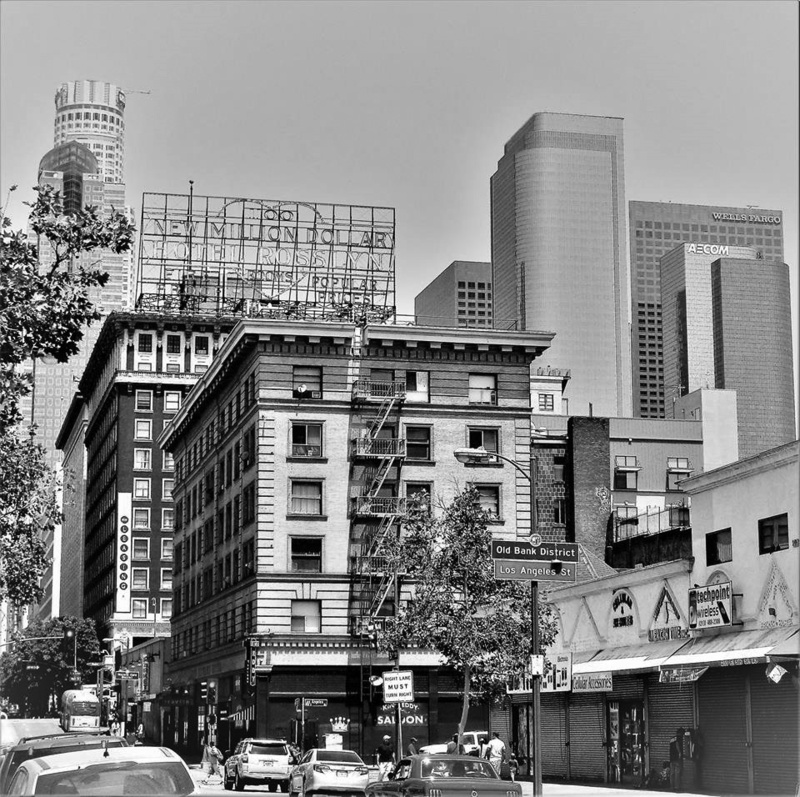 Other visible buildings are Yucca Vine Building (corner of Yucca and Vine), Equitable Building (corner of Vine and Hollywood), Pantages Theatre (corner of Hollywood and Argyle), and Charles E. Skinner Studios (corner of Argyle and Yucca). (ca. 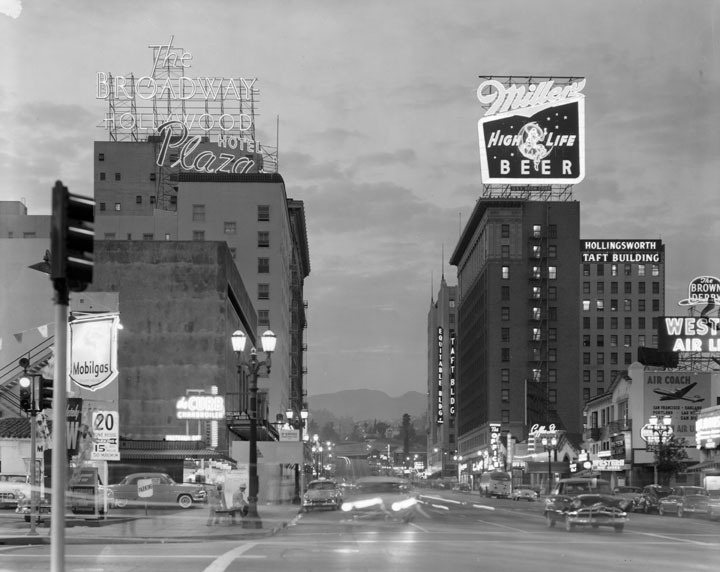 1950s)^ - View at dusk, neon signs lit, looking northward on Vine Street from Selma Ave. On the left, The Broadway-Hollywood, Plaza Hotel, Mobilgas ; on the right, Equitable Building, Taft Building, The Brown Derby Coffee Shop. Atop the Taft Building a large neon sign for Miller High Life beer. 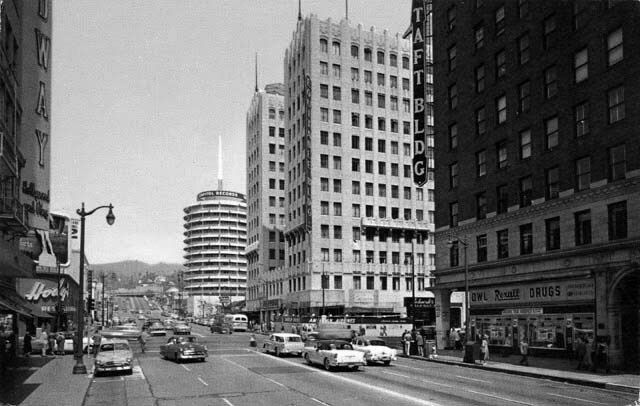 The Capitol Records Building is hidden from view by the Equitable Building. 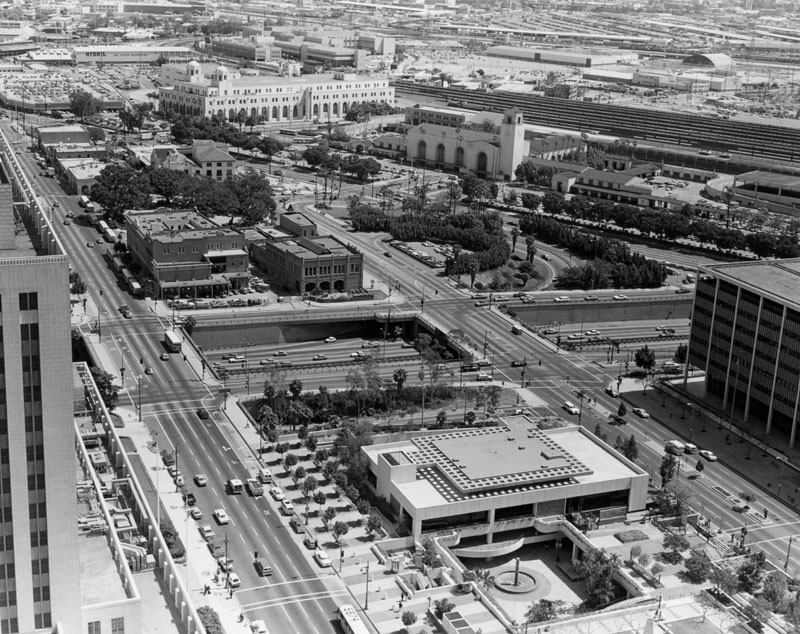 (1950s)+^+ - View looking north toward the intersection of Hollywood and Vine. 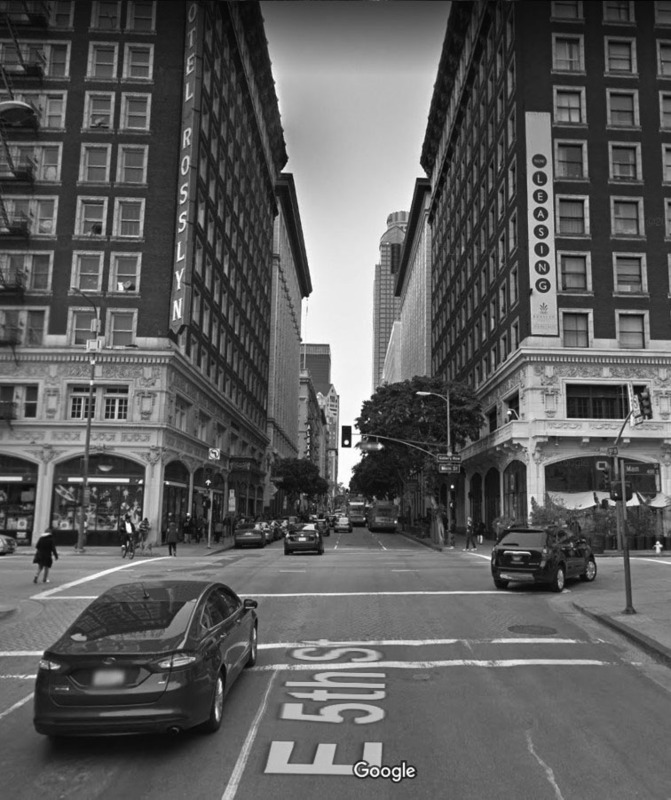 The four main buildings located on the corners of the intersection can be seen (L to R): The Broadway-Hollywood, Hody's Restaurant, Equitable Building, and the Taft Building. 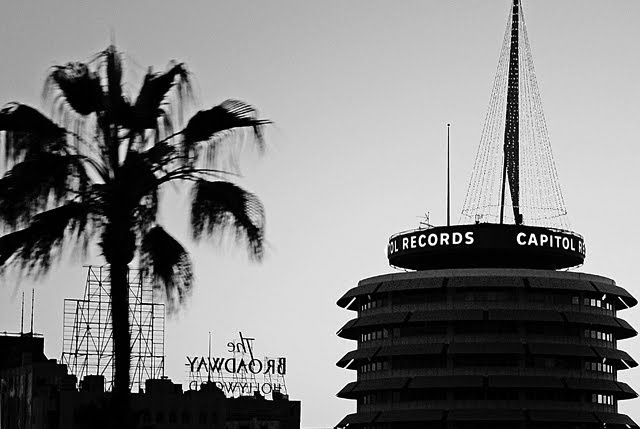 The iconic Capitol Records Building stands in the background. (ca. 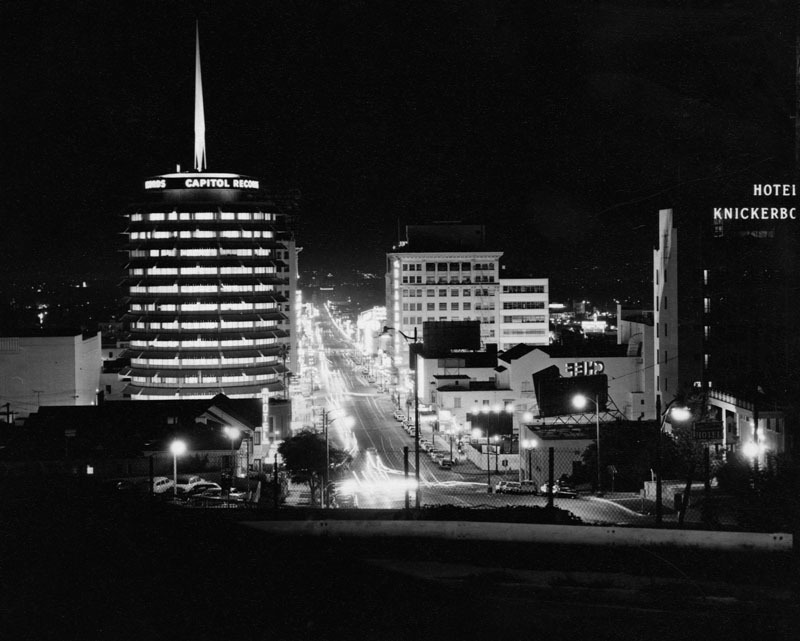 1961)+#+ – View looking south on Vine Street from Yucca Street with the Capitol Records Building on the left. (ca. 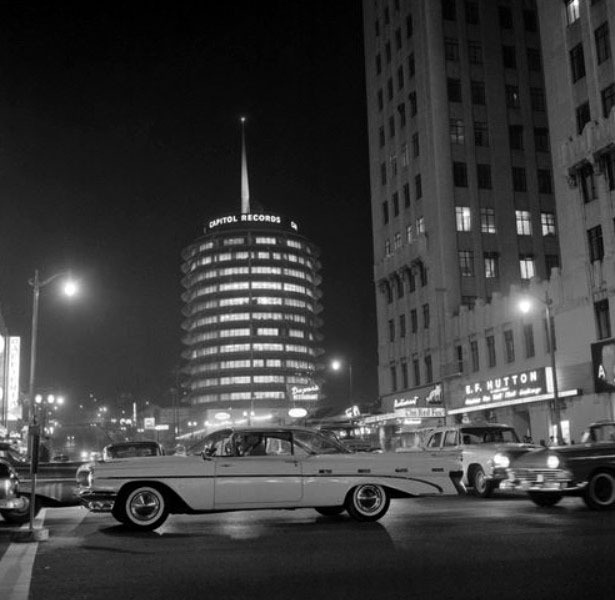 1960)^ - View shows the Capitol Records Building (left) and Hotel Knickerbocker (right). 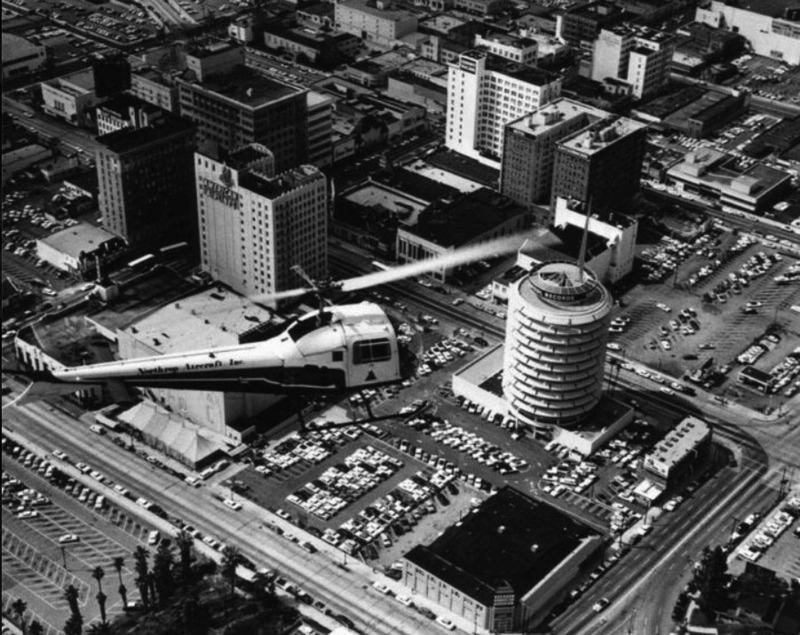 Capitol Records, located on Vine Street, is a unique 13-story, 150 ft. high-rise cylindrical building that was built in 1956 by architect Welton David Becket and contractor C. L. Peck Co.
(1970)##^# - Aerial view looking southwest showing a helicopter hovering over Hollywood. 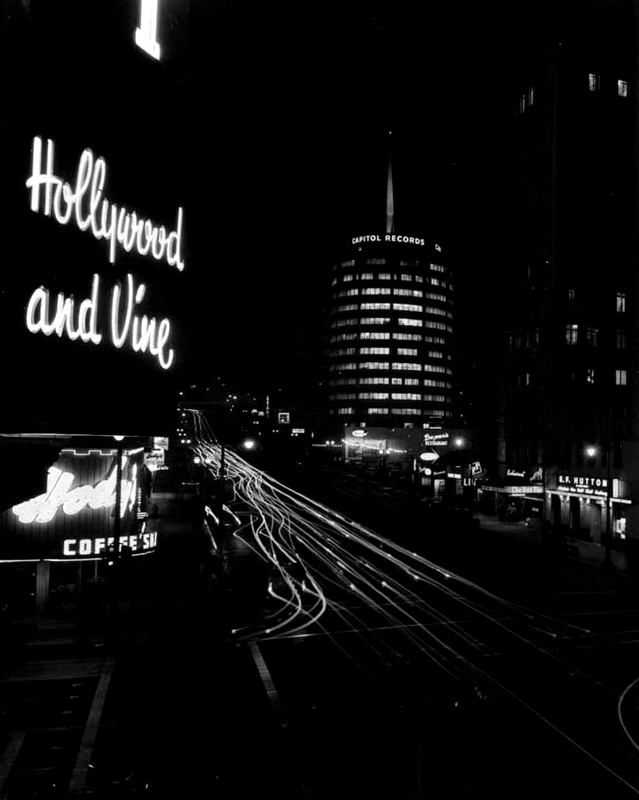 The intersection of Hollywood and Vine is at upper center-left and the Capitol Records Building stands tall at center-right. 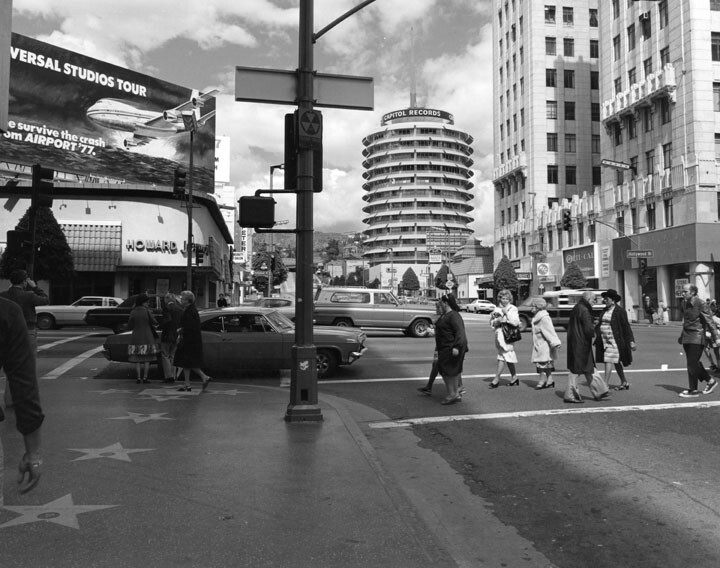 (1978)^ - A view taken from the west side of Vine St., looking north toward the Capitol Records Building. A sign over the Howard Johnsons on the northwest corner advertises Universal Studios Tour and the film Airport '77. Also visible are stars on a portion of the Hollywood Walk of Fame. (n.d.)**** - View of the Capitol Records Building during the holidays. Each year, they add the Xmas tree to help make the city a little more festive. (ca. 1960)*# - Aerial view of the Los Angeles Coliseum, Los Angeles Los Angeles Sports Arena, University of Southern California (USC), Downtown Los Angeles, and the Harbor Freeway (I-110). 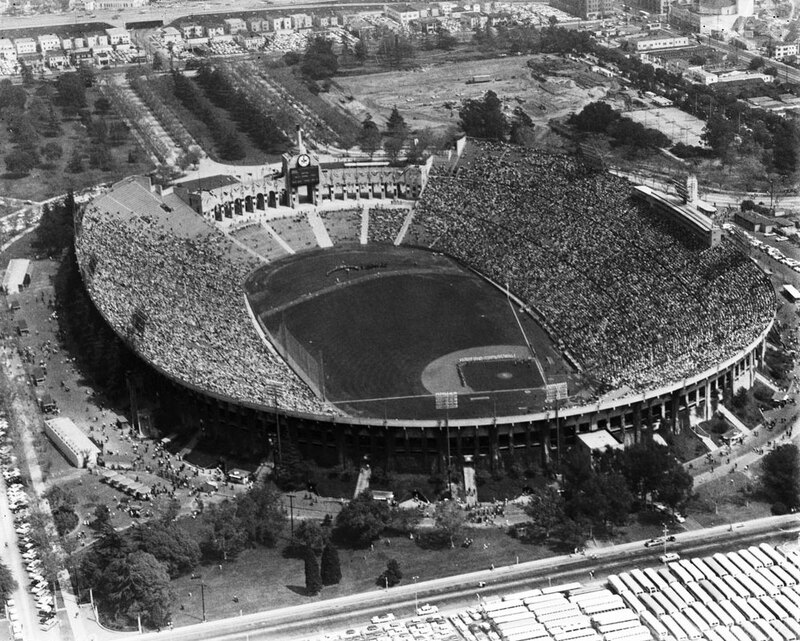 (1958)*# - Aerial view of the Los Angeles Memorial Coliseum on Dodger’s opening day, April, 18, 1958. 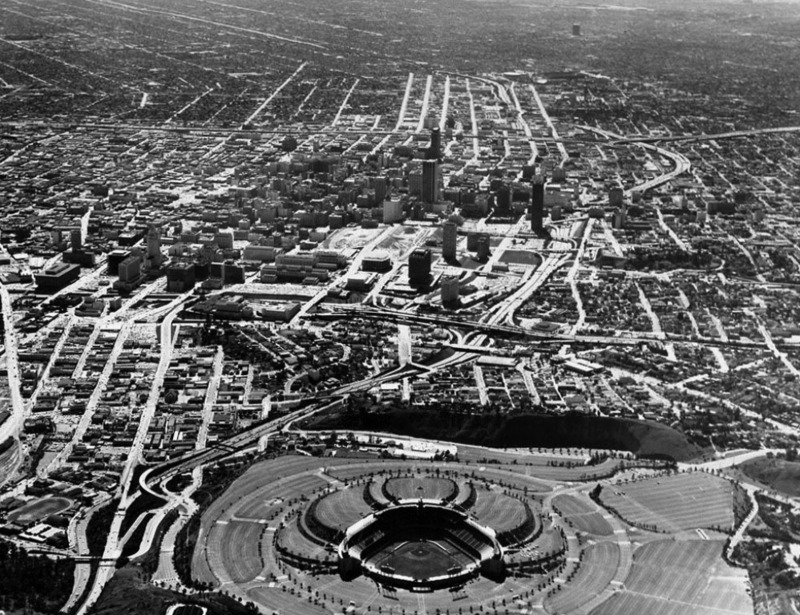 (1960)^ - Blimps-eye view shows both the Los Angeles Memorial Coliseum and the Los Angeles Memorial Sports Arena. 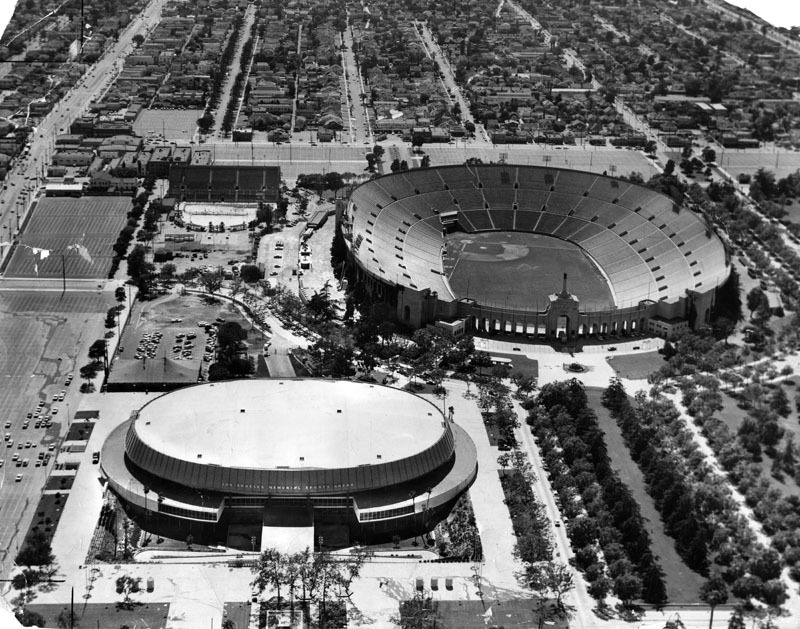 Note the baseball diamond in the Coliseum where the LA Dodgers played (1958-1961). (1967)^^ – The Packer’s Jim Weatherwax, No. 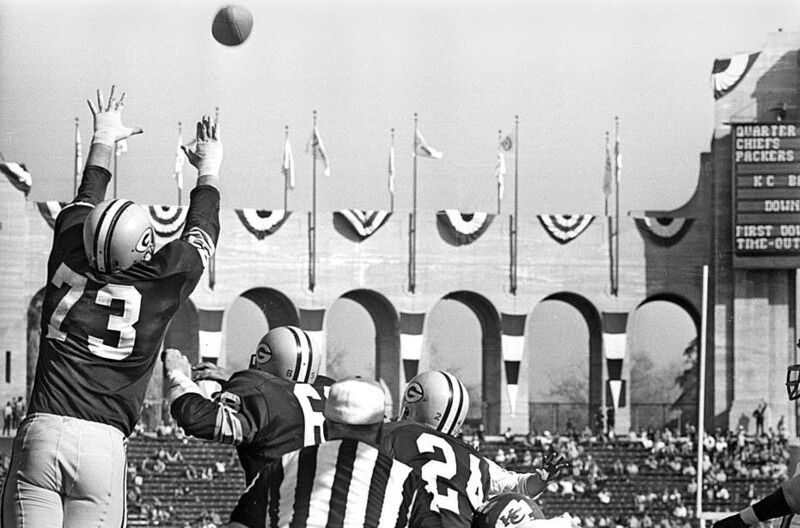 73, tries to block a Chiefs kick at Super Bowl I on January, 15, 1967. (ca. 1937)^#^^ - View looking northwest from City Hall tower over the Hall of Records. Bunker Hill is covered with multiple dwellings. 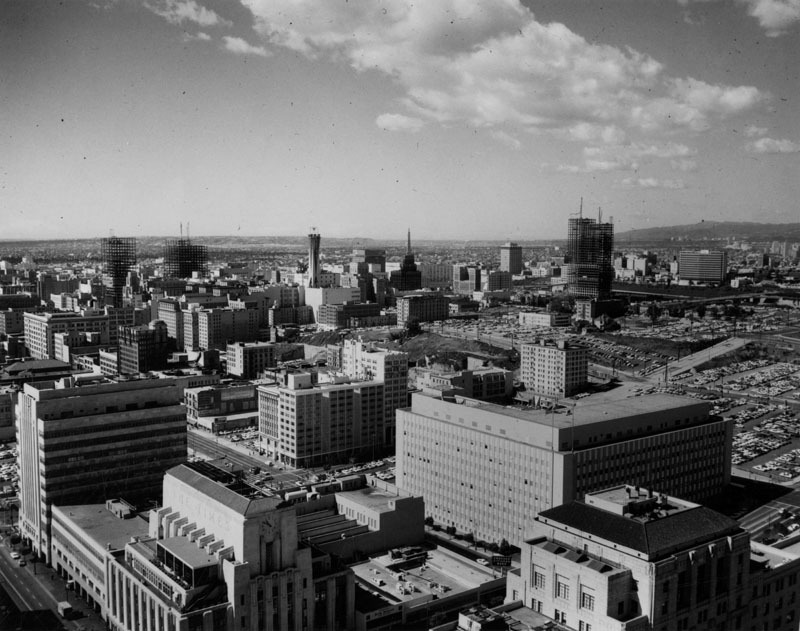 (1951)##^#– View looking northwest from the top of the Hall of Records showing Bunker Hill as it appeared in the early 1950s. The Four Level Interchange is seen under construction at center-right. Parking lots fill the void where apartment house once stood. Court Street is seen at left running away from the camera. At lower-right is the instersection of Temple and Hill streets. 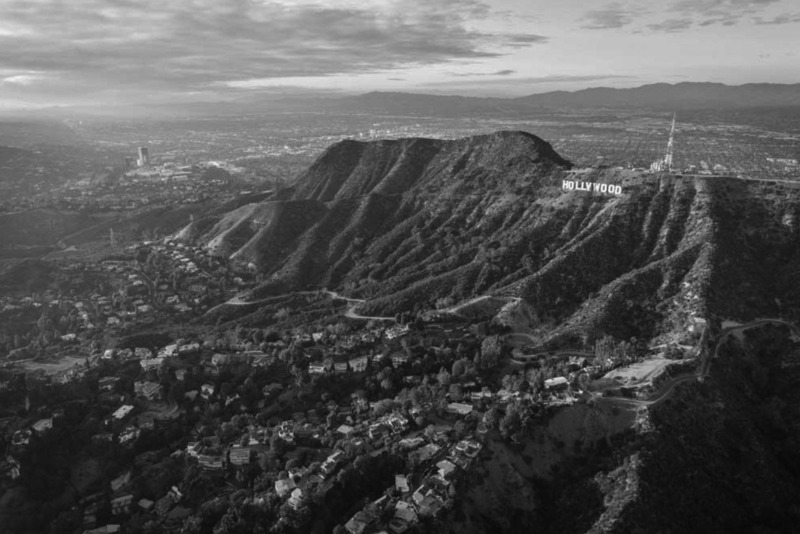 The Hollywood Hills and Hollywood Sign can be seen seen in the distance. (Early 1950s)^#^^ - View looking northwest from City Hall tower. Court Street runs away from the bottom on the left. Bunker Hill has been slightly shaved to make room for the New County Courthouse, which is under construction, and several parking lots. There are still a few remaining dwellings at the far end of Bunker Hill. (ca. 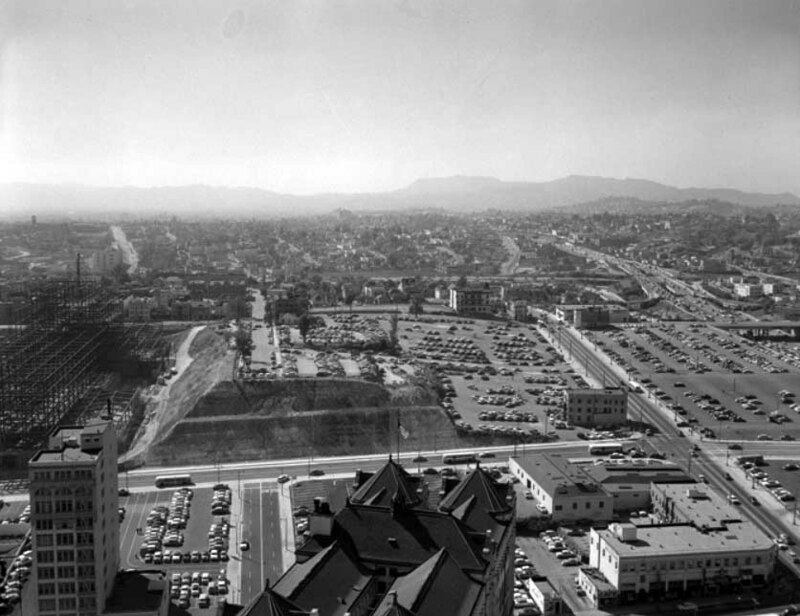 1960)^ - View looking northwest from City Hall toward Bunker Hill prior to construction of the DWP General Office Building and the Music Center. (ca. 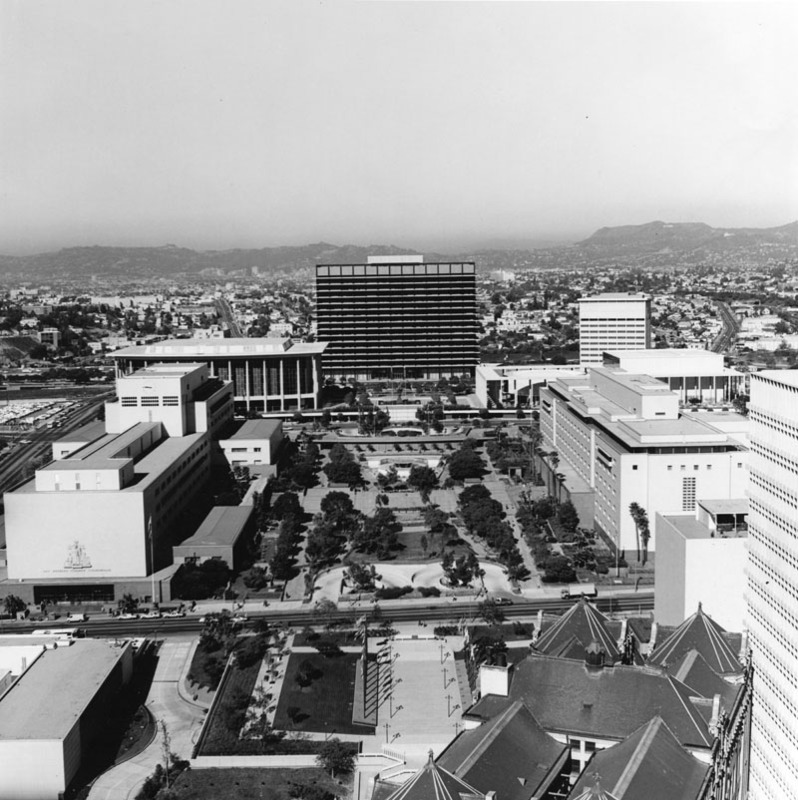 1970)^ - View of from City Hall looking northwest toward the DWP General Office Building and the Music Center located on Bunker Hill. ca. 1937)*# - Panoramic photograph composite looking west from City Hall along Court Street with Hall of Records roof and Court Flight in the foreground. (ca. 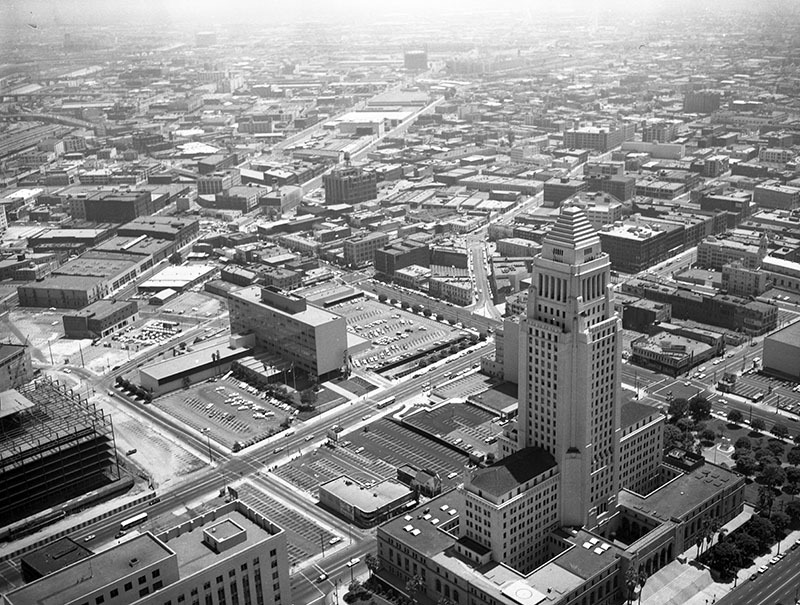 1960)^ - View looking northwest from City Hall. (ca. 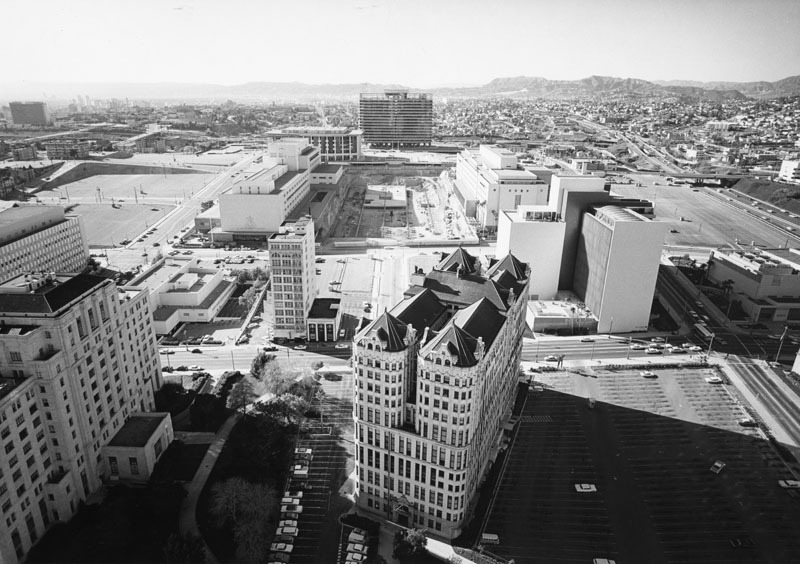 1970)^ - View looking northwest from City Hall. (ca. 1963)^ - Photo taken from the City Hall Tower; view is looking northwest. The old State Building can be seen on the left, and the old Hall of Records (diagonally set building) is on the lower right foreground with a large, practically empty parking lot to the right of the building. In the center of the photo are the New County Courthouse, County Administration, and construction of the County mall (excavated area). In the distance is the Department of Water and Power building, and the Dorothy Chandler Pavilion and Music Center are on the left of DWP (between DWP and County Courthouse). 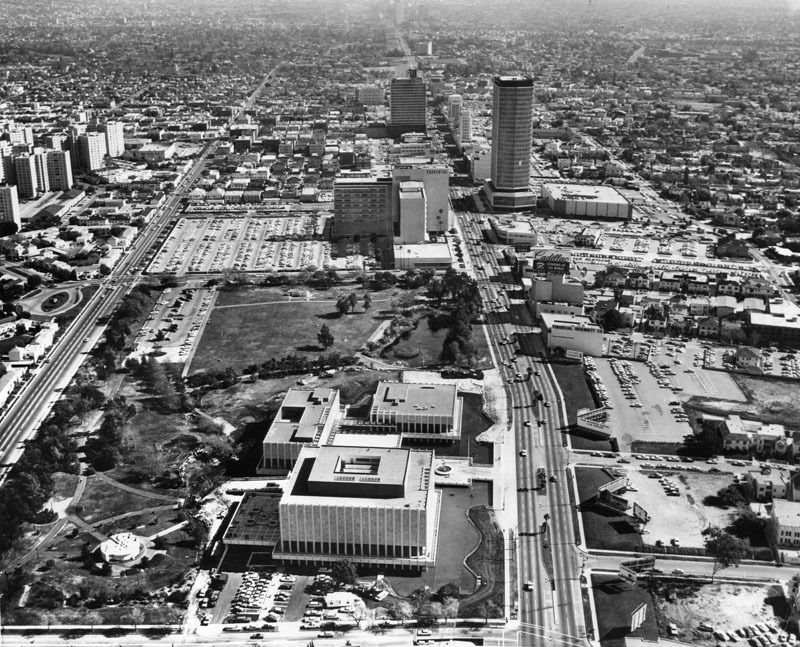 (1963)^ - Aerial view of Los Angeles Civic Center neighborhood of government offices; view is looking northwest. 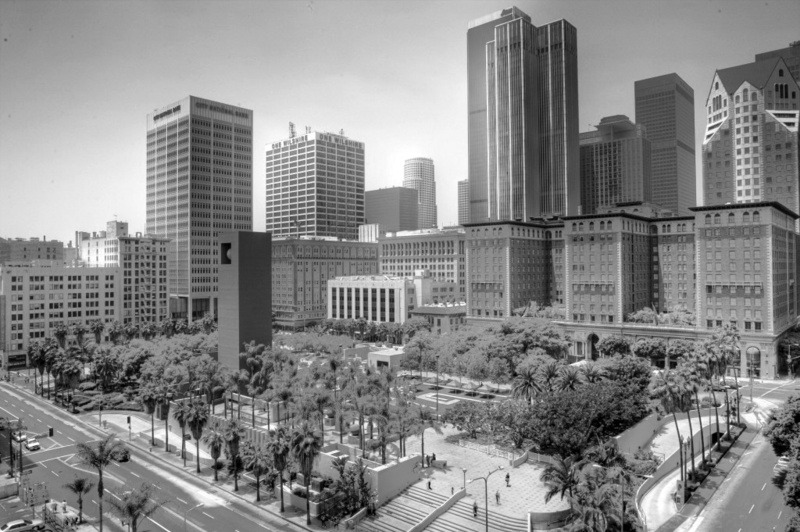 Identifiable landmarks include the Federal Courthouse at bottom right; Los Angeles City Hall, located at 200 N. Spring St. sits at center forefront; the old Hall of Records, the Hall of Justice behind City Hall; in the distance is the Department of Water and Power building (tall building with horizontal lines), and the Dorothy Chandler Pavilion and Music Center are on the left of DWP (between DWP and New County Courthouse. The Hollywood (101) Freeway is on the right; Temple St. is vertically at center right; 1st St. is vertically at left; Main St., Spring St., Broadway, Hill St. Grand Ave. are horizontally from bottom up; the Harbor (110) Freeway is horizontally at upper middle. 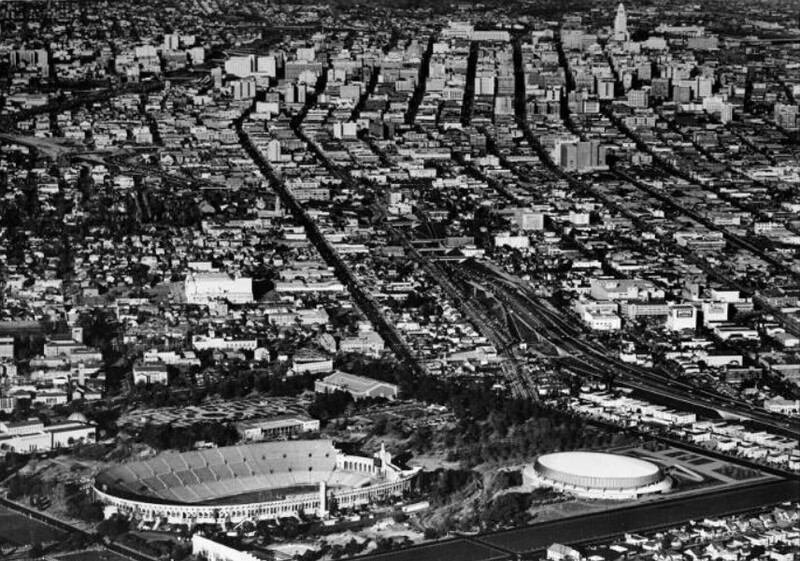 (1963)^ – Aerial view looking northeast showing Bunker Hill and the Civic Center. 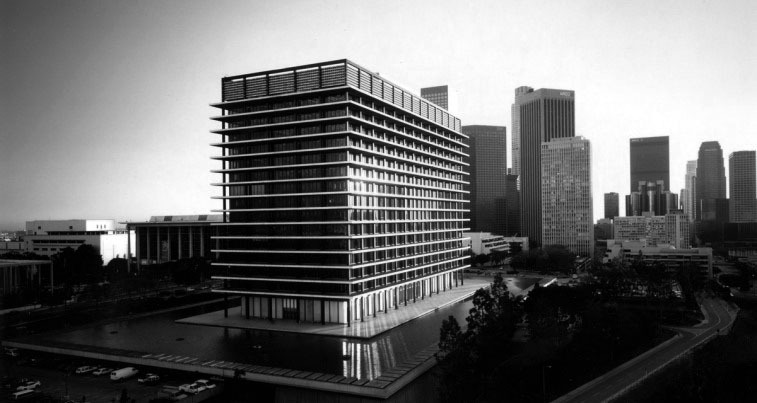 Both the DWP General Office Building and Dorothy Chandler Pavilion are nearly completed. 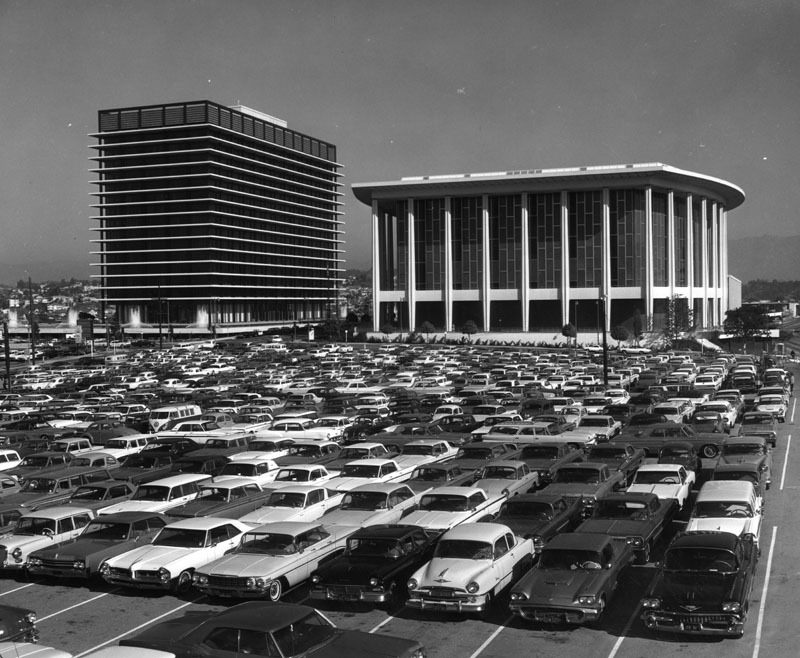 The Ahmanson Theater and Mark Taper Forum would not be completed until 1967. The empty lot across the street from the Dorothy Chandler Pavilion will become the future home of Walt Disney Concert Hall. (ca. 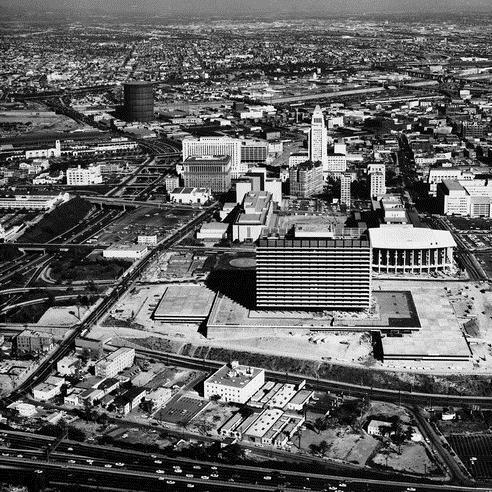 1963)^ - Another aerial view of the civic center with City Hall in the background and the yet to be completed Dorothy Chandler Pavilion and Department of Water and Power General Office Building (GOB) in the foreground. (1960)*# – View looking southwest from the L. A. County Courthouse at 1st and Grand showing a large empty lot sitting on top of Bunker Hill. This will become the site of the Walt Disney Concert Hall (completed in 2003). The multi-story building with the dome seen in the upper-left is the Dome_Hotel and Apartments (S/W corner of 2nd and Grand). 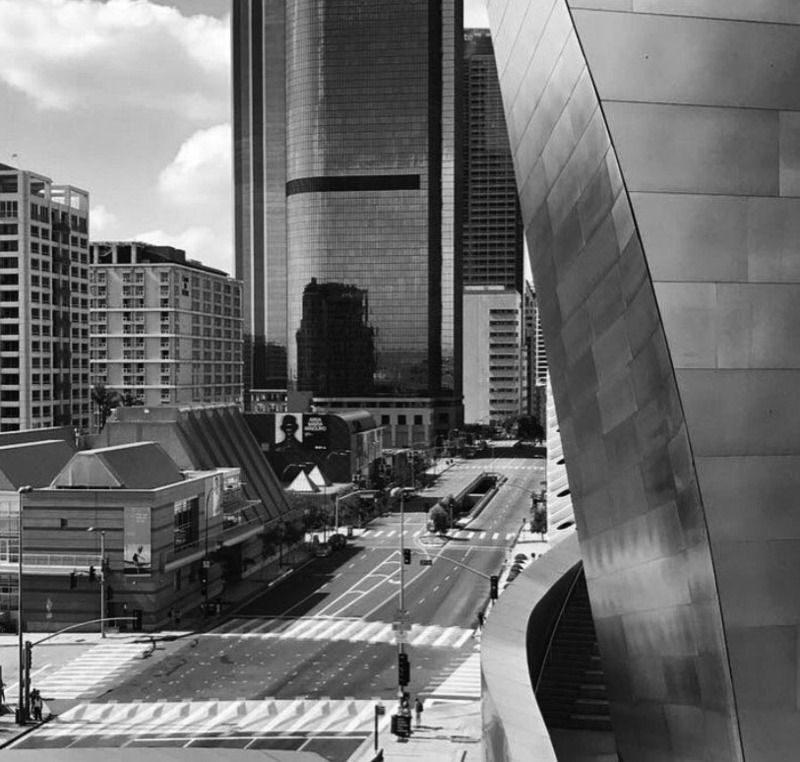 Today, the Broad Contemporary Art Museum stands at that corner. (1960)*# – Closer view showing the Dome_Hotel and Apartments (built in 1903) on the southwest corner of 2nd and Grand. The lot to the right is the future location of the Walt Disney Concert Hall. In the background through the haze and smog can be seen the Richfield Oil Company Building which was demolished in 1969 to make way for the ARCO Towers. On the morning of July 25, 1964, the Dome burst into flames. 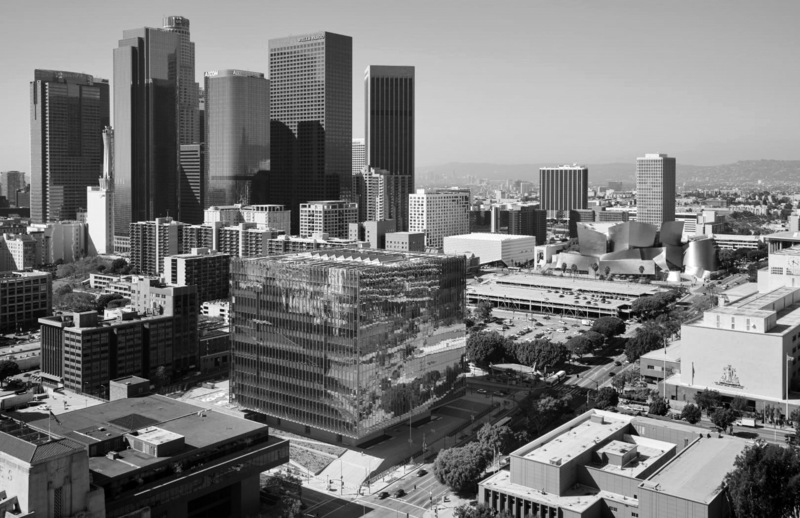 The building would be razed later that year to make room for a parking lot which existed until 2014 when construction began for the Broad Contemporary Art Museum (completed in 2015). 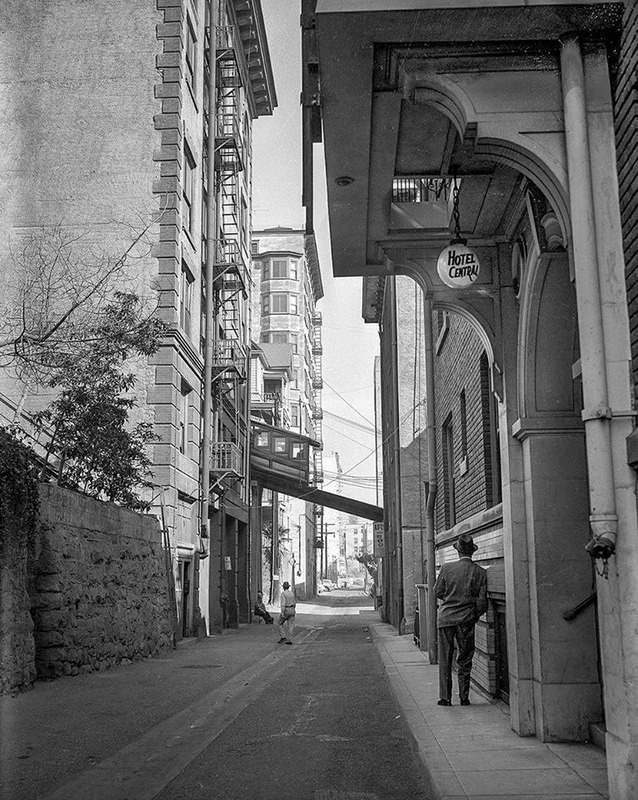 (1964)^^#* – View looking north on Flower Street from 4th Street, through the former Bunker Hill neighborhood. 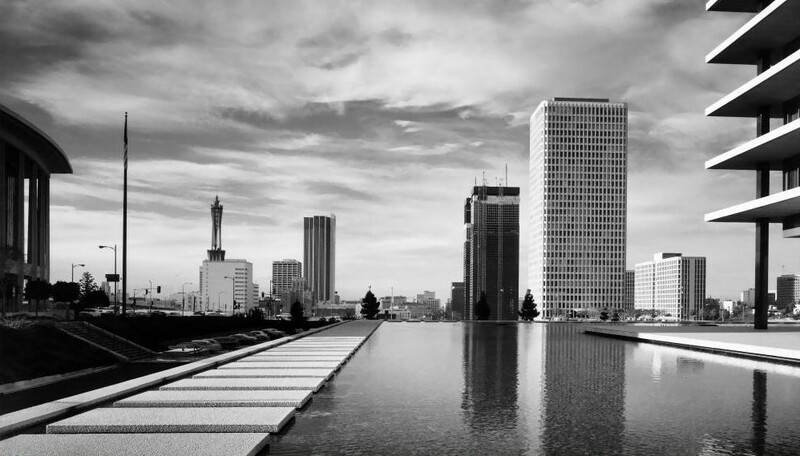 The newly constructed Dorothy Chandler Pavilion, right, and the Department of Water and Power headquarters can be seen past 1st Street. 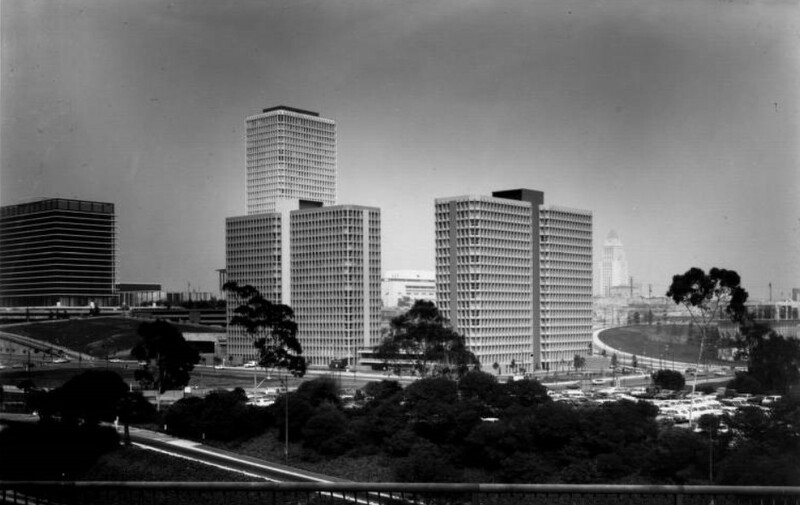 The Bunker Hill Towers have yet to be constructed. (ca. 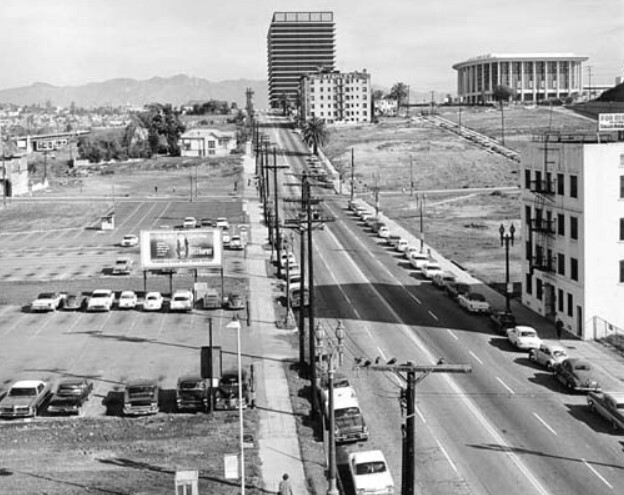 1967)^.^ – View looking north as seen from the SW corner of 1st and Hope streets with the DWP Building at left and the Dorothy Chandler Pavilion in the distance on the right. 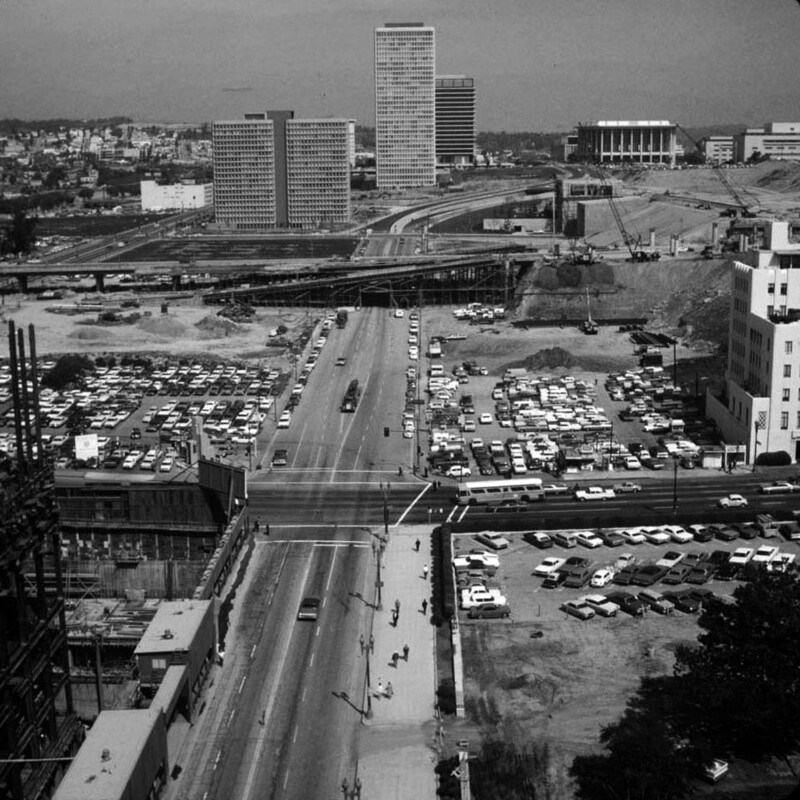 (1970)*^#^ - View from atop the Bank of California Building, looking north along Flower Street from 6th Street to the additional onramp construction at 4th Street. 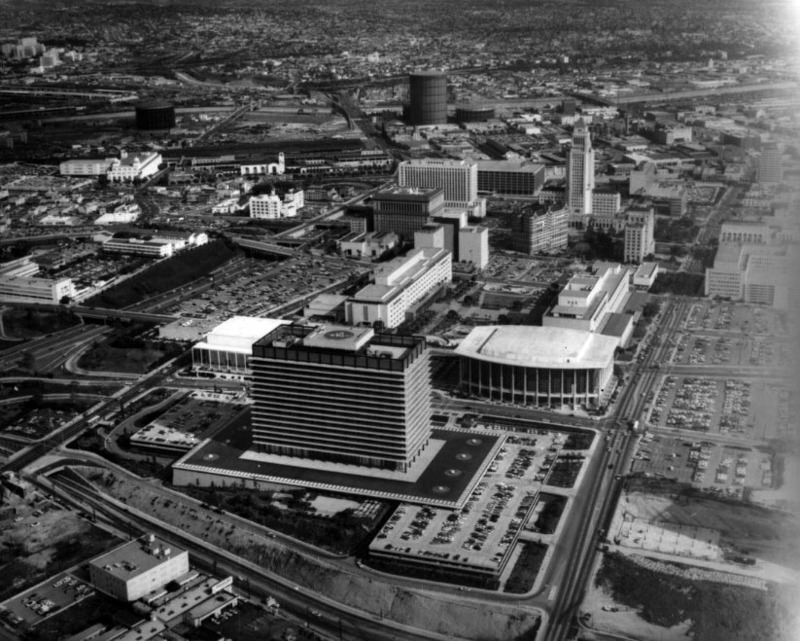 Prominent buildings in the background from left to right are the Bunker Hill Apartments and Tower, Los Angeles Department of Water and Power, and the Music Center. Since the previous photo, the Bunker Towers have been constructed. 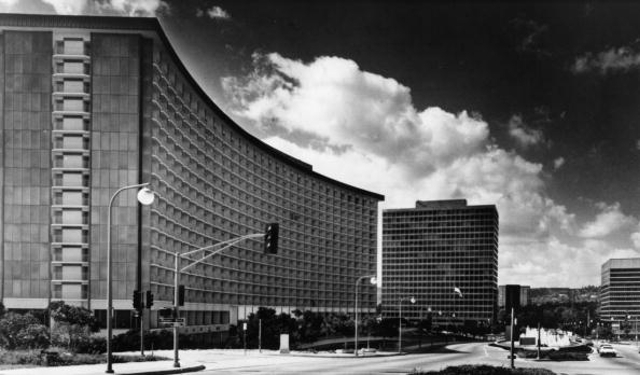 Built in 1968, the 32-story Bunker Hill Tower was one of the original buildings in the extensive Bunker Hill Redevelopment Project. 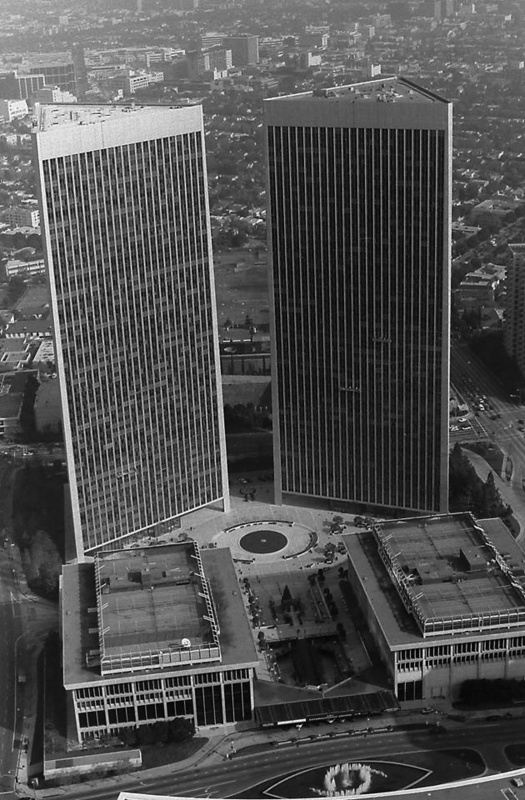 (1963)^ - Aerial view of Los Angeles Civic Center neighborhood of government offices; view is looking west. 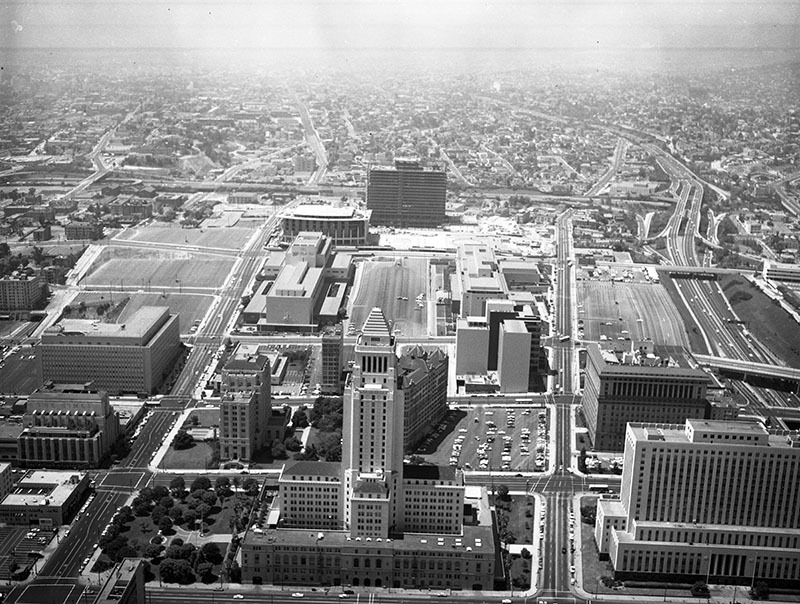 Identifiable landmarks include the Federal Courthouse at bottom right; Los Angeles City Hall, located at 200 N. Spring St. sits at center forefront; the old Hall of Records, and the Hall of Justice on the right; Los Angeles St., Main St., Spring St., and Broadway are visible from bottom left to middle right; Temple St., 1st St., and 2nd St. are visible from lower right to middle; the Harbor (110) Freeway is horizontally at top in the far distance. 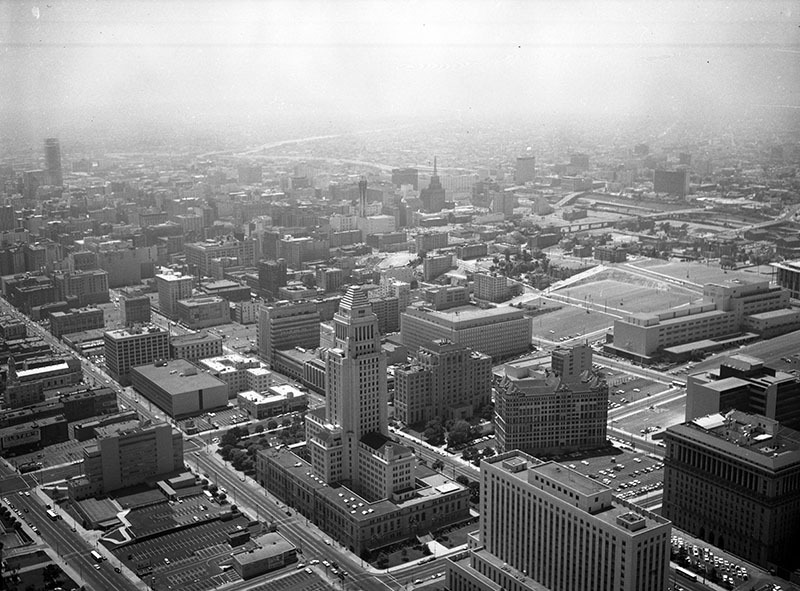 (1963)^ - Aerial view of Los Angeles Civic Center neighborhood of government offices; view is looking southwest. 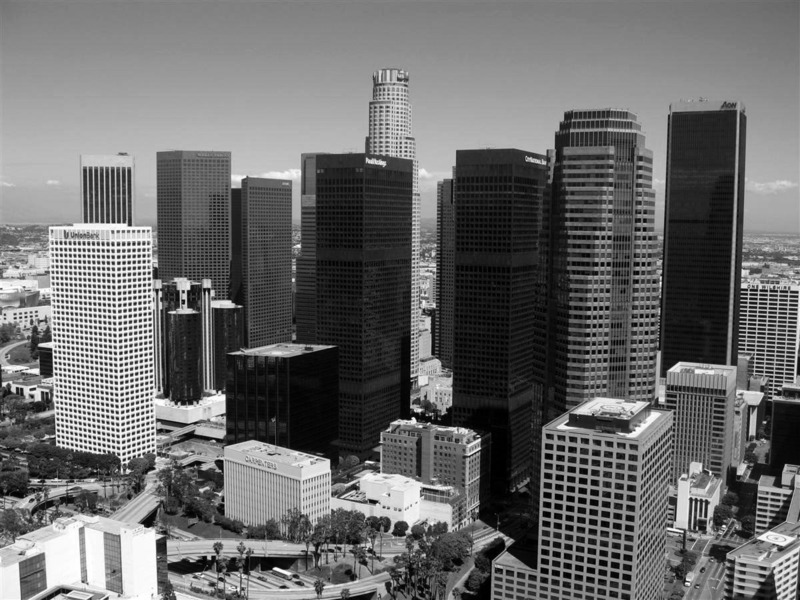 Identifiable landmarks include the Federal Courthouse at bottom middle; Los Angeles City Hall, located at 200 N. Spring St. sits at center forefront; the old Hall of Records, and the Hall of Justice on the right; Hill St., Broadway, Spring St., Main St., Los Angeles St. and San Pedro St. are vertically from right to left; Temple St., 1st St., 2nd St. and 3rd St. are horizontally from bottom to top. 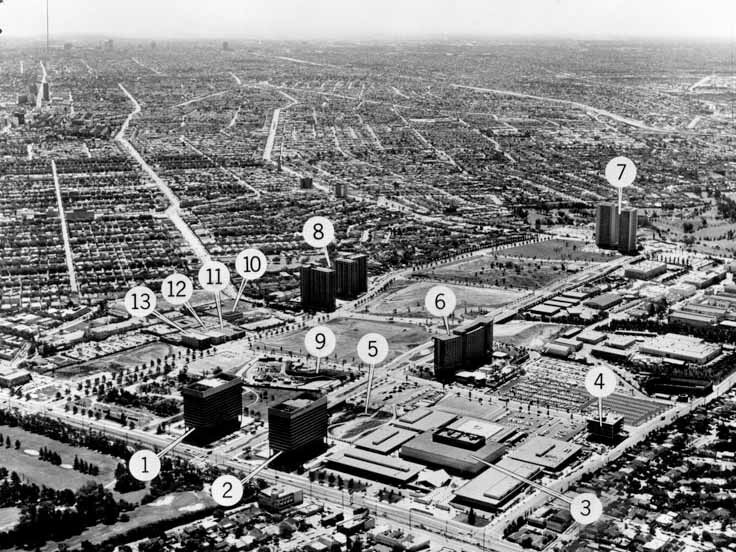 (1963)^ - Aerial view of Los Angeles Civic Center neighborhood of government offices; view is looking south. 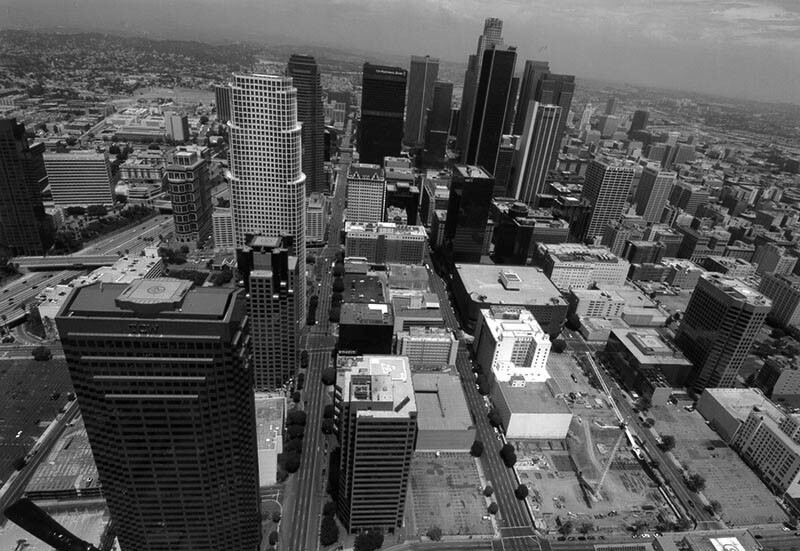 Identifiable landmarks include the Federal Courthouse at bottom left corner; Los Angeles City Hall, located at 200 N. Spring St. sits at forefront; Temple Street, lower right to upper left; Main St. is at upper right to bottom left corner; San Pedro St. from top right corner to lower left; Central Ave. paralleling Alameda St. are top middle to middle left; Los Angeles River at top left corner. (1963)^ - Aerial view of Los Angeles Civic Center neighborhood of government offices; view is looking northwest. 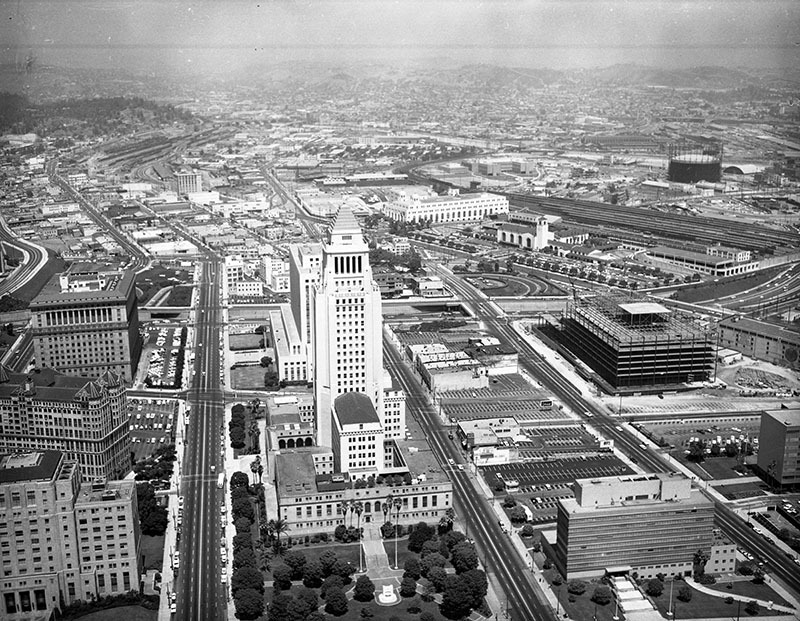 Identifiable landmarks include the Federal Courthouse at lower right; Los Angeles City Hall, located at 200 N. Spring St. sits at center forefront; the old Hall of Records, and the Hall of Justice behind City Hall; in the distance is the Department of Water and Power building (tall building with horizontal lines), and the Dorothy Chandler Pavilion and Music Center are on the left of DWP (between DWP and New County Courthouse). The Hollywood (101) Freeway at lower right to upper left; Temple St. is bottom middle to upper left; 1st St. is at bottom left corner; Main St., Spring St., Broadway, Hill St. Grand Ave. are diagonally from bottom right to middle; the Harbor (110) Freeway is horizontally at upper middle. 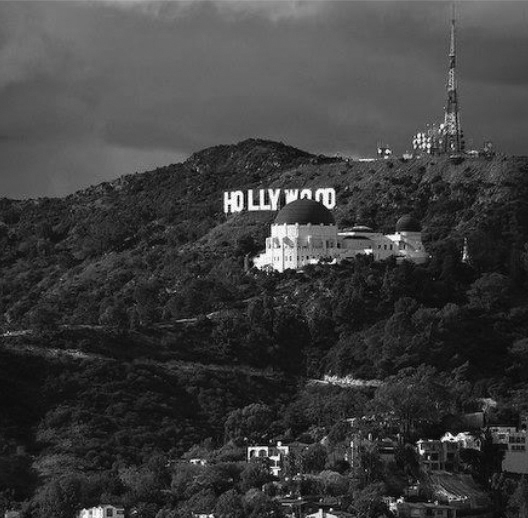 Hollywood can be seen in the background. 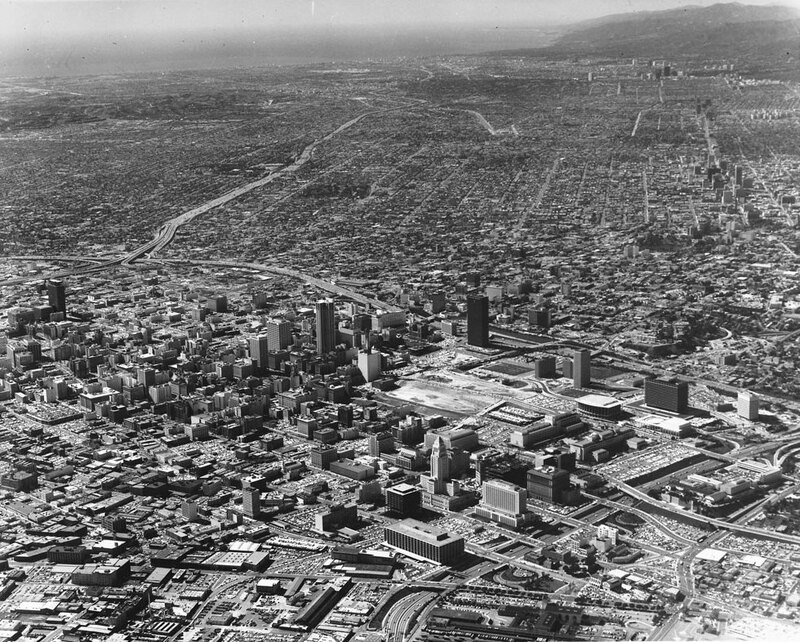 (1963)^ - Aerial view of Los Angeles Civic Center neighborhood of government offices; view is looking northeast. 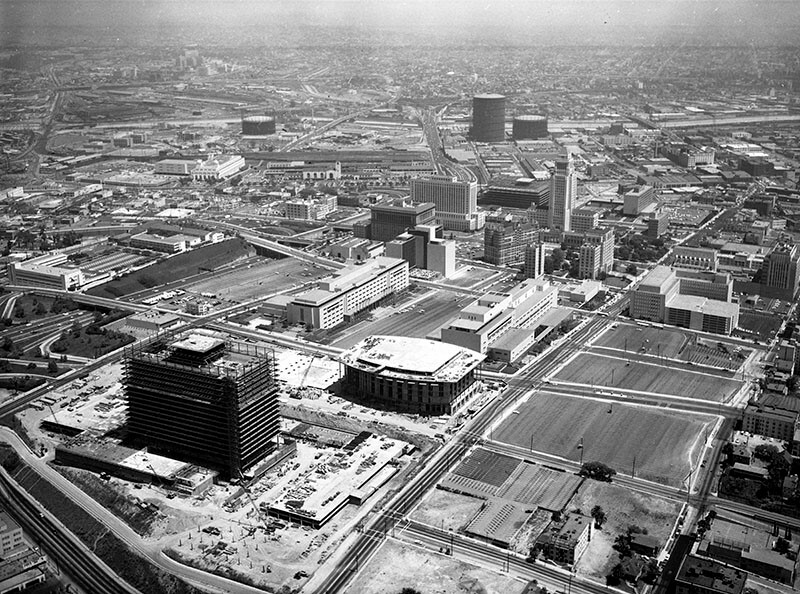 Identifiable landmarks include the Hall of Records, and the Hall of Justice on the left; Los Angeles City Hall, located at 200 N. Spring St. sits at forefront; the Federal Courthouse is under construction on the right, north of the LAPD headquarters (later Parker Center); the Santa Ana (101) Freeway is horizontally across the middle; Union Passenger Terminal, located at 800 N. Alameda St. and the Post Office Terminal Annex are at center right; Hill St., Broadway; Spring St., Main St., Los Angeles St. and Alameda St. are vertically left to right; Temple Street is horizontally at lower center; Cesar Chavez Ave. is horizontally at upper center. (ca. 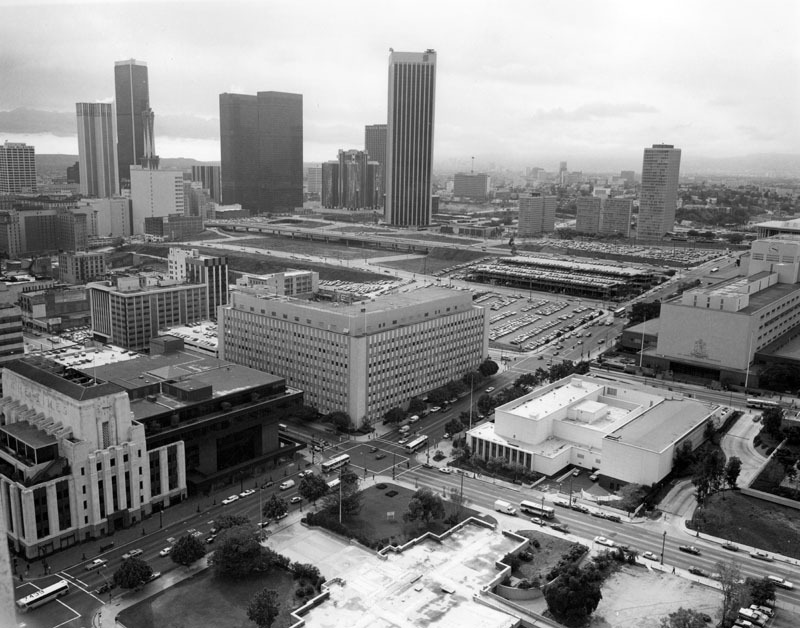 1965)#^^^ – View of the Los Angeles Civic Center looking southwest. The recently completed Federal Building is in the foreground. (ca. 1960s)* - Aerial view of Hollywood and its surrounding areas. 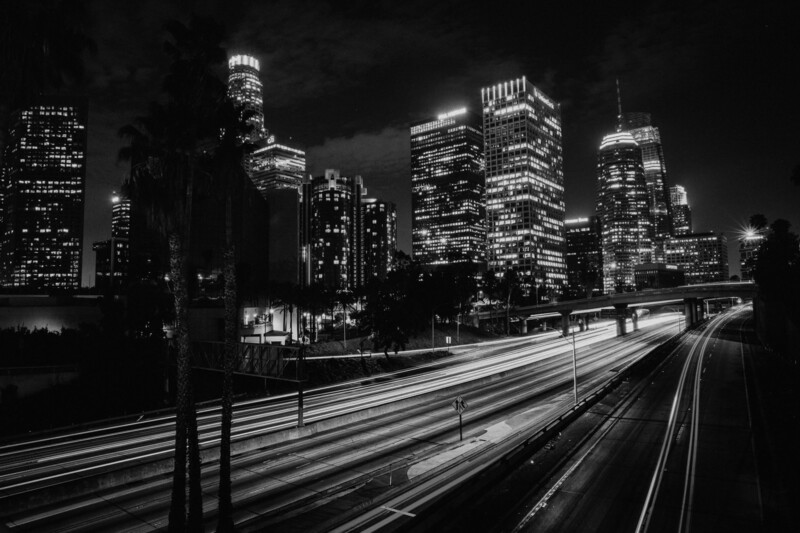 Cars may be seen travelling the Hollywood Freeway. Traffic going north is towards the Valley, going south is towards Los Angeles. 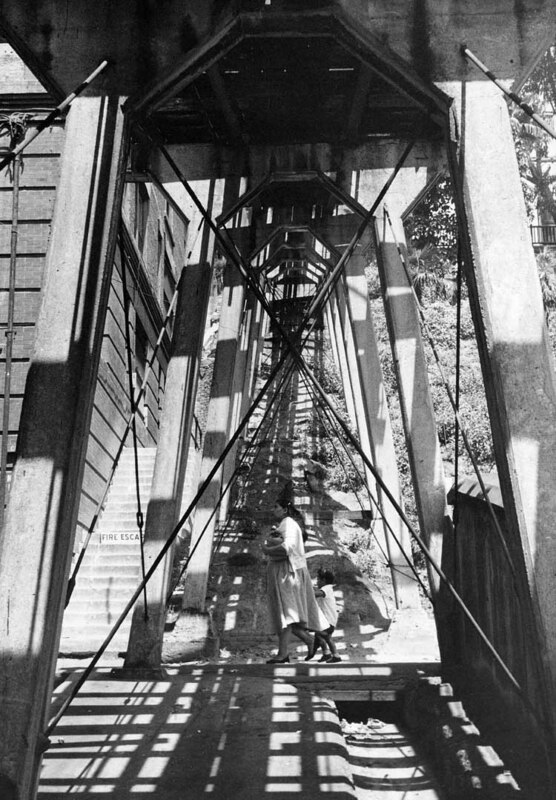 The Hollywood Reservoir is in the hills above Hollywood (Click HERE to see more Early Views of the Hollywood Reservoir). 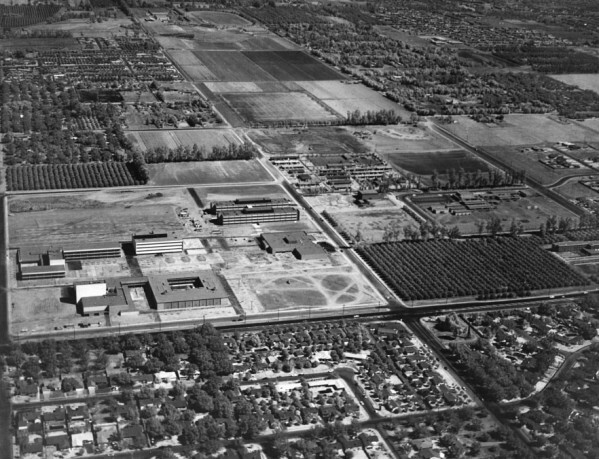 (1956)*^ - Aerial view of Los Angeles State College, San Fernando Valley Branch (now CSUN), looking northwest. The intersection of Zelzah and Nordhoff is in the left foreground. 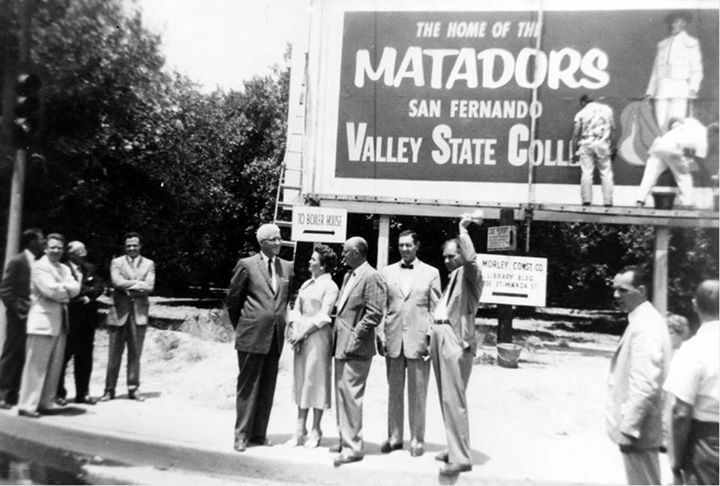 (1958)*^ - New sign in 1958 after Los Angeles State College separated from its parent institution and became San Fernando Valley State College (now CSUN) Pictured: Howard McDonald (President of L.A. State College), Ralph Prator (President of San Fernando Valley State College) and Delmar T. Oviatt (Dean of Instruction at San Fernando Valley State College). (ca. 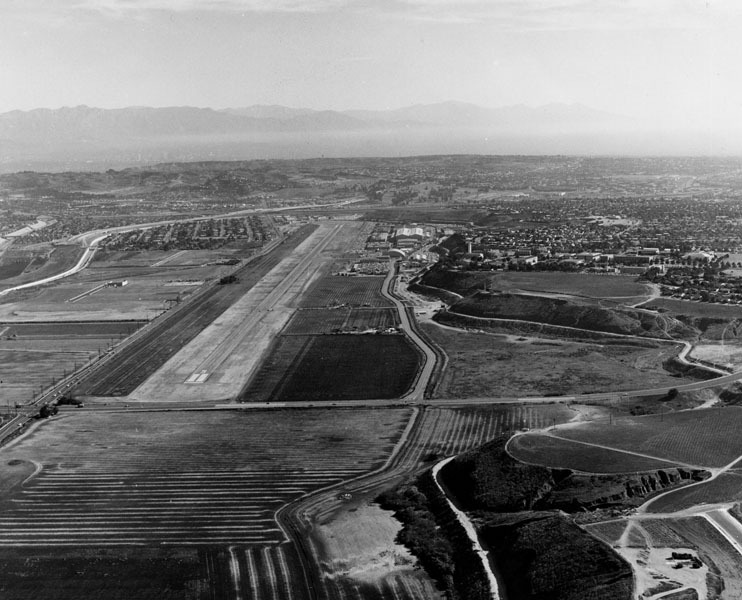 1960)*^ - Campus of San Fernando Valley State College (now CSUN), aerial view looking north. Nordhoff Hall, the Music Building on the left; Science buildings 1 and 2 and Bookstore Complex in the center. (1962)*^ - Another view of the campus of San Fernando Valley State College (now California State University Northridge). Clockwise: Sierra Hall construction site, Science Buildings 1 and 2, Bookstore Complex, Music Building, Nordhoff Hall. 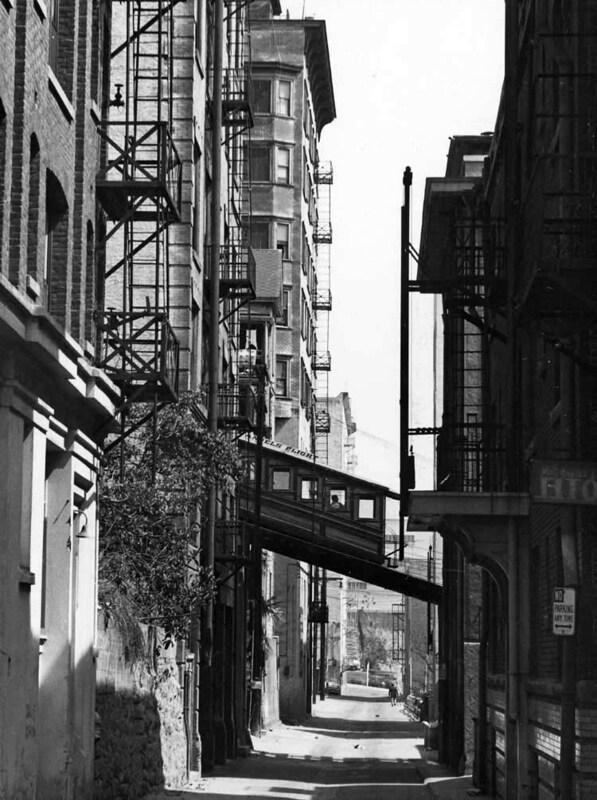 (1949)^.^ - View of Angels Flight as seen from the SE corner of 3rd and Hill streets. The Third Street Tunnel is on the right. 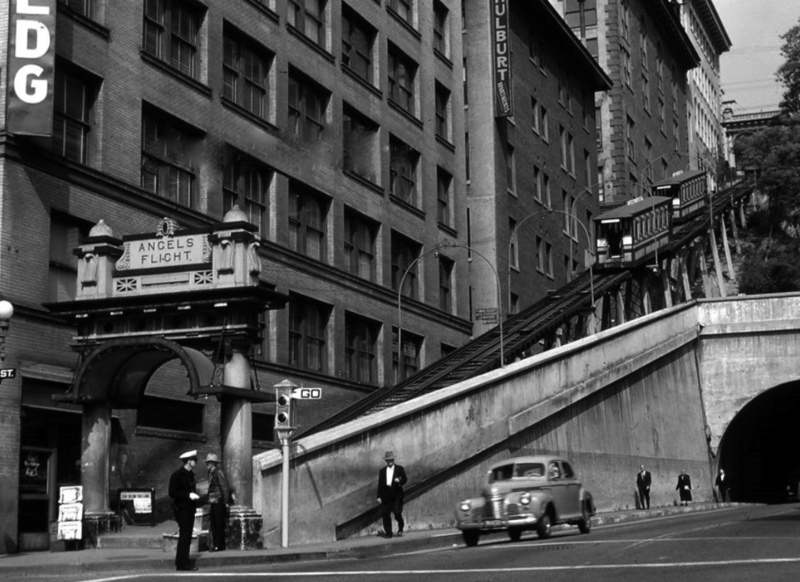 (1952)**** - Angels Flight Railway, probably the top noir location in bygone L.A...Looking west towards Hill St. and the Third Street Tunnel. 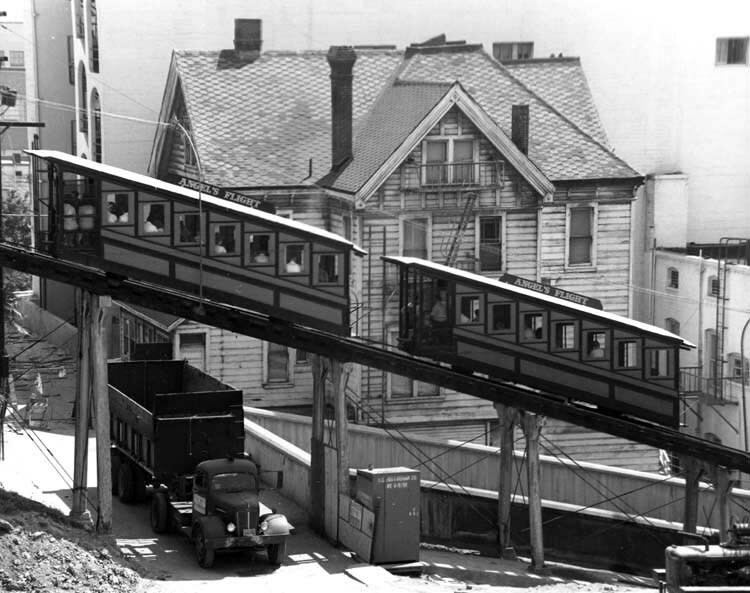 (1948)^ - A side view of two Angels Flight cable cars shortly after they crossed paths as they travel on the funicular tracks. 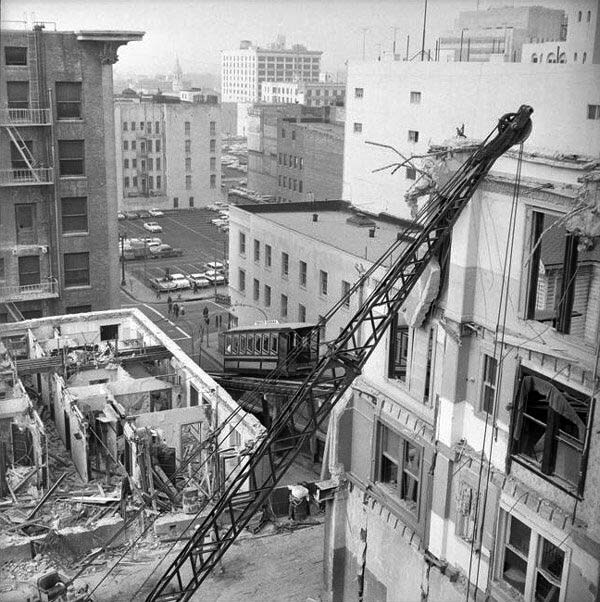 The track for the rail cars is seen mid-air, from the side along Clay Street, with cement "brackets" holding it up in the air. 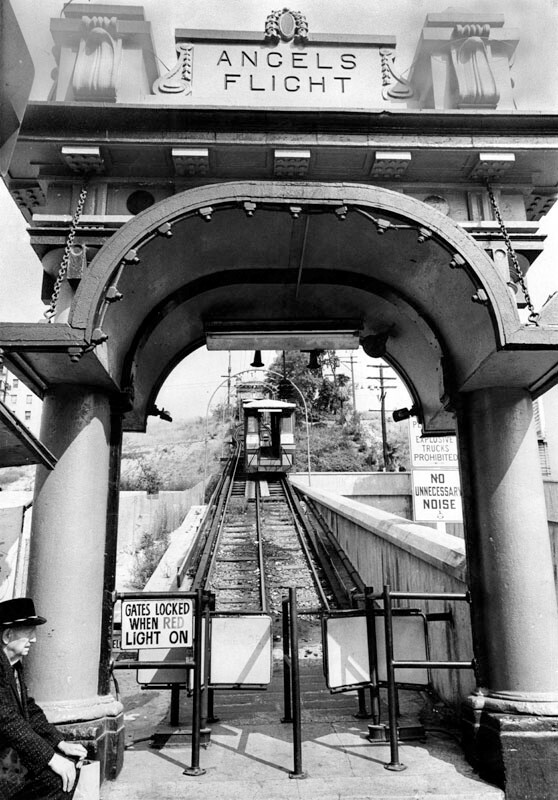 (1957)^ - Angels Flight cable cars as seen from the concrete stairway on the other side of the Third Street Tunnel portal. 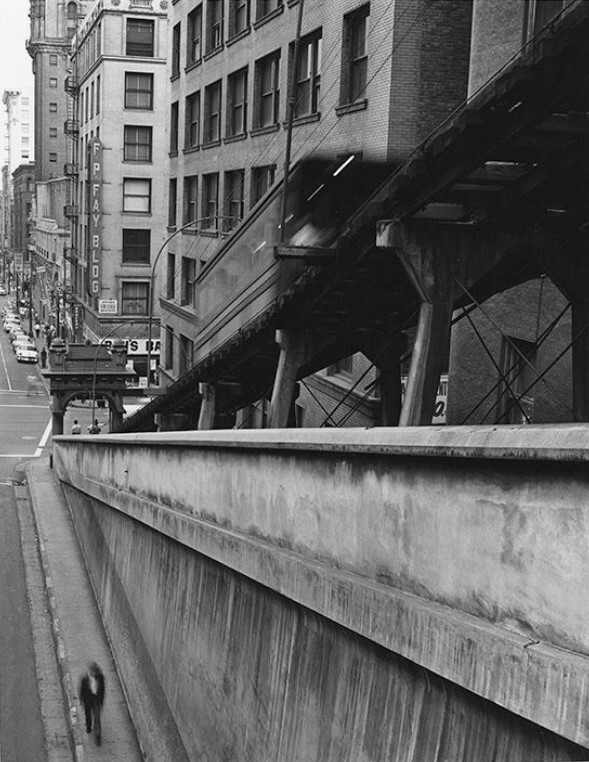 (1955)^ – View looking down from the top of the Third Street Tunnel with Angels Flight seen on the right. (ca. 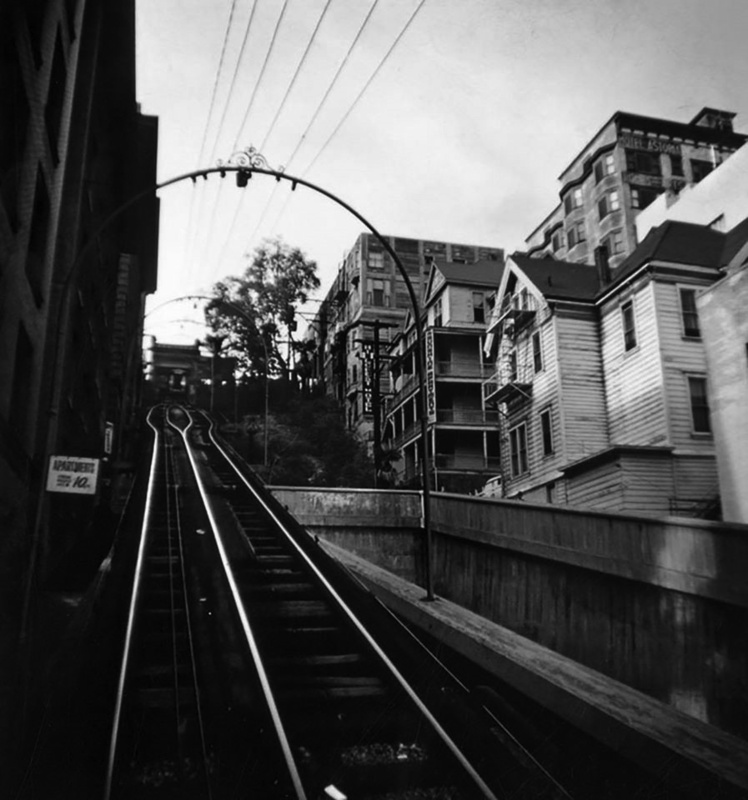 1955)**^* - A man carrying a bag is seen climbing up the stairs alongside Angels Flight. (ca. 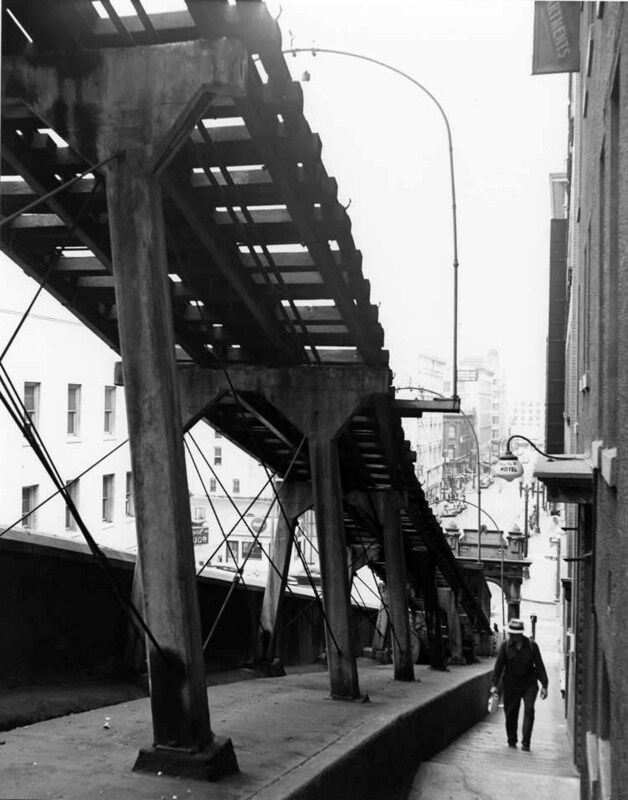 1960)**^* - View of the underside of Angels Flight, looking west from just east of Clay Street. A woman and a little girl can be seen walking south on Clay. (ca. 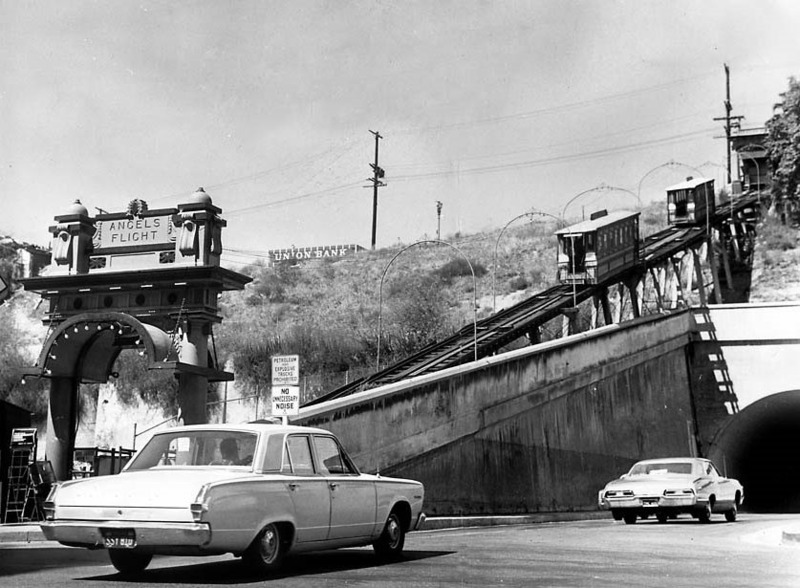 1960)**^* - Dump truck passes underneath Angels Flight cars as they pass each other. 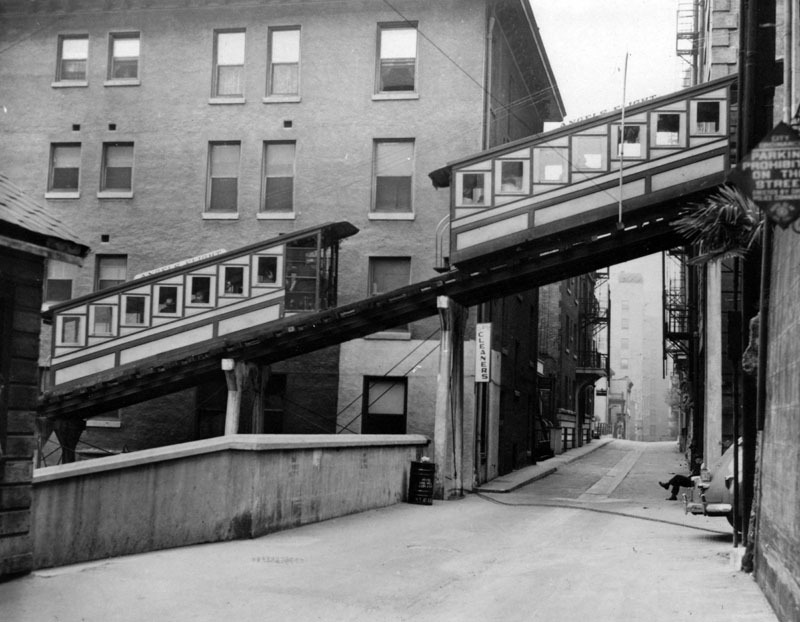 (1955)*^^ - A rundown boarding house provides the backdrop to an Angels Flight car as it climbs Bunker Hill. 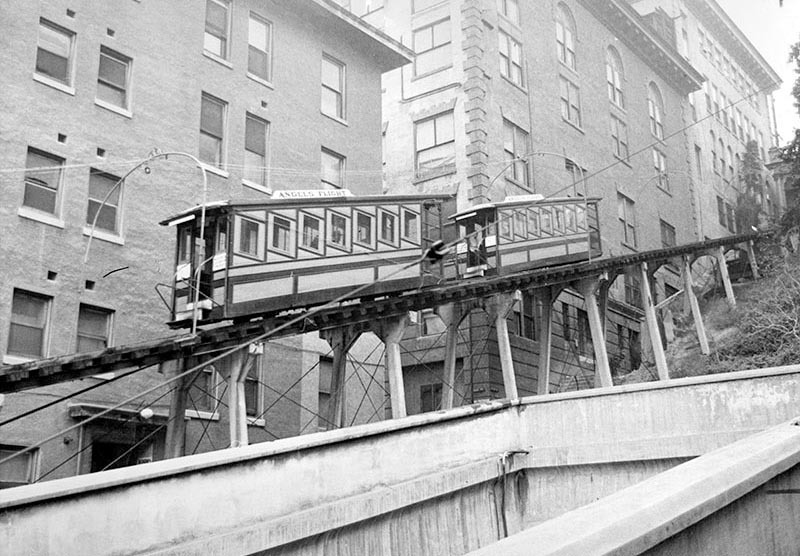 (1955)^^ - Angels Flight as it crosses Clay Street. A man in a suit is seen leaning against a building (Hotel Central). 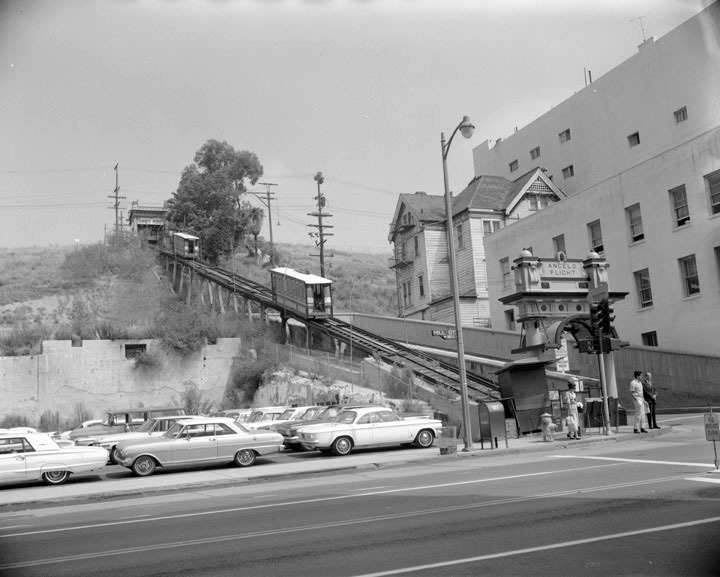 (1962)^ - View looking up towards the top of Angels Flight with 3rd Street Tunnel entrance to the right. 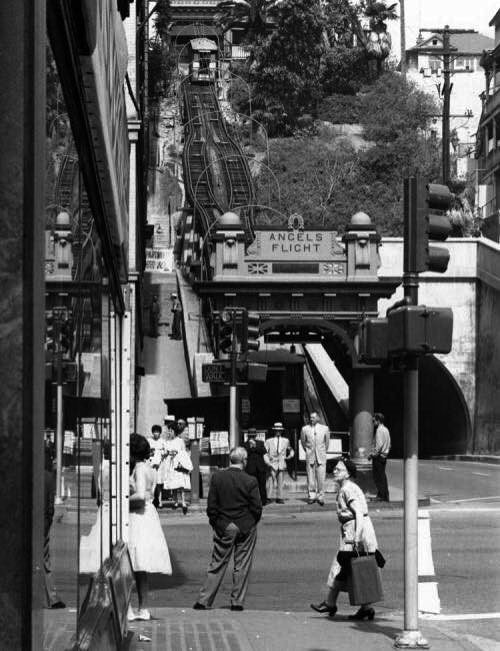 (1962)^ – View of Angels Flight with the eastern portal to the Third Street Tunnel in the foreground. 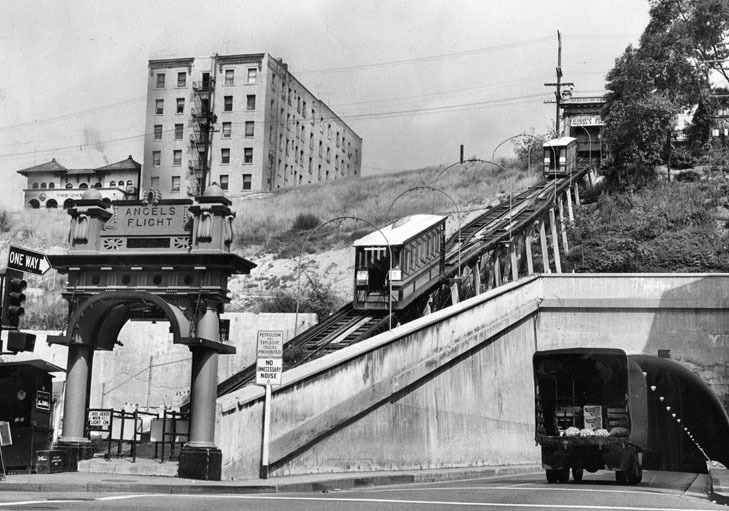 (1962)^^ - Bunker Hill buildings are demolished as Angels Flight continues to scale the hillside in 1962. 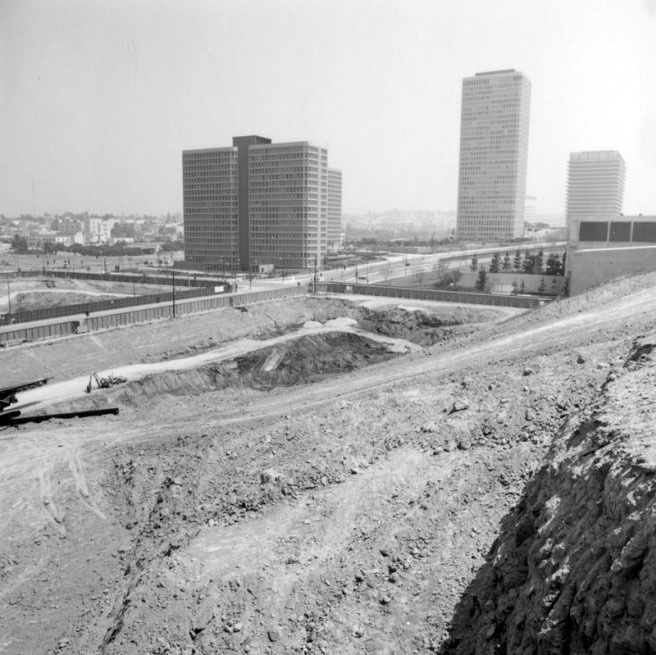 (1963)**^* - A mound of dirt sits adjacent to Angels Flight where a building once stood. (ca. 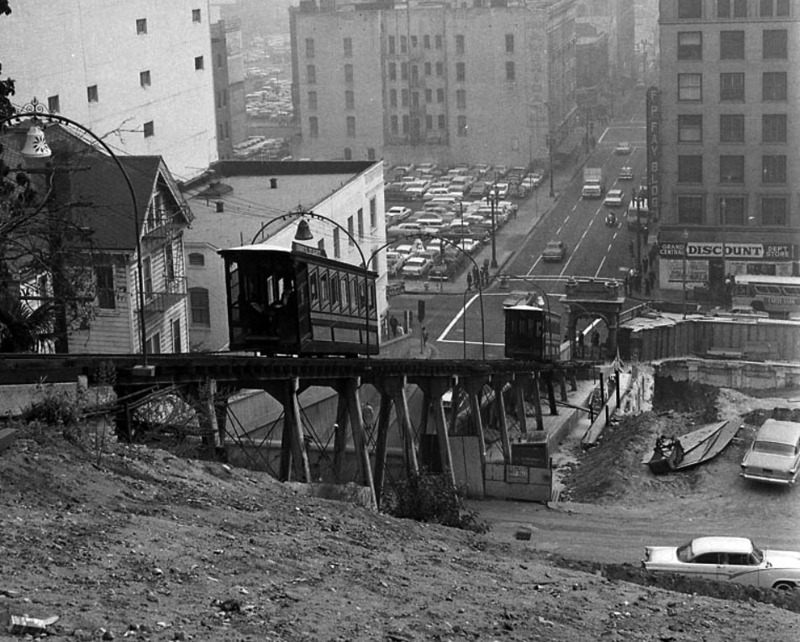 1965)^^ – View looking down toward the intersection of 3rd and Hill streets showing Angels Flight ferrying passengers up and down Bunker Hill. All the buildings that once stood on the right have now been demolished. 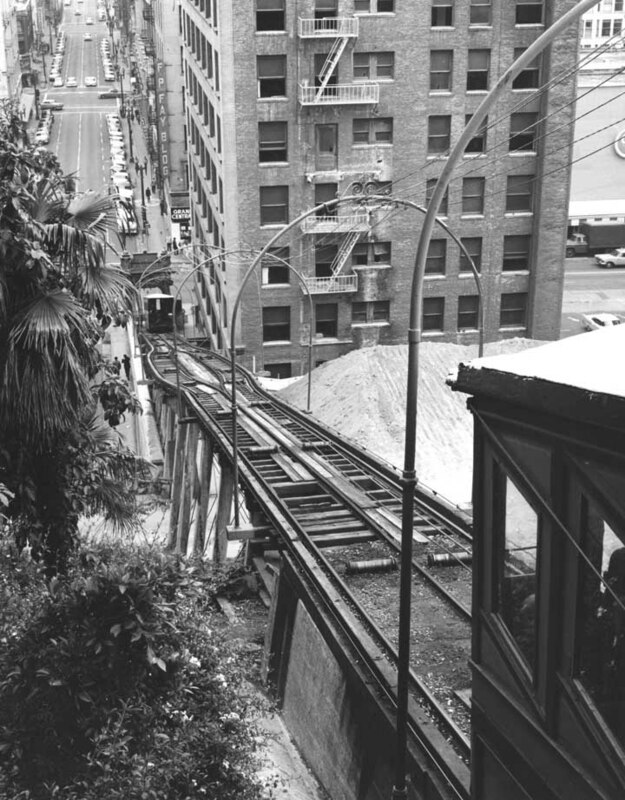 (1965)^ - View of Angels Flight from a corner at Hill and Third Streets, showing the 33-degree tracks. Most of the old buildings on both sides have been razed as part of the Bunker Hill redevelopment program. At right is the Third Street Tunnel. 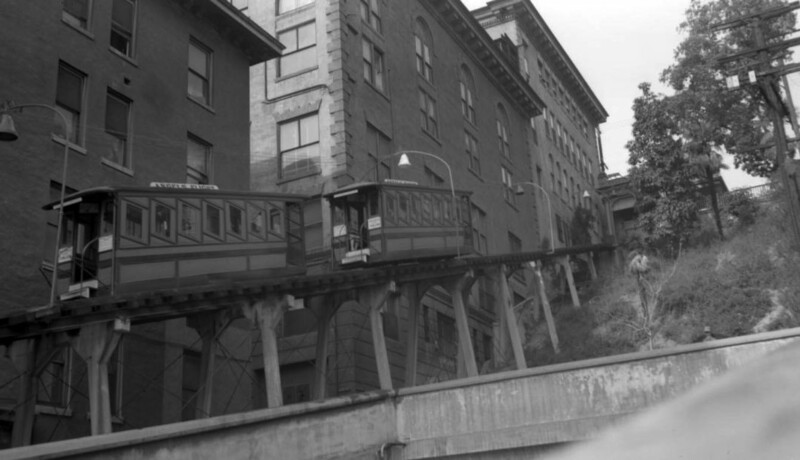 (1966)* - View of Angels Flight during one of its last years of operation. Most of the buildings on the hill have been demolished to make room for progress. 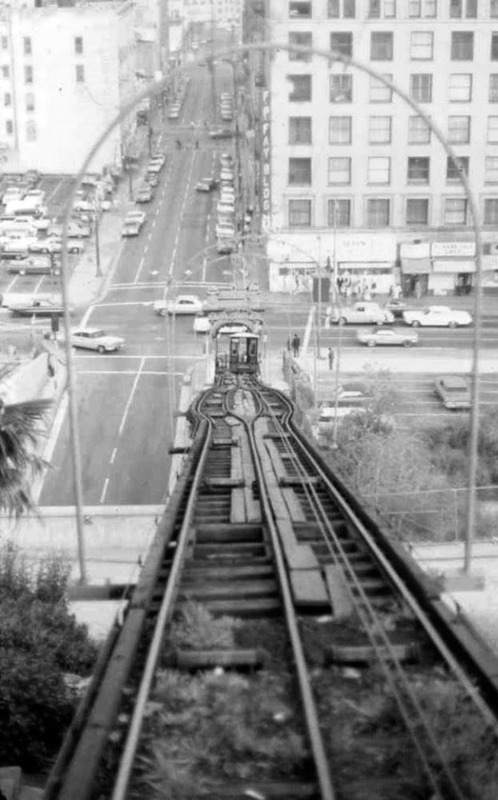 (1967)^.^ – View showing Angels Flight with the very top of the 42-story Union Bank Building seen in the distance. 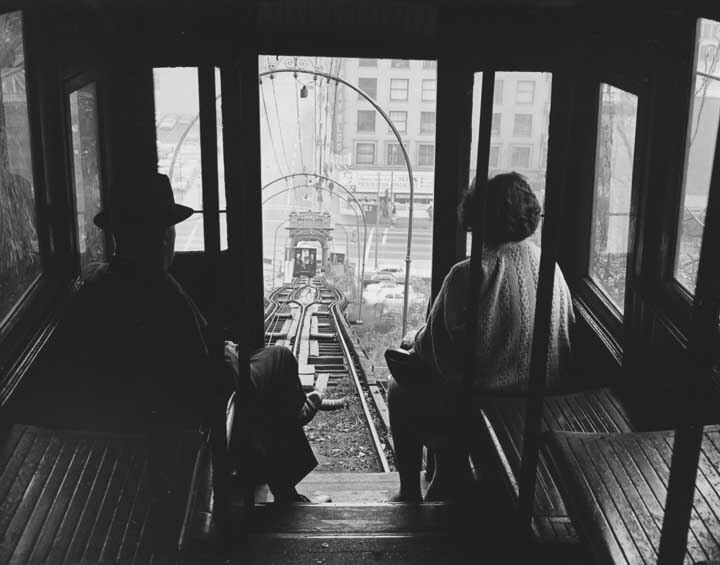 (1967)**# - Passengers looking out the Angels Flight doorway as it appears to be heading down the hill. (1969)^.^ - Looking down toward the intersection of 3rd and Hill streets. (ca. 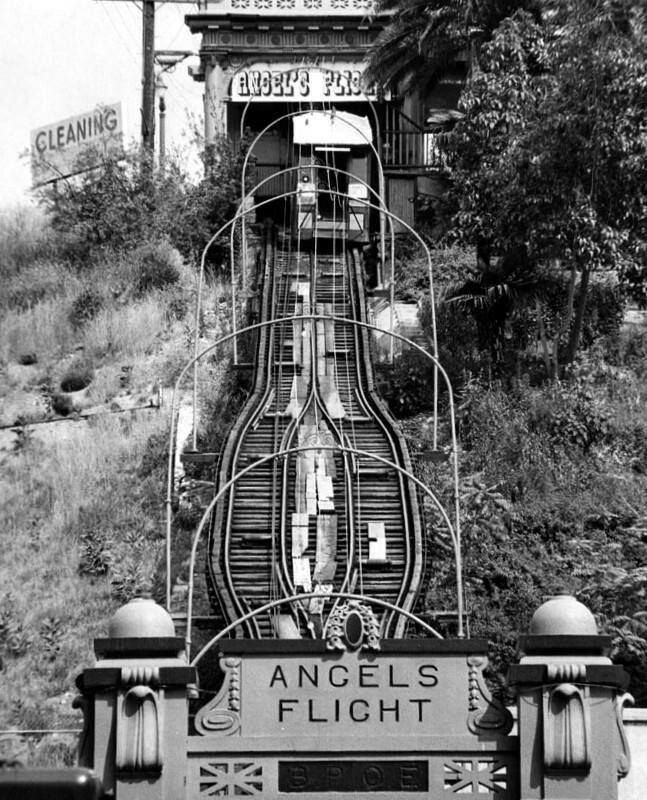 1969)^^** - View of Angels Flight shortly before it was shut down and dismantled. 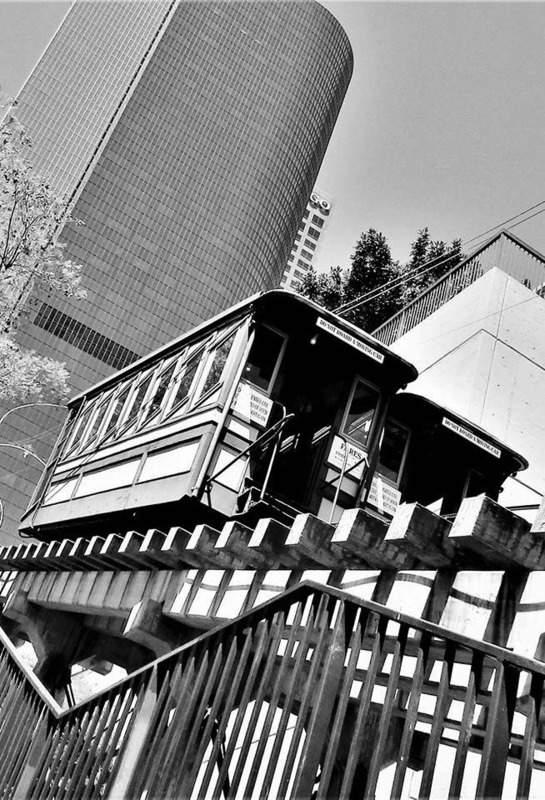 (2010)#^^ - View of Angels Flight at its new location at the California Plaza, 351 S. Hill Street (lower station). 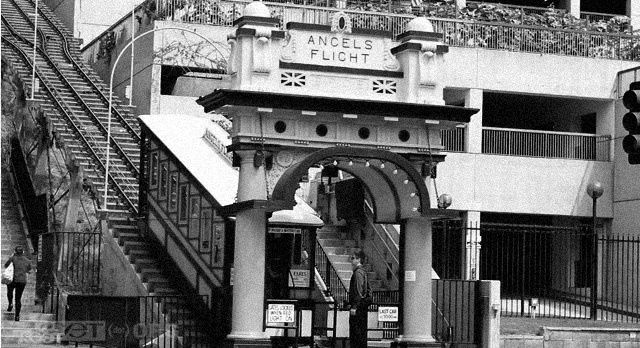 (2017)^.^ - Angels Flight at its new location: - The Railway’s Top Station is located at California Plaza, 350 South Grand Avenue. The Lower Station is located at 351 South Hill Street, across from Grand Central Market. 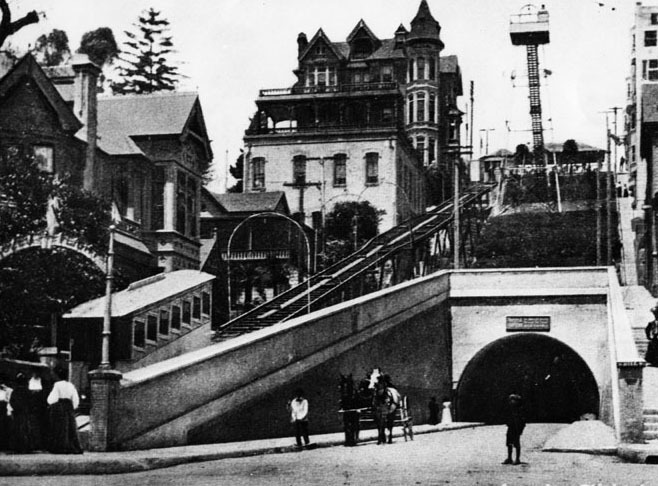 Angels Flight Railway was designated Los Angeles Historic-Cultural Monument No. 4 on August 6, 1962. It was also added to the National Register of Historic Places on October 13, 2000. 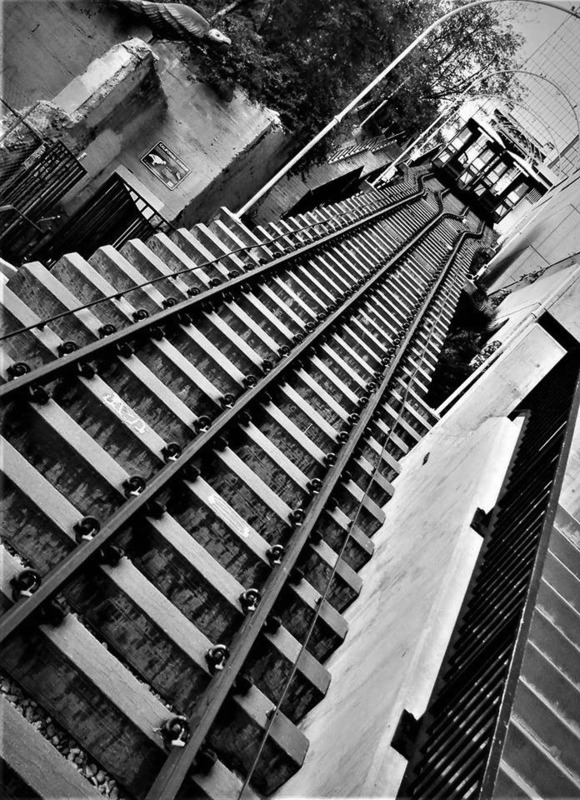 (2019)^.^ - View looking up Angels Flight as the two rail cars pass each other. 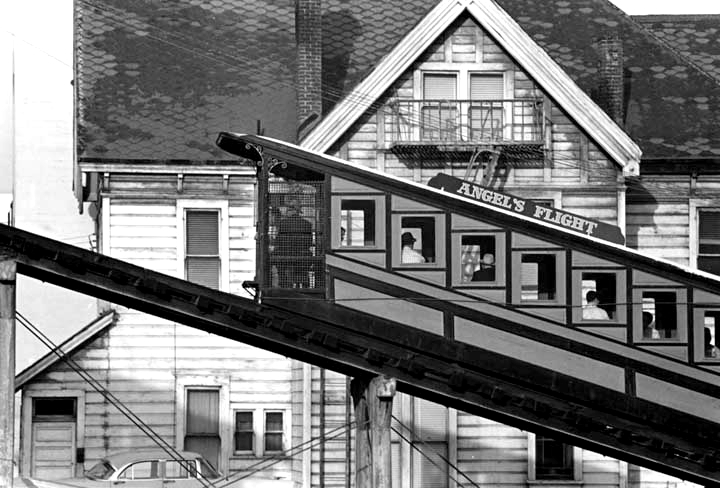 Angels Flight Railway is open daily, seven days a week, 365 days a year, including holidays, from 6:45 in the morning until 10:00 at night. The fare (2018) is $1.00 each way, and you can purchase a souvenir round-trip ticket for $2.00 to take a piece of history home with you. (ca. 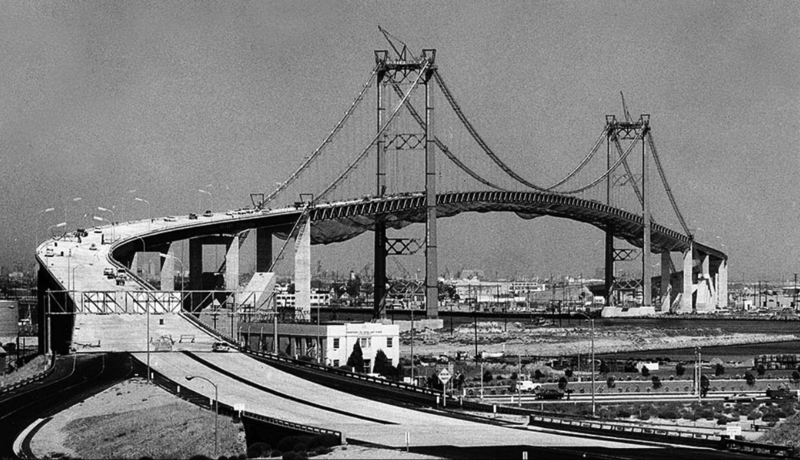 1960)##*^ - View of the Vincent Thomas Bridge in San Pedro during its construction. It is the fourth largest suspension bridge in the State of California. (ca. 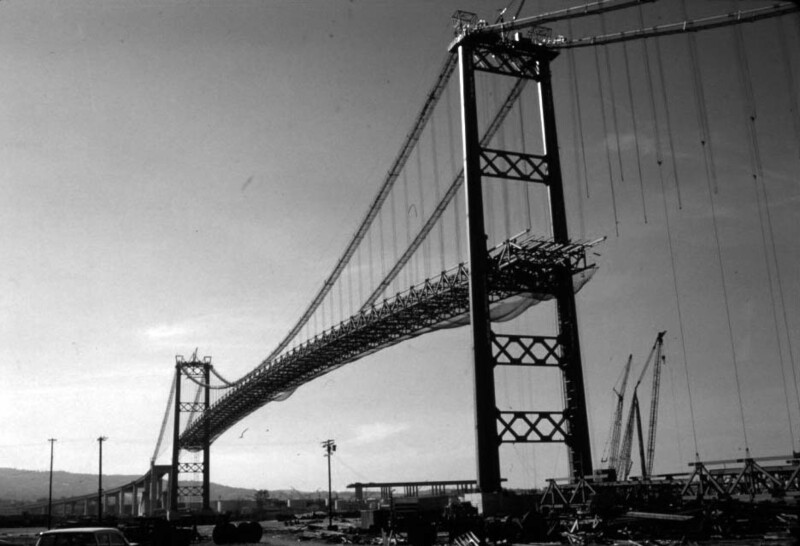 1963)**^ - View of the Vincent Thomas Bridge showing its longest span nearly completed. 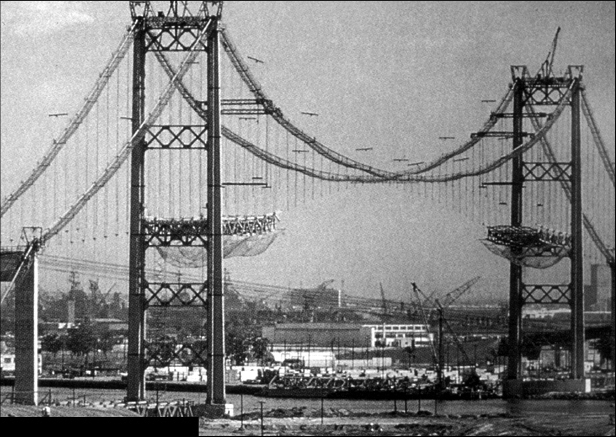 Construction of the bridge required: 92,000 tons of Portland cement; 13,000 tons of lightweight concrete; 14,100 tons of steel; and 1,270 tons of suspension cable. 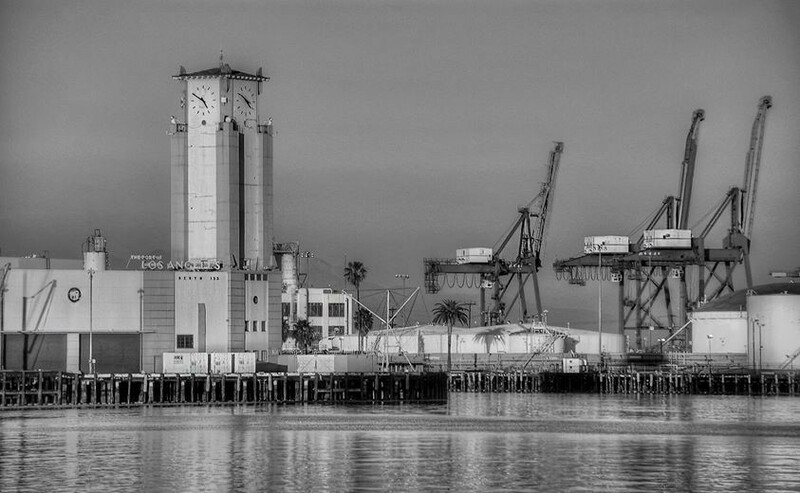 (1963)^^ - The Vincent Thomas Bridge nears completion between San Pedro and Terminal Island. (1963)*^^^^ - Panoramic view showing "The Islander" ferry in its last days of service with the nearly completed Vincent Thomas Bridge in the background. (ca. 1964)**^^^ - One of the world’s largest car carriers at the time, Volkswagen ship Johann Schulte, arrives at the Port of Los Angeles. 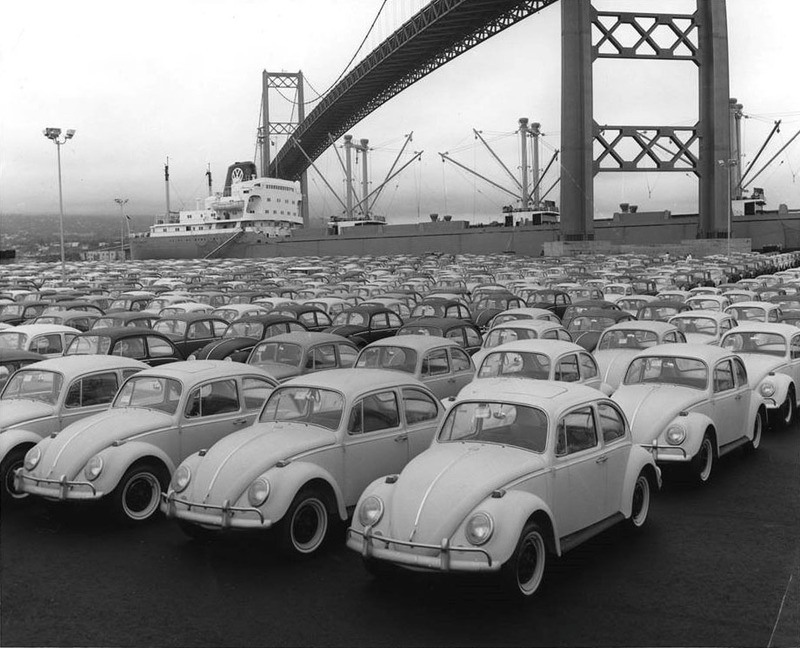 View shows 100s of VW Beetles, all lined up and waiting for transport to dealerships. The newly opened Vincent Thomas Bridge stands tall in the background. 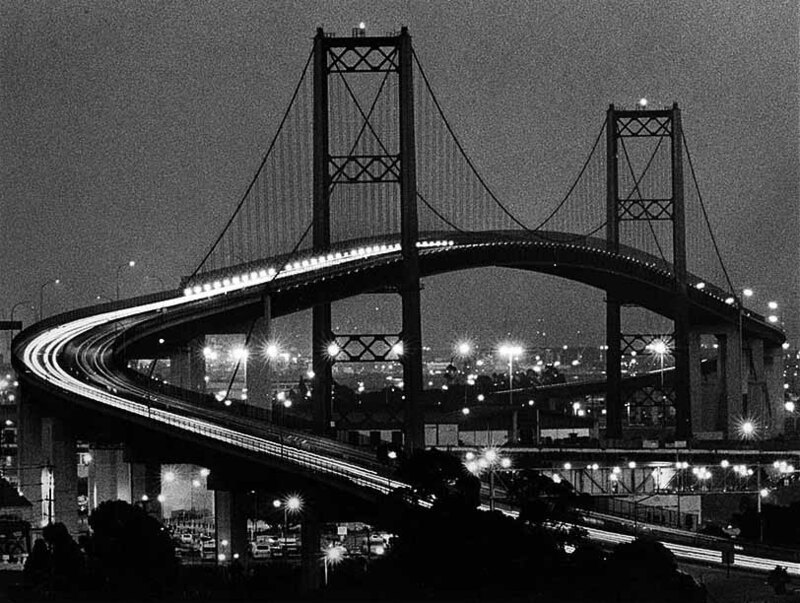 (1988)^^ - Traffic streams across the Vincent Thomas Bridge at dusk. (ca. 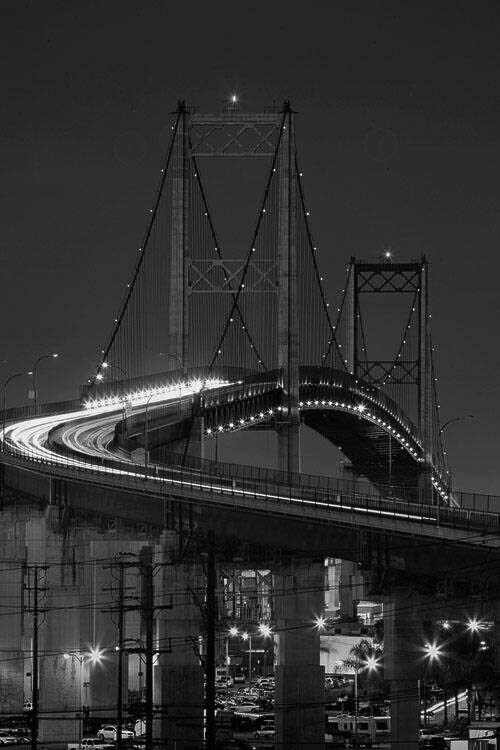 2010s)##^# – Night view showing the Vincent Thomas Bridge. 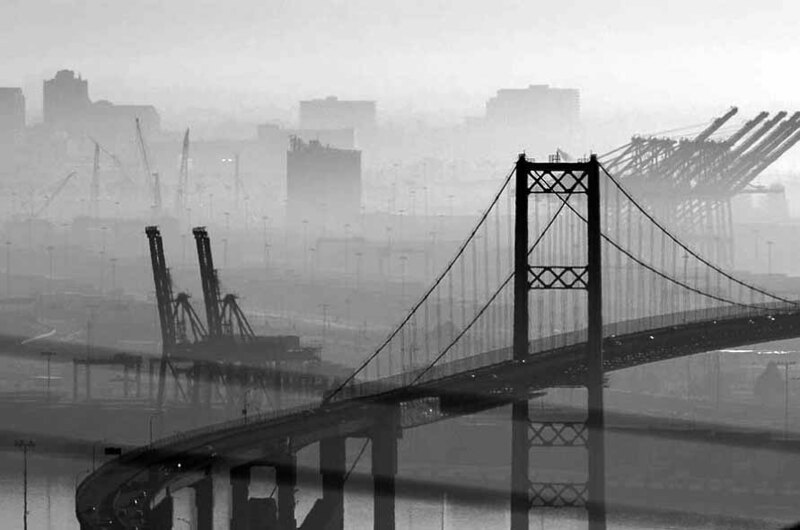 (2013)^^ - Vincent Thomas Bridge on a foggy morning from West Santa Cruz Street, Rancho Palos Verdes. 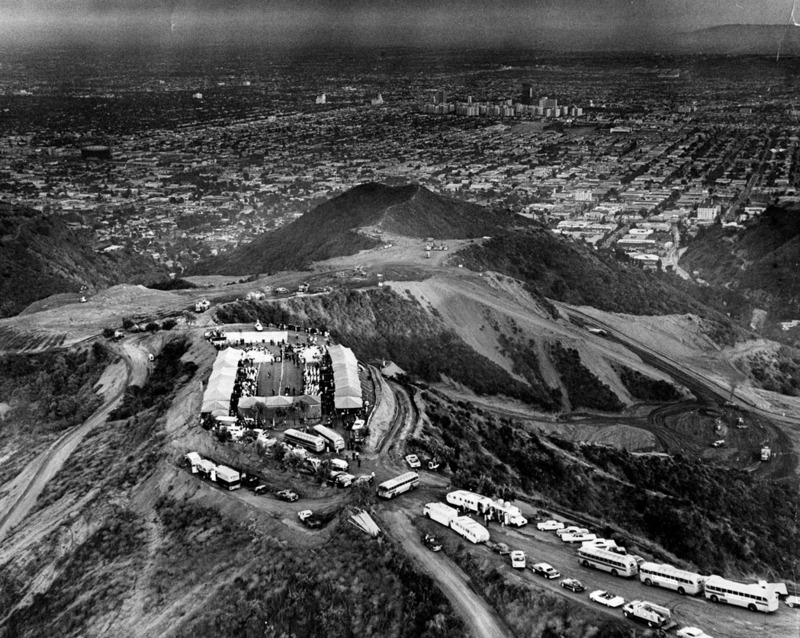 (1963)^ - Aerial view of Mount Olympus as the first of 2500 guests arrive at the hilltop "house warming party" for the 300-acre development of $150,000 homes 1500 feet above sea level near Laurel Canyon Blvd. and Mulholland Drive. View is toward the southeast. Group of buildings at top right are the Park La Brea Towers. (1964)^ - Aerial view showing Mount Olympus grading in preparation for the construction of housing. The city lies beyond, looking southeast. 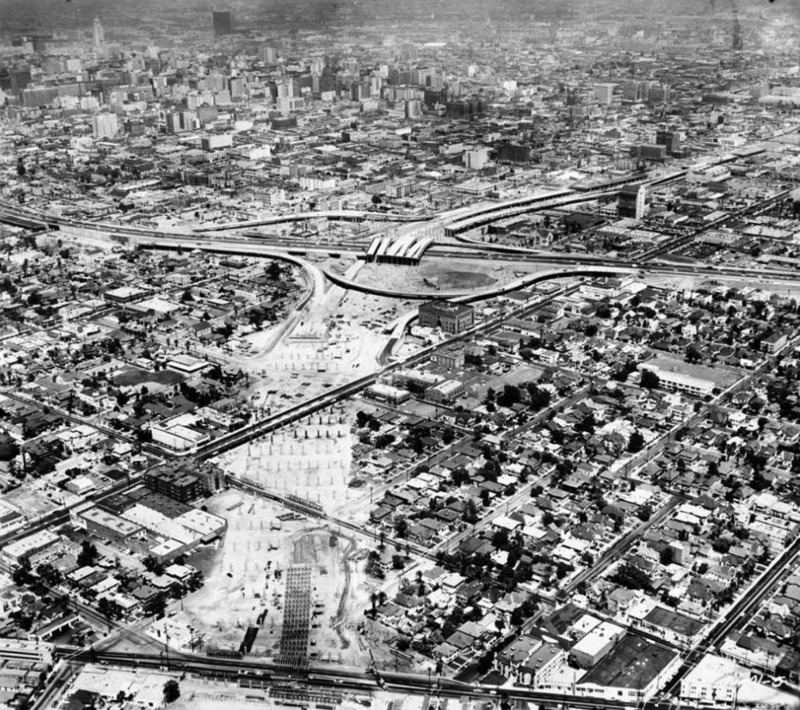 (1962)##^# - Aerial view showing the Santa Monica Freeway under construction near the Harbor Freeway with downtown Los Angeles in the background. 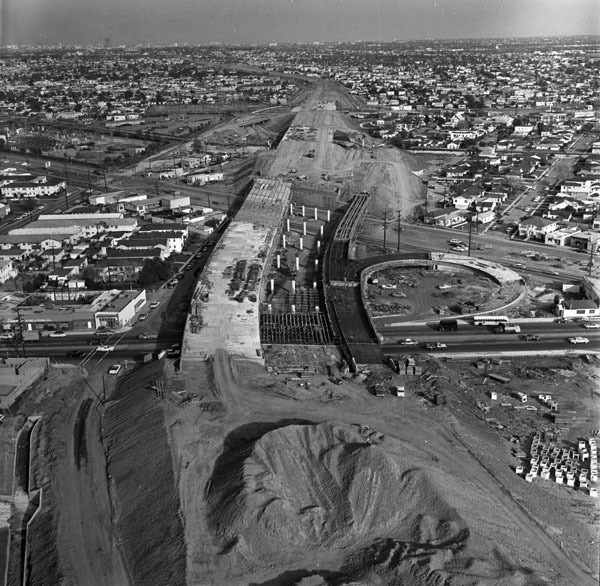 (1964)^^^* – View looking west showing the Santa Monica Freeway under construction at La Cienega and Venice boulevards. 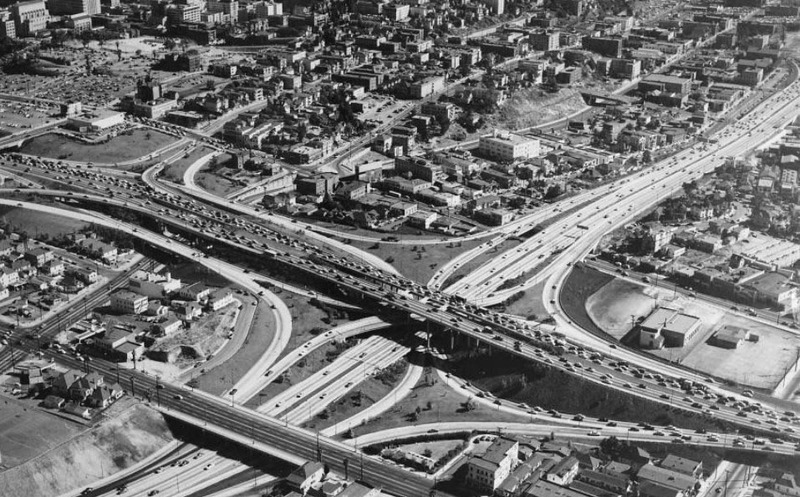 Local opposition immediately coalesced against the Santa Monica Freeway when state highway planners announced a major part of its route in August 1955. The entire route -- known originally as the Olympic Freeway -- would span 16.6 miles between the East L.A. Interchange in Boyle Heights and Pacific Coast Highway in Santa Monica, barreling through quiet bedroom communities on its path to the sea. (ca. 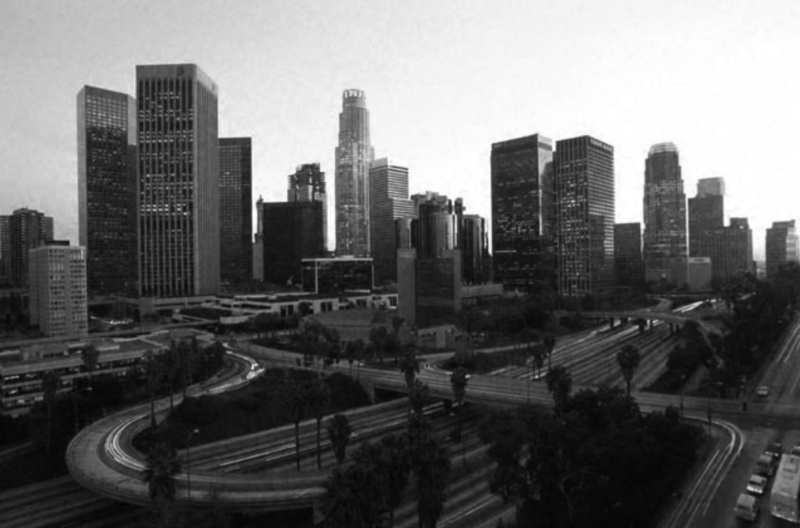 1965)*# - Aerial view of downtown Los Angeles taken from just above the Santa Monica and Harbor Freeway interchange. (1980)^^ – Aerial view of the intersection of the Harbor (110) and Santa Monica (10) freeways just southwest of downtown Los Angeles. 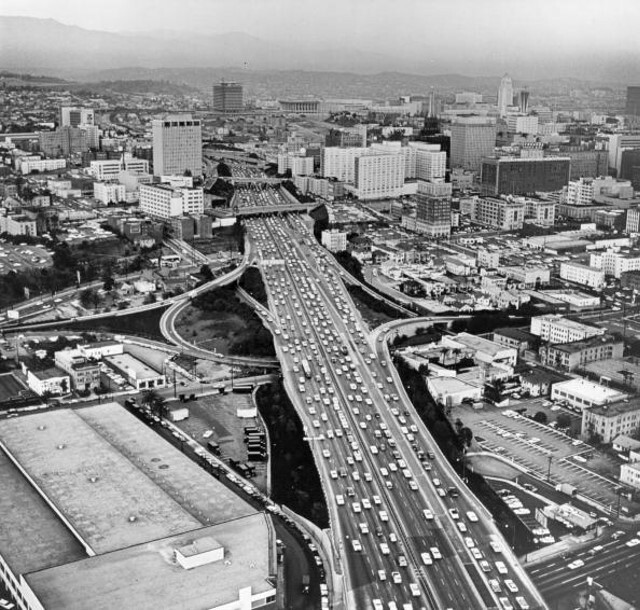 (1969)*##^ – View looking north showing the Harbor Freeway running through downtown Los Angeles. In the distance can be seen the new Department of Water and Power Building, Music Center, and City Hall. (1962)^ - Nighttime view of Los Angeles and City Hall, looking southwest from the San Bernardino Freeway. A billboard for the French restaurant "Taix" and "The TIMES" up in lights on the top of a building appear in the background. 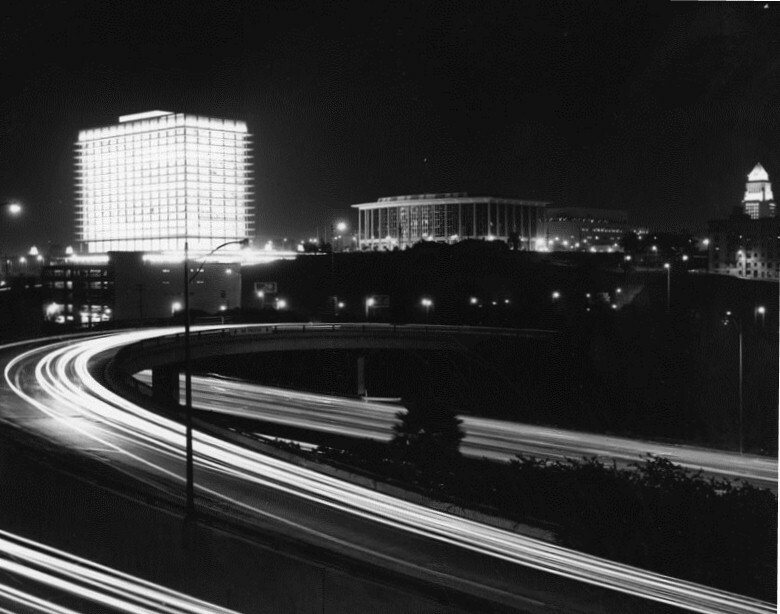 (1965)^ - Civic center buildings at night; left to right, the Department of Water and Power Building, Music Center and City Hall, seen from across the Harbor Freeway. (ca. 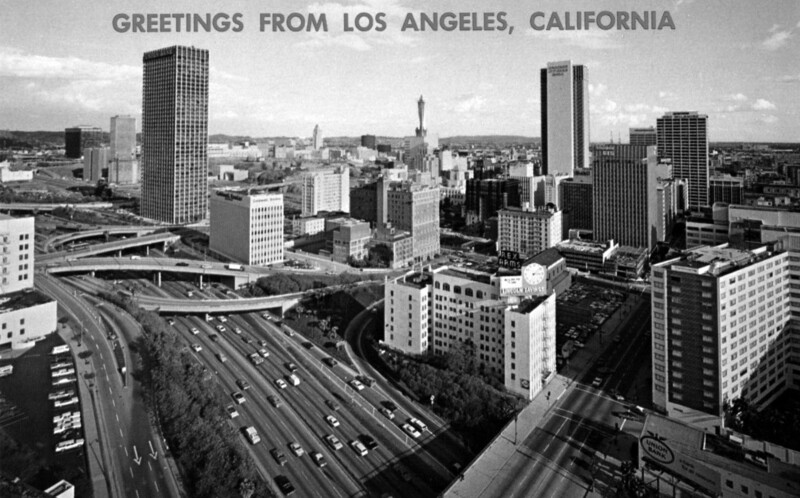 1970)**#**- Panoramic postcard view looking east from Beaudry Avenue toward the 110 Freeway, showing the Los Angeles Department of Water and Power GOB, Dorothy Chandler Pavilion, and Los Angeles City Hall. 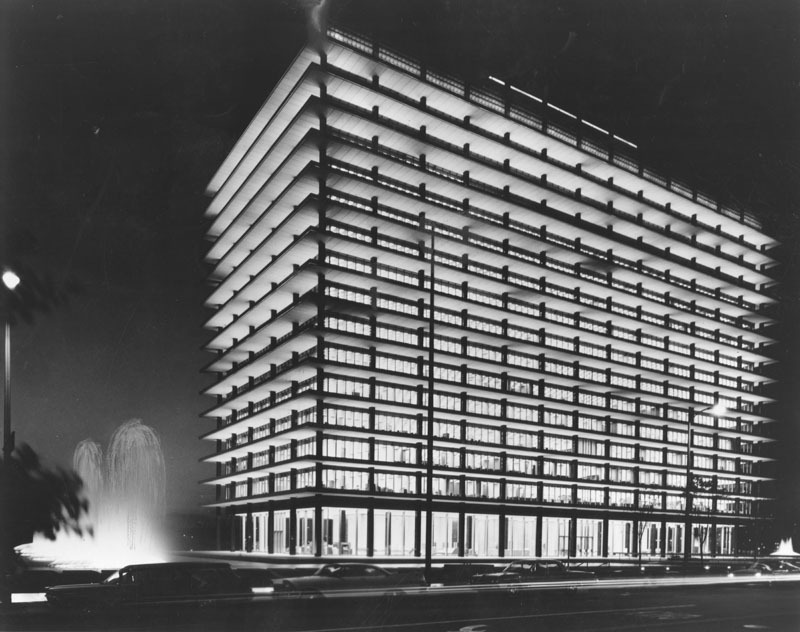 (1966)^ - Night view of a well lit Department of Water and Power building, including fountains, as seen from the Dorothy Chandler Pavillion across the street. Click HERE to see more in Construction of the DWP Building. 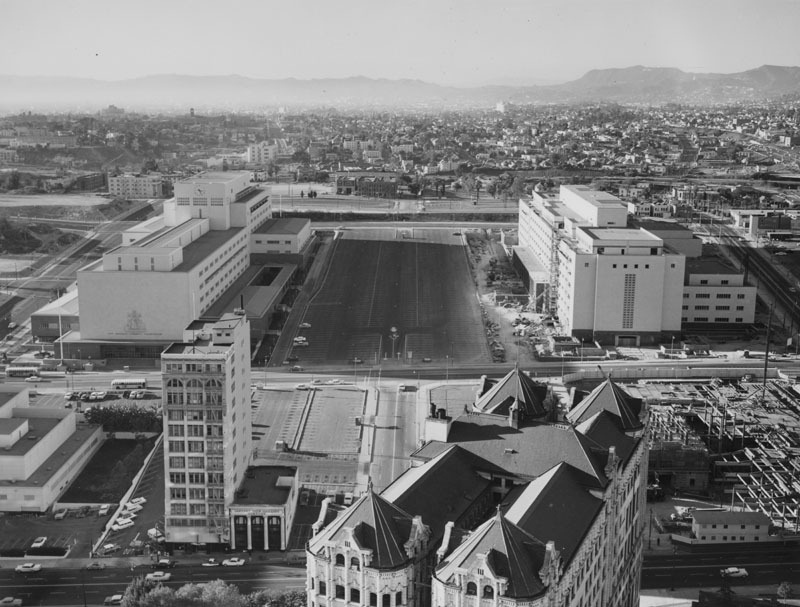 (1967)* - View of Department of Water and Power Building (GOB) on the left and Dorothy Chandler Music Center on the right from a parking lot across First Street. 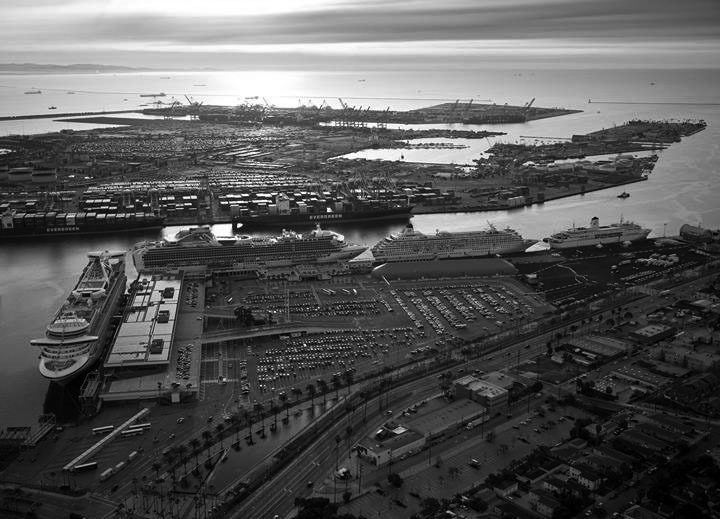 The parking lot in the above photo is where the Walt Disney Concert Hall stands today (opened 2003). (ca. 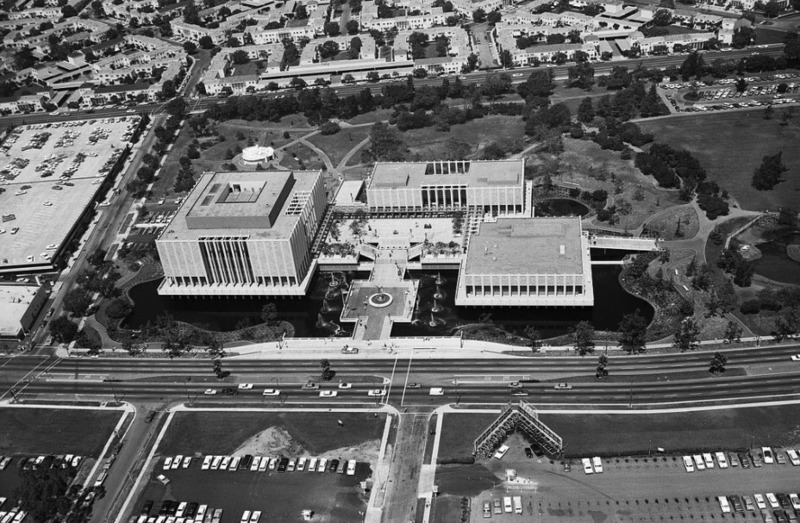 1967)^ - An aerial shot of the Music Center and the Department of Water and Power Building. (1967)*# - Aerial view looking east toward City Hall from directly above the Department of Water and Power Building. 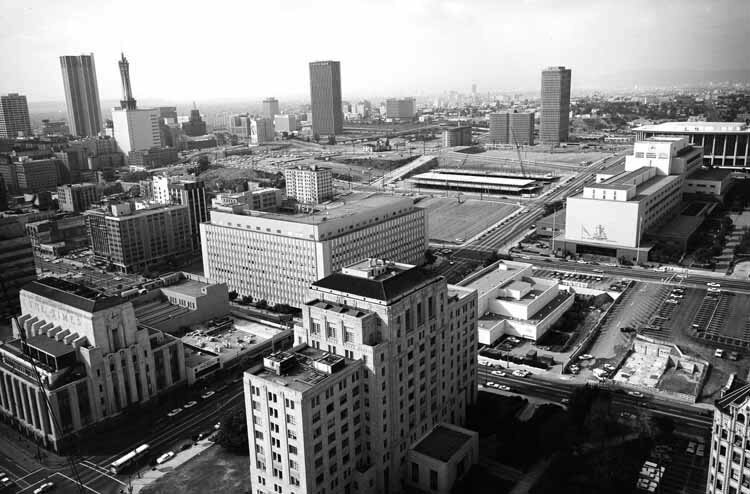 (1968)*#- Aerial view looking toward LADWP's General Office Building (GOB) with the Los Angeles Civic Center in the background. 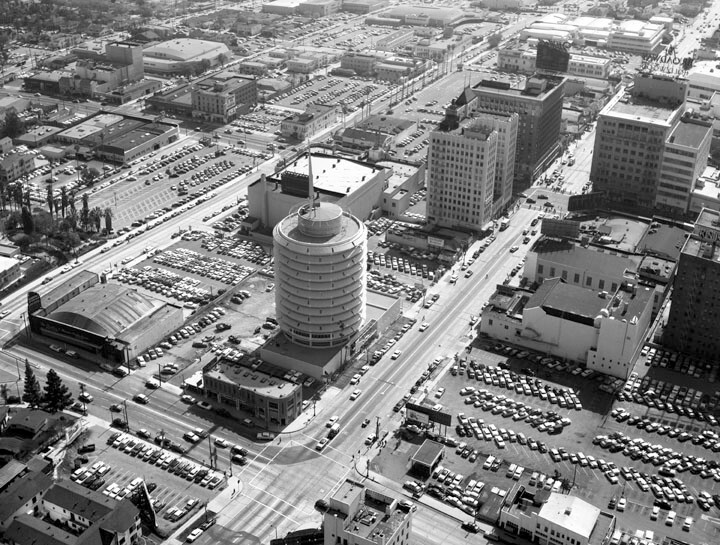 (1959)^ – Aerial view looking east over the intersection of Wilshire and Fairfax, where the Miracle Mile begins. May Company (built in 1939) can be seen on the northeast corner. Across the street (SE corner) would be built Seibu Department Store (1962-64) and later converted to Ohrbach’s Department Store (1964-86), and Peterson Automotive Museum (1994 – Present). 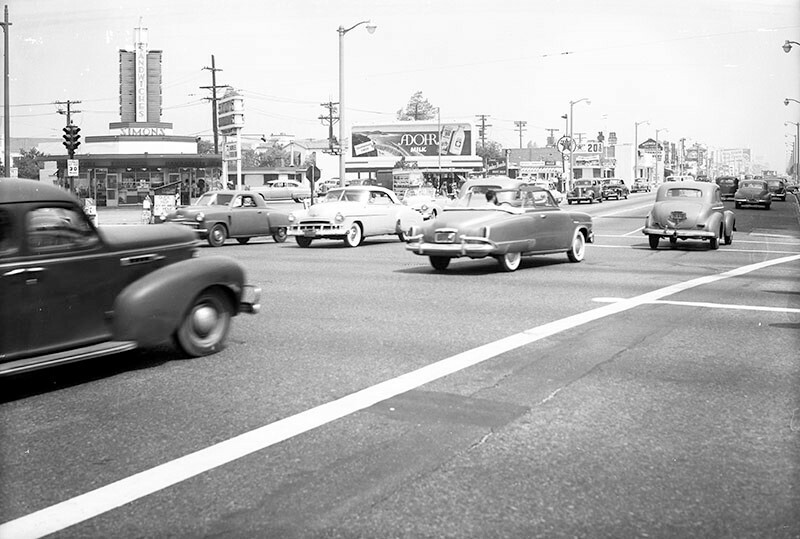 (1950)^ - Looking northwest across the intersection of Fairfax Avenue and Wilshire Boulevard, showing a Simon's Drive-in restaurant on the northwest corner. Next door, to the right, is a Foster and Kleiser billboard promoting Adohr milk. In the 1930s, Wayne McAllister, the originator of the circular drive-in, designed circular Simon's Drive-in Restaurants in the Streamline Moderne style with a three-layer roof and neon advertising pylon; this style was copied throughout the country. Click HERE to see more Early LA Drive-in Restaurants. Since 1955, a Googie-style structure, occupied by Romeo's Times Square and later Johnie's Coffee Shop, has been present on the northwest corner seen here. 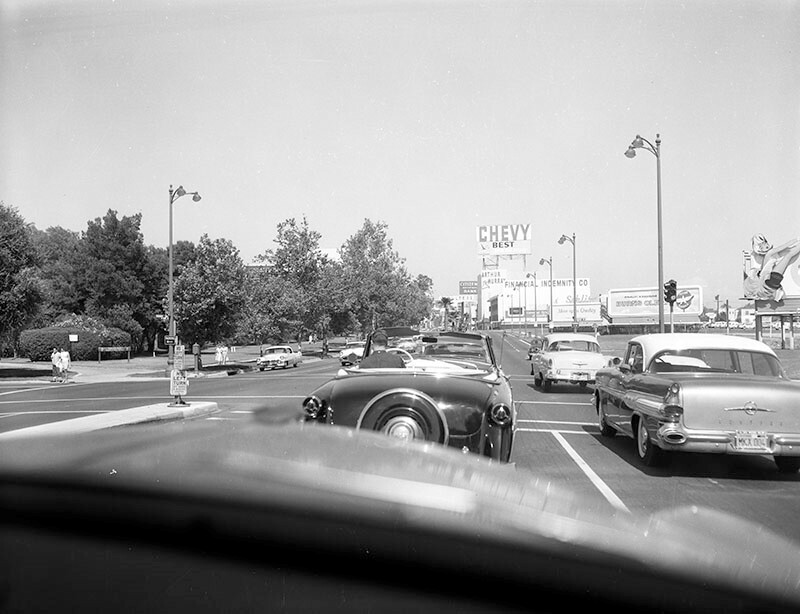 (1959)^ – Dashboard view looking east down Wilshire Boulevard from just west of where it crosses Ogden Drive (center). Hancock Park and the La Brea Tar Pits are on the left. Office buildings, including one for Financial Indemnity Company, are seen right of center and various billboards are seen on the right. 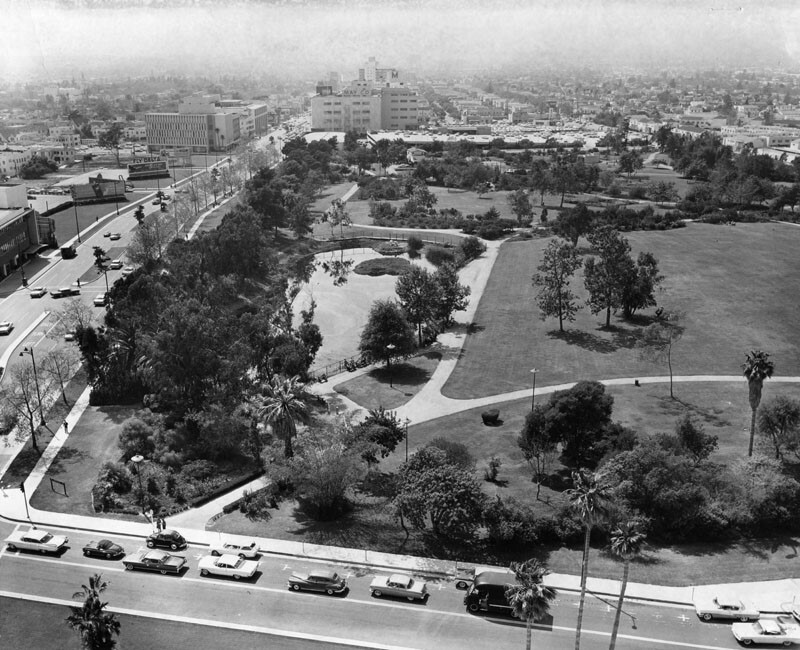 In 1965, just a few years after the above photo was taken, a new facility for the Los Angeles County Museum of Art (LACMA) opened in the section of Hancock Park seen on the left. 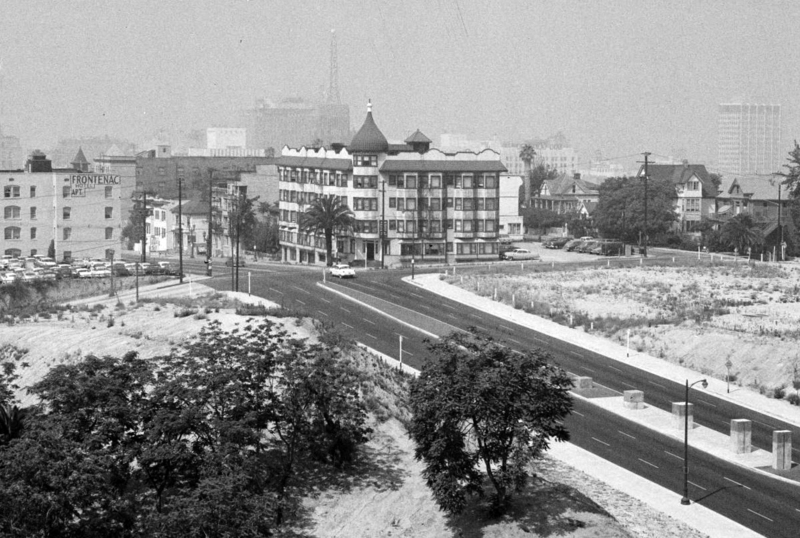 (1959)^ - Looking east on Wilshire Boulevard from just east of Spaulding Avenue. Hancock Park, home of the La Brea Tar Pits, is on the left. Office buildings, including one for Financial Indemnity Company, and a Foster and Kleiser Cadillac billboard are seen on the right. 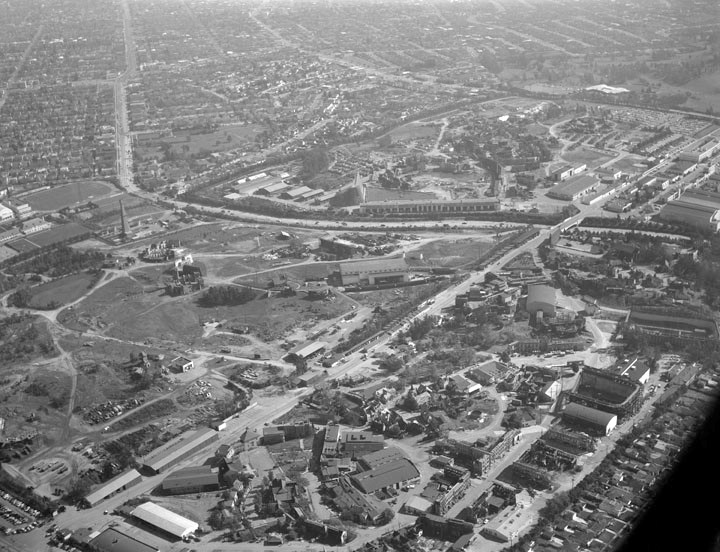 (1962)^ - Panoramic view of the La Brea Tar Pits and the La Brea Park looking west as seen from above Curson Avenue and Wilshire Boulevard. Spectators lean against the fence as they look at the tar pit. In the background, center, is the May Company Department Store. A billboard on Wilshire exhorts viewers to "Fly Delta." Click HERE to see more early views of the La Brea Tar Pits. (ca. 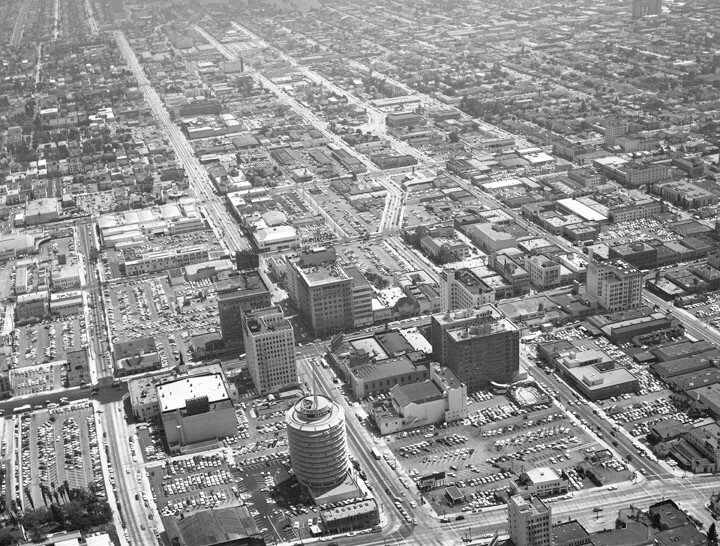 1965)^ - Aerial view looking east showing the Miracle Mile (Wilshire Blvd.) with the LA County Museum of Art and the La Brea Tar Pits seen in the foreground. (ca. 1965)^ - Aerial view of the Los Angeles County Museum of Art. In the background are the Park La Brea Towers appartments. The La Brea Tar Pits can be seen to the right of the museum. 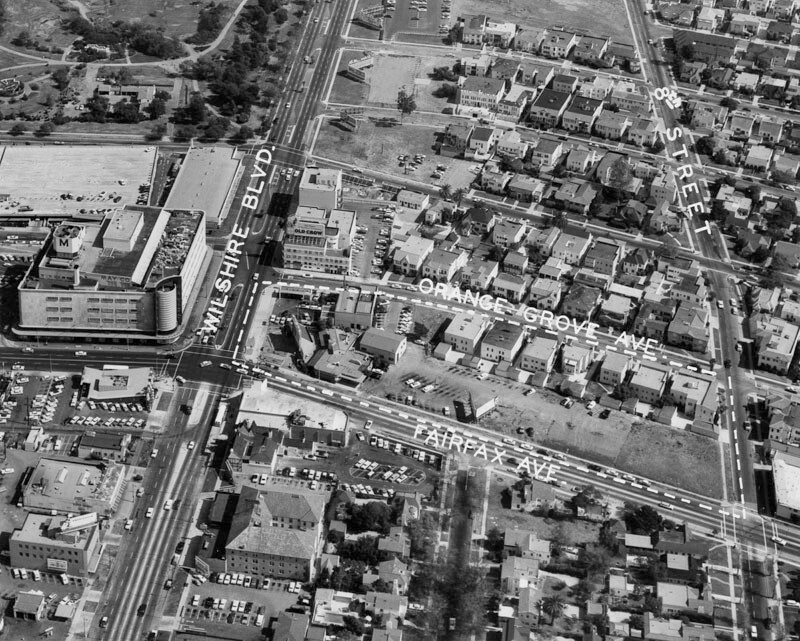 The museum was built in 1964 at Wilshire & Genesee (lower center-left). 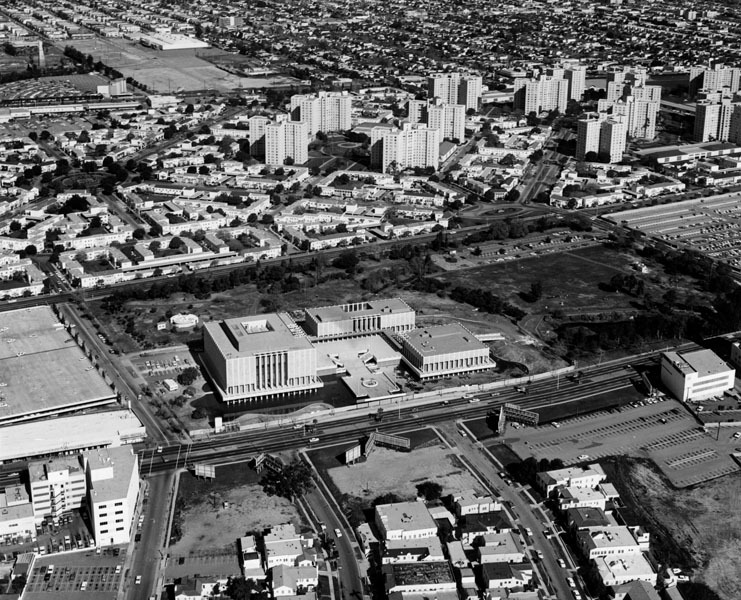 (1965)^#^^ – Aerial view looking north showing the Los Angeles County Museum of Art located at 5905 Wilshire Boulevard. On the right is the La Brea Tar Pits. To the left is the parking structure for May Company Department Store. 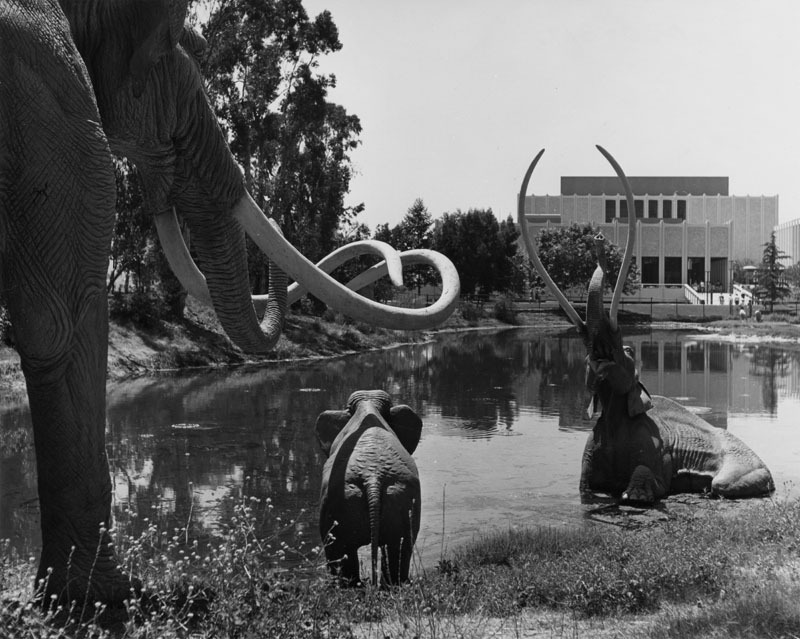 (1968)^ - Three life-sized replicas of giant Imperial Mammoths, sculpted by artist Howard Ball, are shown on the shore at the tar pits adjacent to the Los Angeles County Museum of Art, present in the background. Click HERE to see more early views of the La Brea Tar Pits. 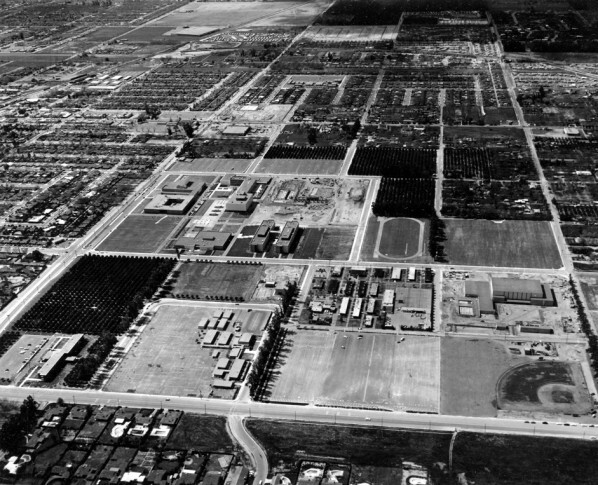 (1956)^ – Aerial view looking southeast showing some of the buildings at Twentieth Century-Fox Film Corporation. Avenue of the Stars runs from bottom left corner to upper right, intersecting with Olympic Boulevard at right. 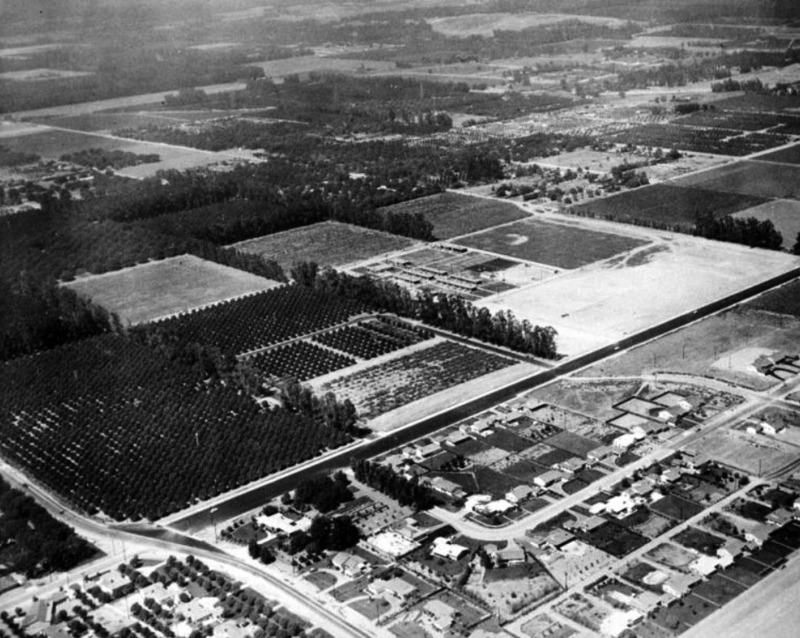 Beverly Hills High School (sports field) can be seen at upper center-left. Before William Fox built his studio here in 1928, the 176-acre site that would one day become Century City was first the personal ranch of movie cowboy legend Tom Mix. At the southern edge of Century City, a small community of office buildings, bungalows and sound stages is all that remains of the once grand and sprawling 20th Century Fox Studios. 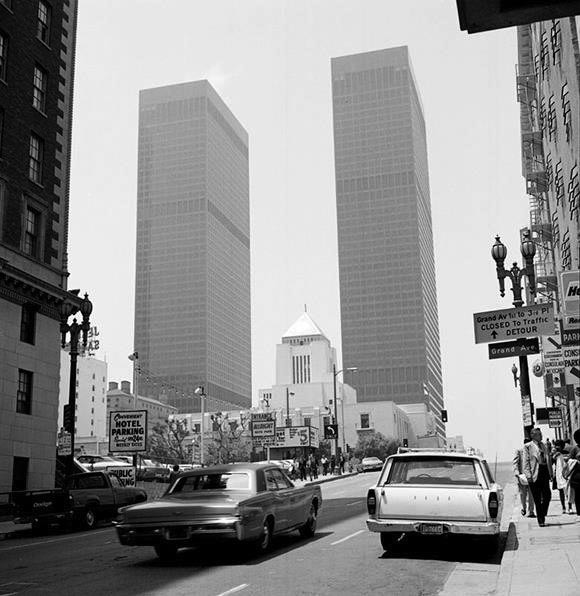 (1969)*##^ - View looking north on Avenue of the Stars with the Century Plaza Hotel on the left. (ca. 1969)##^* – Postcard view of Century City looking northeast. The Century Plaza Hotel stands at center-left. The curved street running down toward the center bottom is Olympic Boulevard and 20th Century Fox Studios is at lower-right. 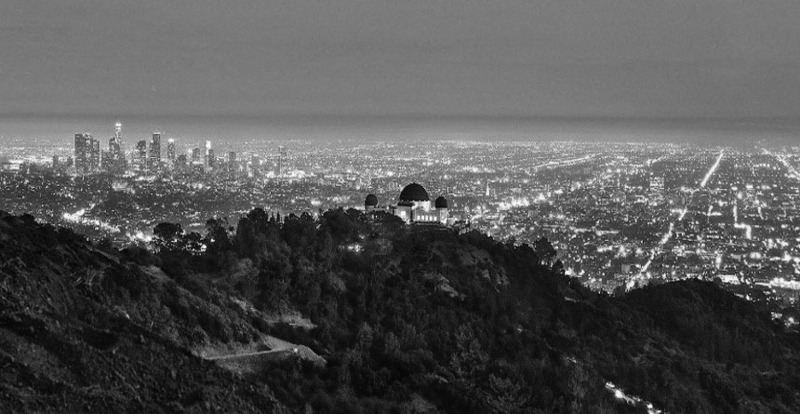 Hollywood can be seen in the far distance (upper-right). 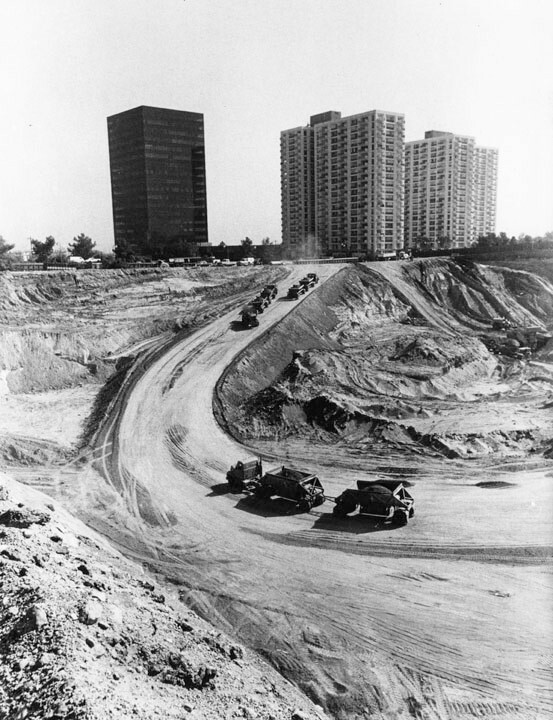 (1969)^ - Photograph caption dated November 17, 1969 reads, "Dump trucks haul a small portion of the dirt away from Century City site. A total of two million cubic yards of dirt will have to be removed to make way for the Entertainment Center." In the background are an office building (left) of the Century City Medical Center and the condominium towers of Century Park East, located at 2160 & 2170 Century Park East and built in 1966. 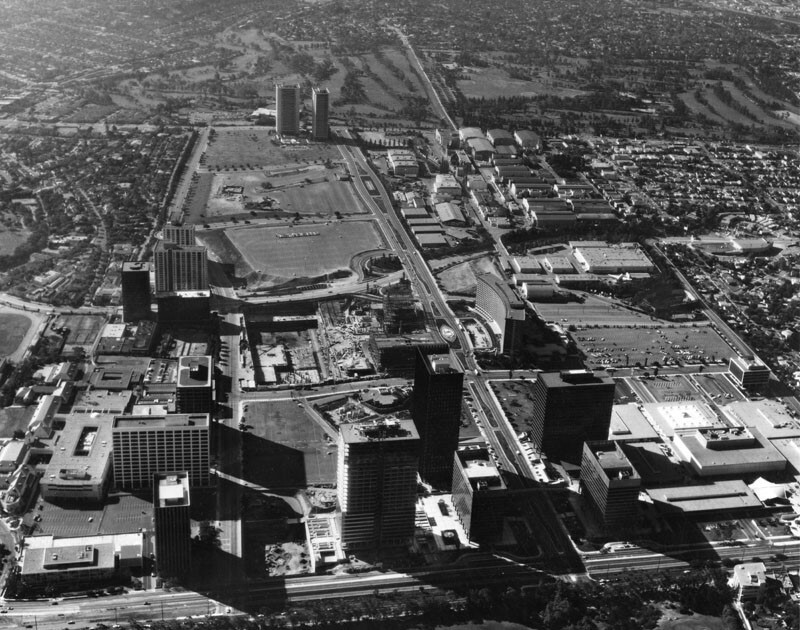 (1971)^ - Aerial view of Century City looking south. In the foreground is Santa Monica Boulevard. In the background is Pico Boulevard, and Avenue of the Stars connects the two. The ABC Entertainment Center is under construction at center, across the street from the Century Plaza Hotel. 20th Century-Fox Film Studio is in the right background. A shopping center (Century Square Shopping Mall) is seen in the lower right-hand corner. Construction began in 1960. Architects: Charles Luckman, Welton Beck, Minoru Yamsaki, et al. Boundaries were: N-Santa Monica Blvd. ; S-Olympic Blvd. ; E-Century Park-East ; W-Century Park-West. 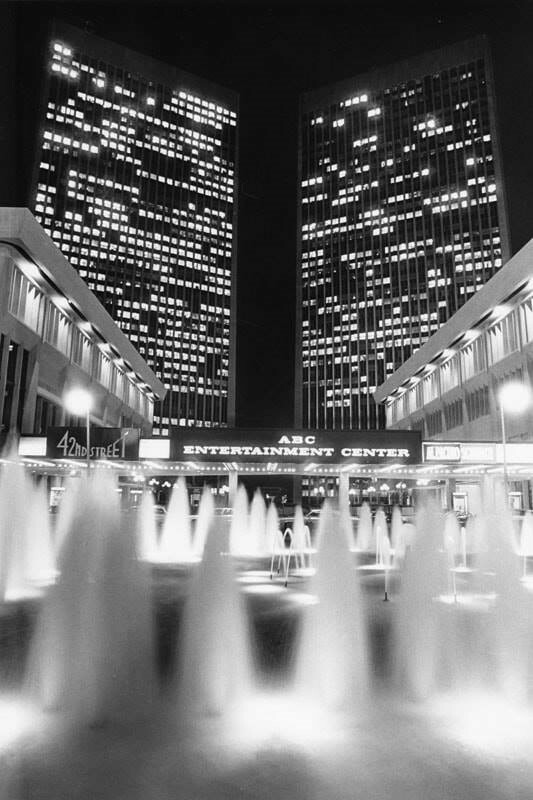 (1980)^**# – View showing the the ABC Entertainment Center with the Century Plaza Towers in the background as seen from across Avenue of the Stars in front of the Century Plaza Hotel. 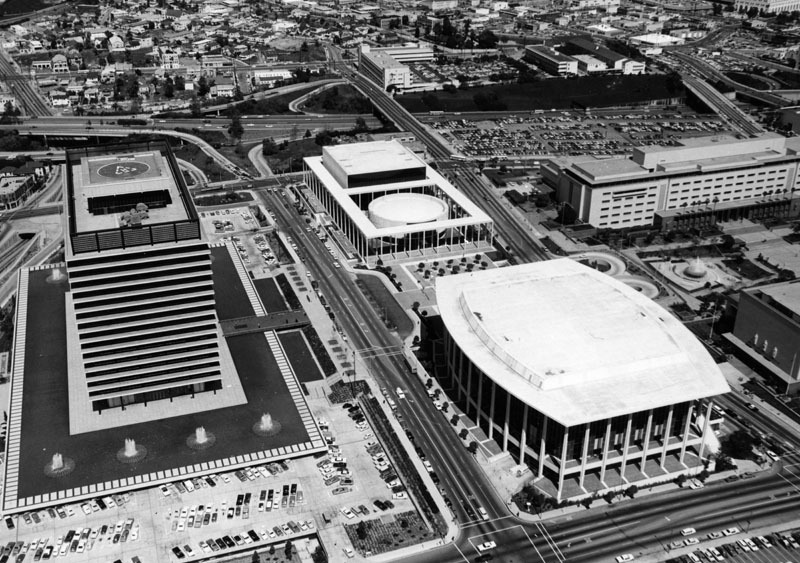 (1986)^ – Street level view showing four prominent structures of Century City: the Shubert Theatre (left), the ABC Entertainment Center (right), and the Century Plaza Towers (background). 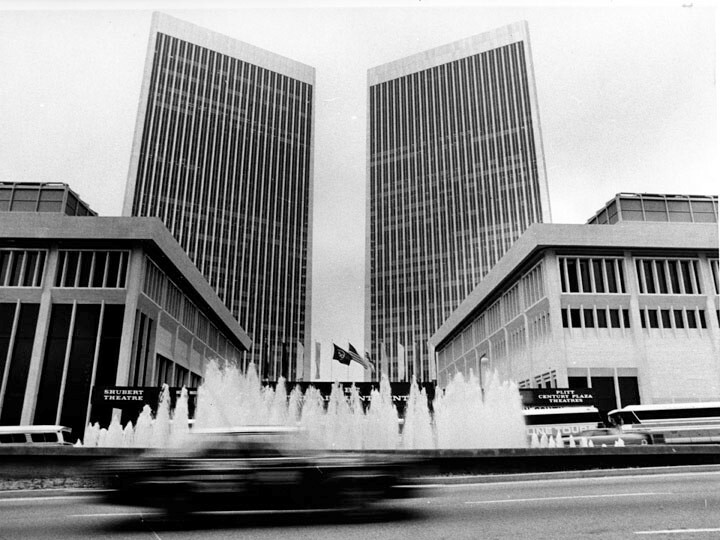 The ABC Entertainment Center was designed by Henry George Greene, and completed in 1972; the Century Plaza Towers were designed by Minoru Yamasaki and built between 1969 and 1975. The Shubert Theatre was demolished in 2002 and the ABC Entertainment Center was demolished in 2003. (1984)^ - In the foreground is the ABC Entertainment Center featuring a lighted fountain. In the background are the Century Plaza Towers. 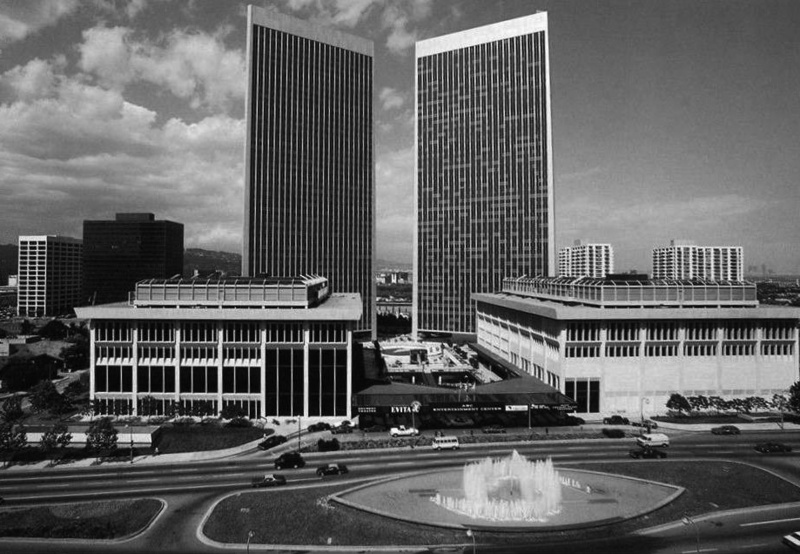 The ABC Entertainment Center, designed by Henry George Greene was completed in 1972 and demolished in 2003; the Century Plaza Towers, designed by Minoru Yamasaki was built between 1969 and 1975. Playing at the Shubert, the theater of the complex, is "42nd Street," and "Scarface", starring Al Pacino. Minoru Yamasaki's two soaring towers with triangular floor plans rise behind Greene's Brutalist theatre complex in this view. At the time, the complex had the world's largest underground parking garage with 5600 parking spaces. (ca. 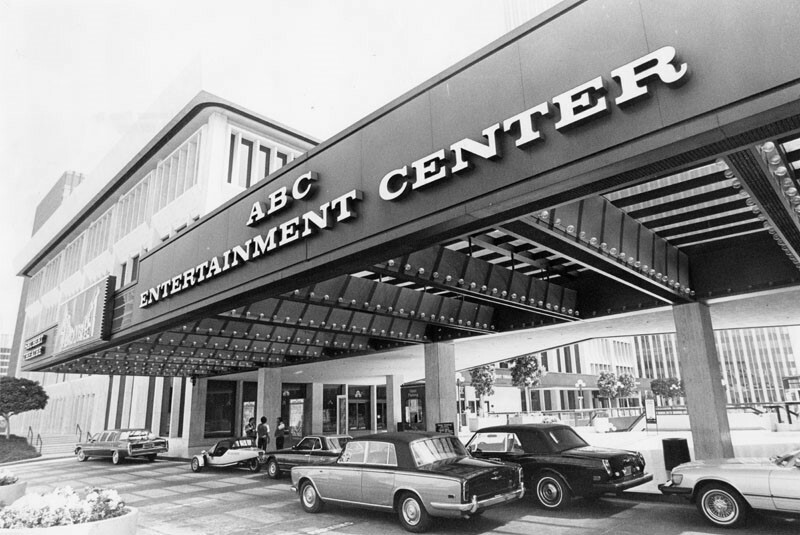 1986)^ - Close-up of the entrance to the ABC Entertainment Center with a view of the Shubert Theatre (left), which was later demolished in 2002. The Entertainment Center was demolished in October 2002 to make way for the 2000 Avenue of the Stars office building. The Plaza Towers' prominence in the Century City skyline has been reduced in recent years with the addition of new skyscrapers that partially block their view. 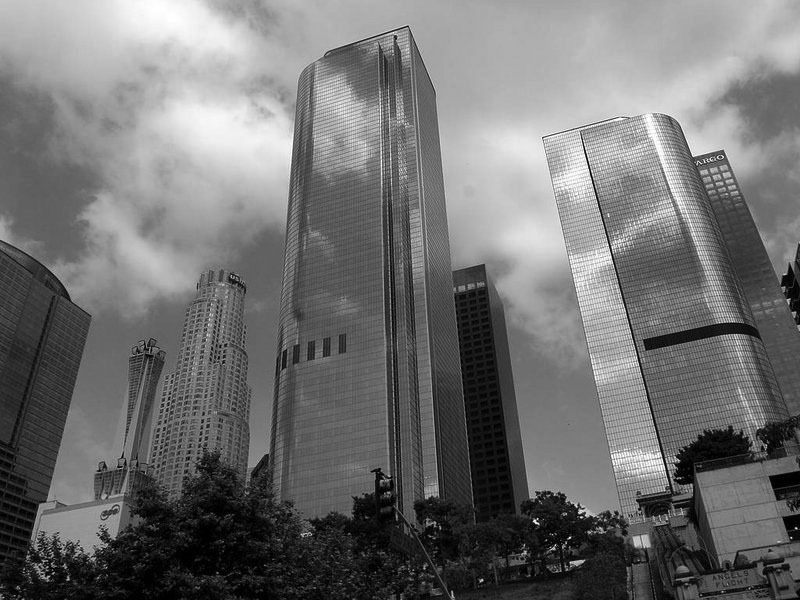 Nevertheless, the Century Plaza Towers remain the tallest buildings in Century City and the tallest skyscrapers in Southern California outside of downtown Los Angeles. 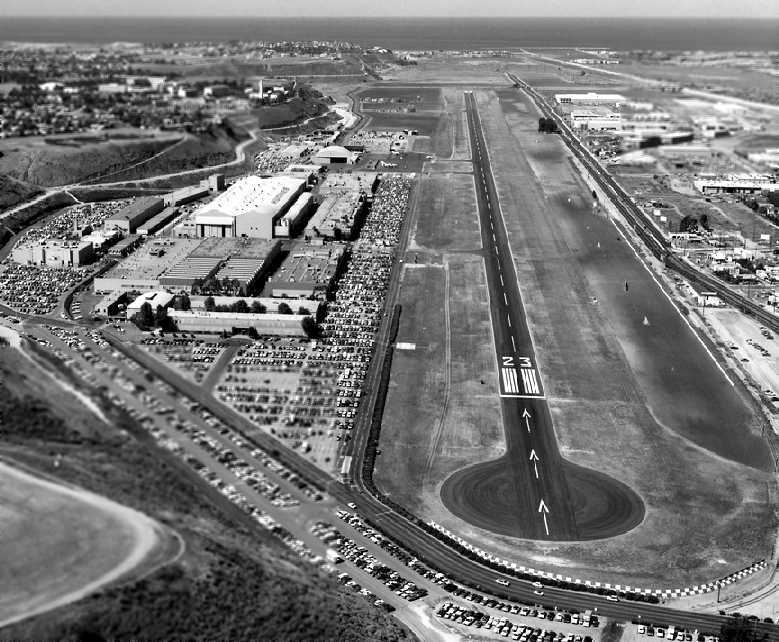 (1968)* - Aerial view looking east along the runway of the Hughes Airport. Loyola University and Westchester can be seen on the right. (1972)*#*# - Aerial view looking west at the Hughes Airfield. (ca. 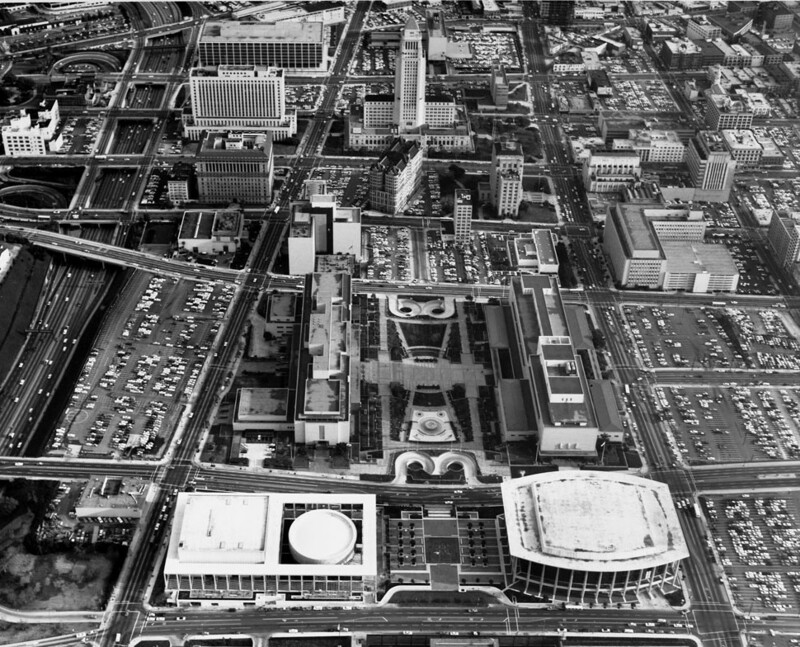 1970s)^ - The California Federal Plaza building is in the center of an aerial shot showing surrounding commercial and residential areas. Signage on some of the commercial buildings include Van de Kamp's, and Prudential, later renamed Museum Square. 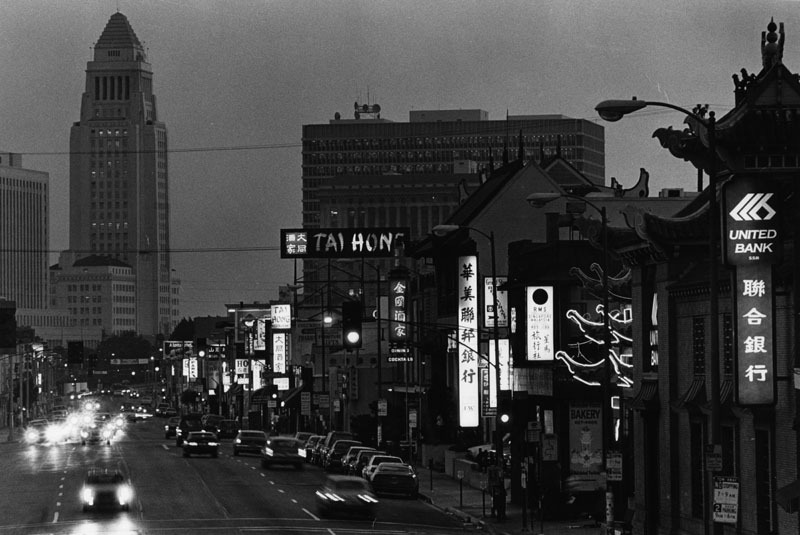 (1972)**^ - View looking west on Wilshire Boulevard. 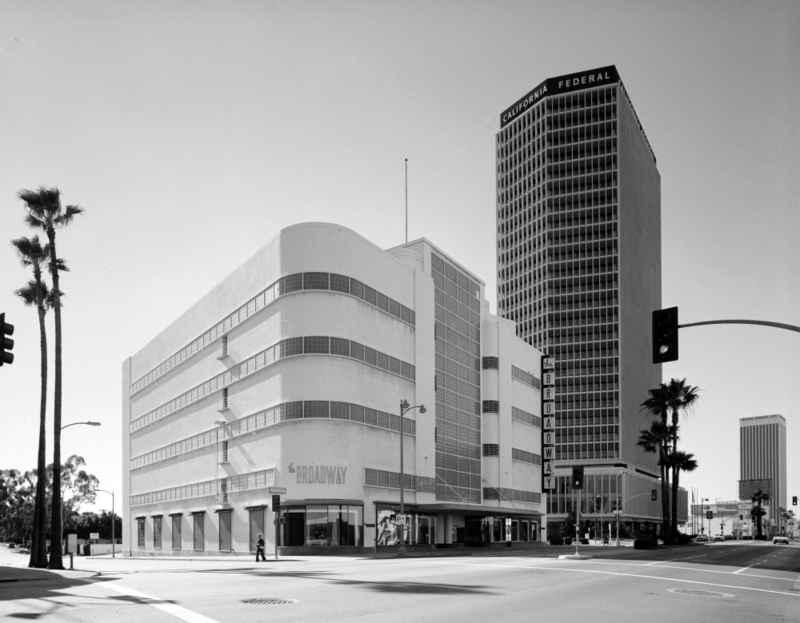 The Broadway (originally Coulter's) Department Store is at 5600 Wilshire Boulevard. The California Federal Bank Building stands to the right. 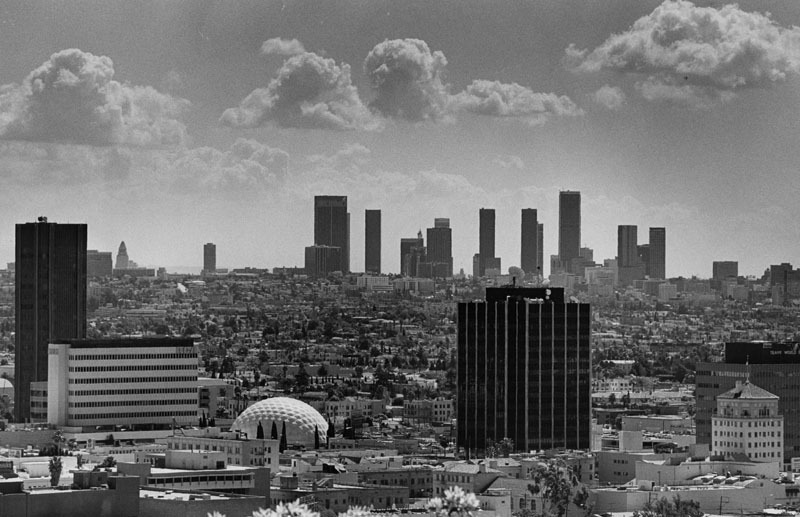 (1979)^ - Panoramic view from Los Angeles City Hall, looking northeast from the southern side of Highway 101. 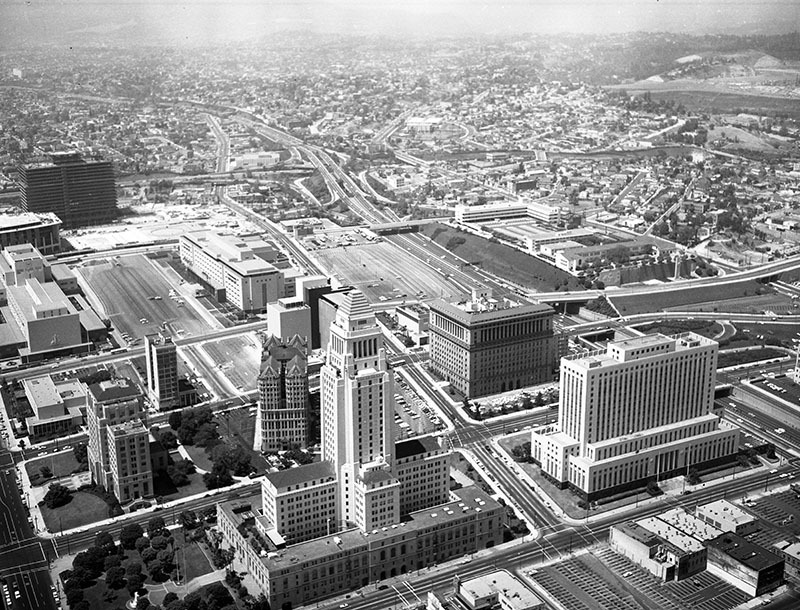 Several landmarks are visible, including the Terminal Annex Post Office, Union Station, and the L.A. Plaza. 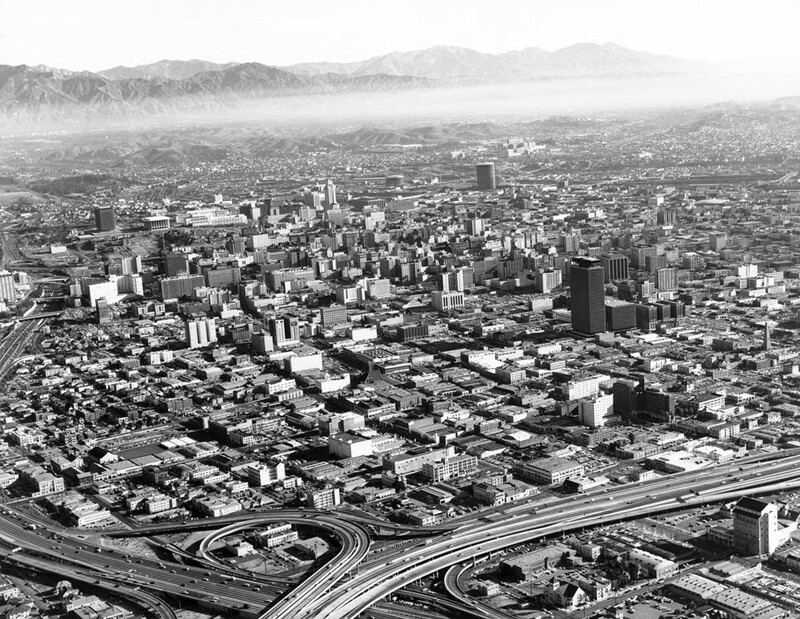 (1968)*# - Aerial view facing north over Downtown Los Angeles with the Harbor and Hollywood freeways in the background. 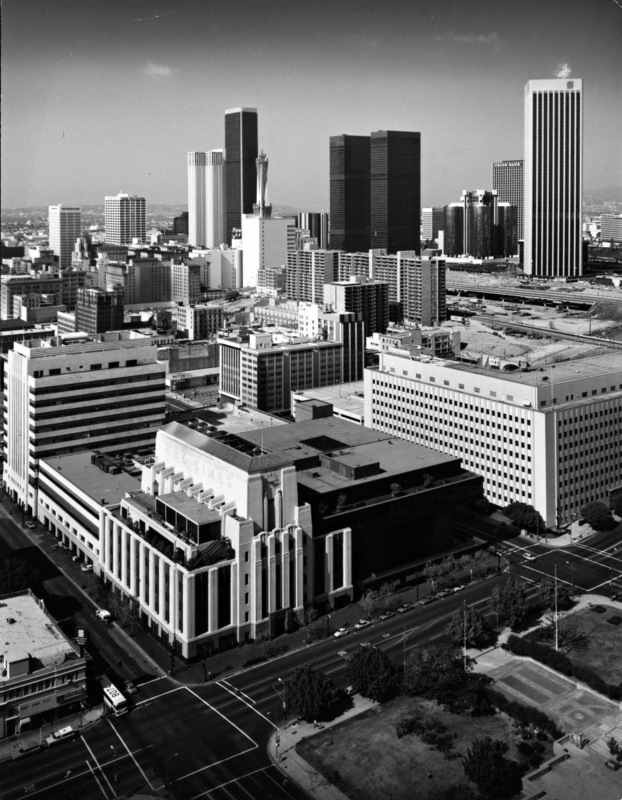 Notable buildings are the Eastern-Columbia with the clock tower, Texaco Building, One Wilshire, City National Bank, AT&T Building (under construction), Union Bank Square. 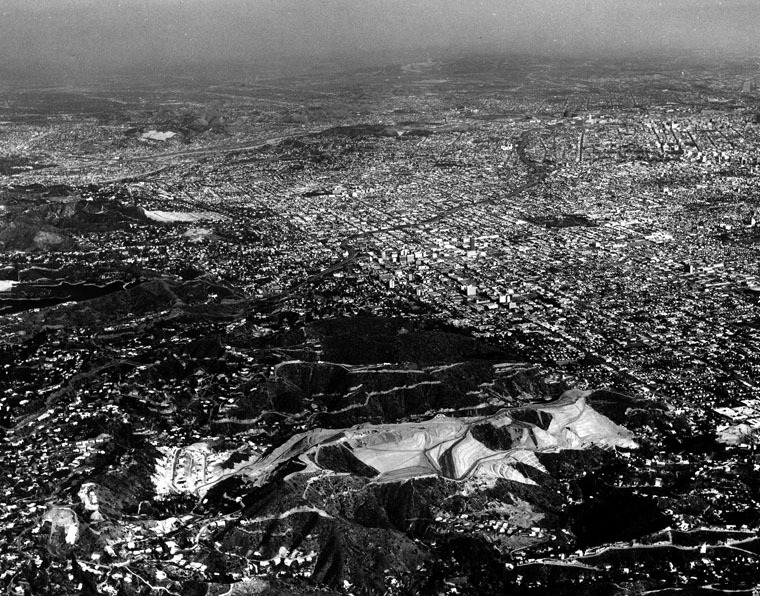 (1970)^#^^ – Aerial view looking south over Dodger Stadium showing downtown and the Bunker Hill Redevelopment area (open space). 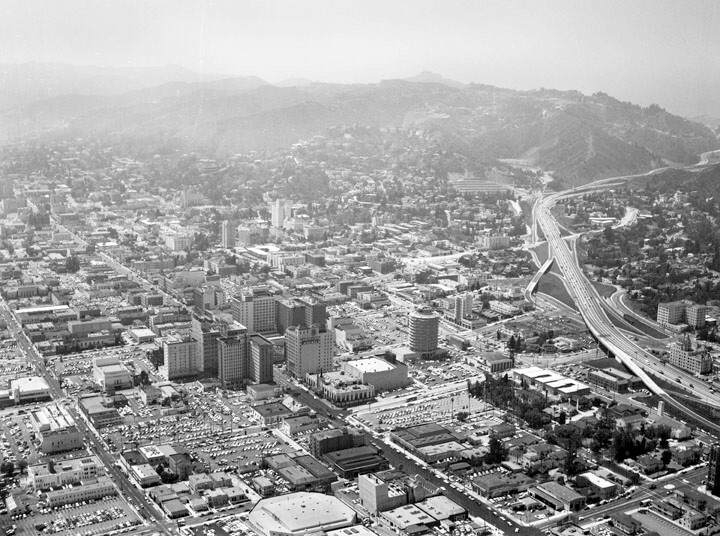 (1971)**^ - Aerial view of downtown Los Angeles looking southwest from over the Hollywood Freeway. The Pacific Ocean can be seen in the distance. Note the cleared area at center of photo. It is part of the Bunker Hill Redevelopment Project. 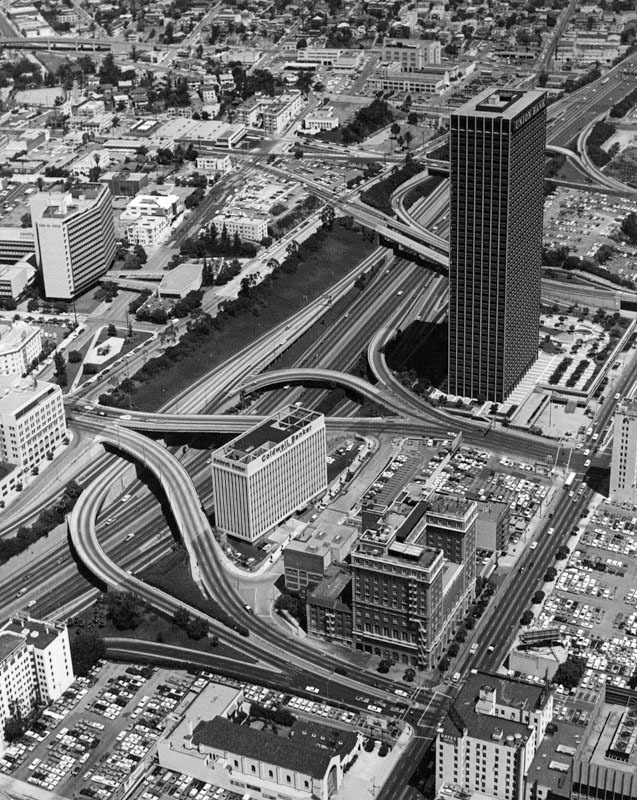 (1970)^ - Aerial view of the Four Level Interchange in downtown L.A. Some of the recently constructed buildings (Music Center, DWP, Bunker Tower, etc.) can be seen in the background. (1968)^ - View looking south on Flower Street toward 5th Street. The California Club stands on the left. The Richfield Building is the tallest building in view. Empty parking lots are seen in the foreground. 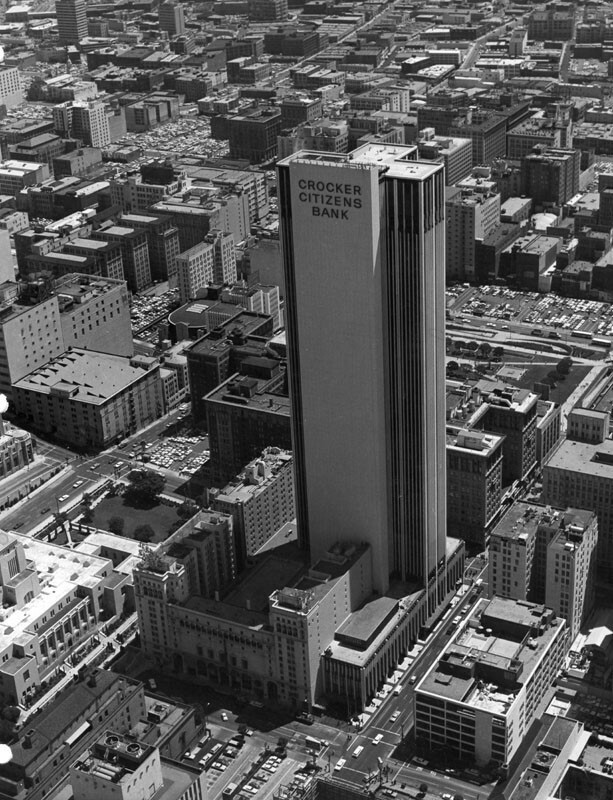 (1968)^ - Aerial view looking northeast showing the 42-story Crocker-Citizens Plaza and surrounding buildings in downtown Los Angeles. In the lower-left can be seen LA Central Library, the California Club, and Church of the Open Door/Biola Institute. The Crocker-Citizens Plaza was designed by William L. Pereira & Associates and completed in 1968 (Click HERE to see more). 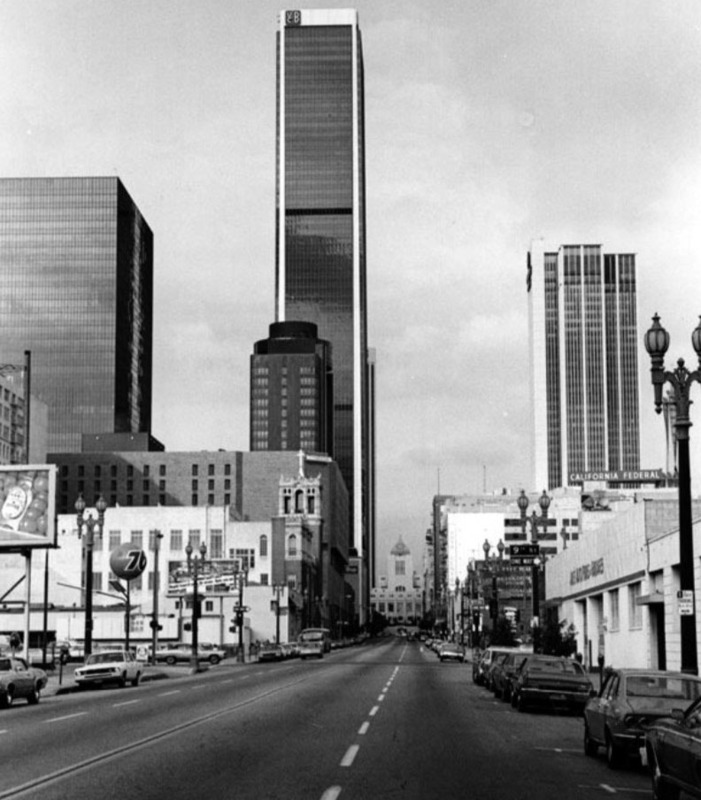 (1970s)##^# – View looking west from the corner of 5th and Hill streets showing the Biltmore Hotel with Crocker-Citizens Bank Building and ARCO Towers behind it. Thrifty is on the N/W corner. The 1923-built Biltmore Hotel was designated a Los Angeles Historic-Cultural Monument No. 60 in 1969. 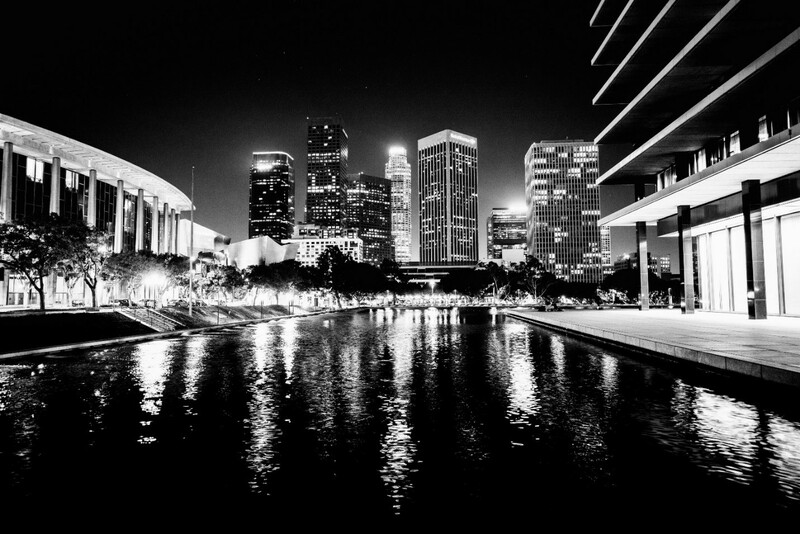 Click HERE to see the LA Historic-Cultural Monument List. Click HERE to see more Early Views of the Biltmore Hotel. (ca. 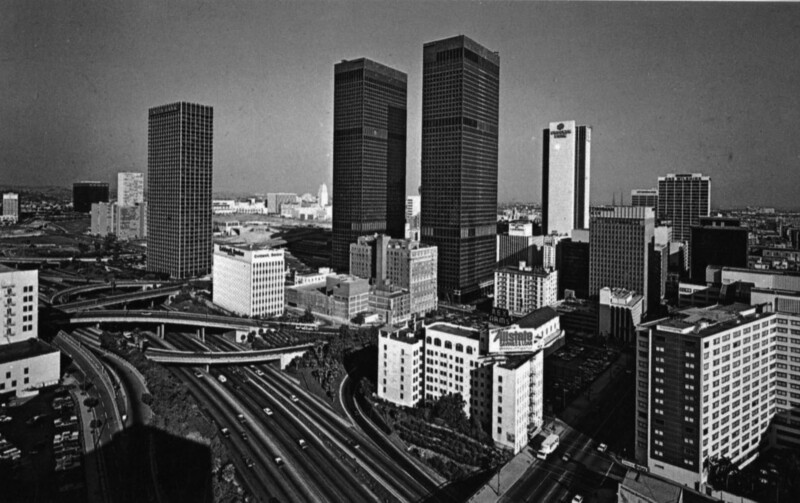 1975)##^# – View looking west on 5th Street toward Grand Avenue showing the Los Angeles Central Library seemingly dwarfed by the the ARCO Plaza Towers. At left is a portion of the Biltmore Hotel. 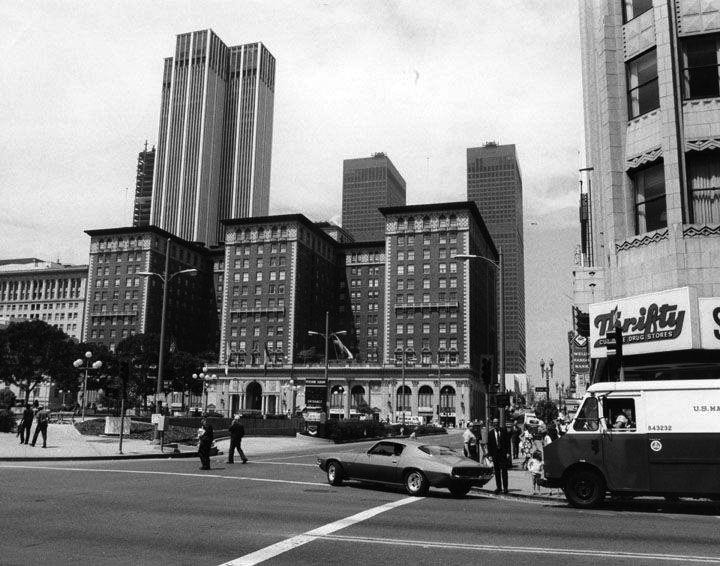 (1974)^#^^ – View looking north on Hope Street with the LA Central Library in the distance. From L to R can be seen the ARCO Plaza Towers, United California Bank Building (now Aon Center), and the Crocker-Citizens Bank Building. Click HERE for contemporary view. (ca. 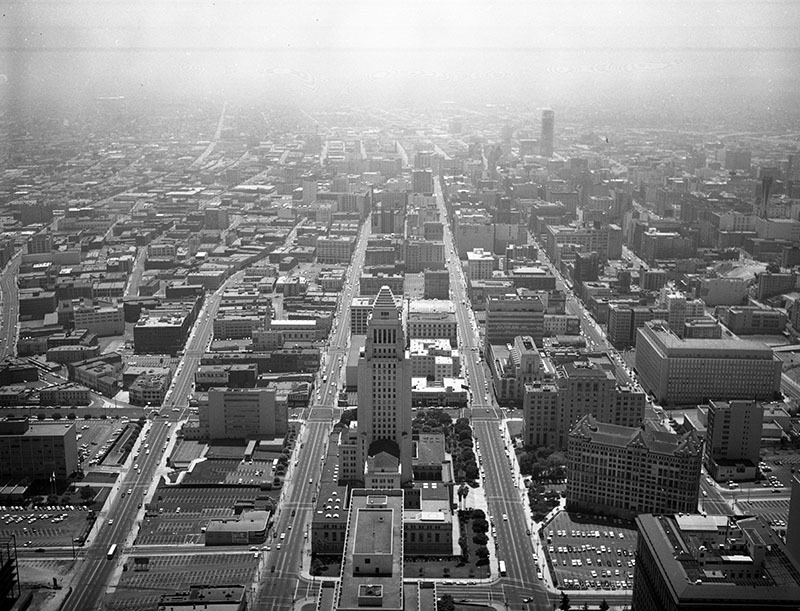 1967)^ - View from City Hall looking south over downtown. 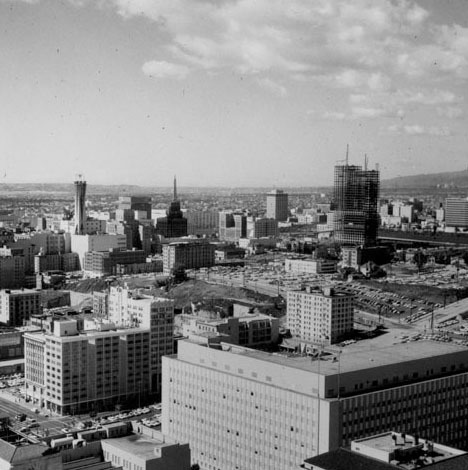 The LA Times Building (foreground) has now been expanded, the Atlantic Richfield Building is still standing, and redevelopment on Bunker Hill has not yet been completed. (1968)**^* - View of Bunker Hill from City Hall looking southwest. 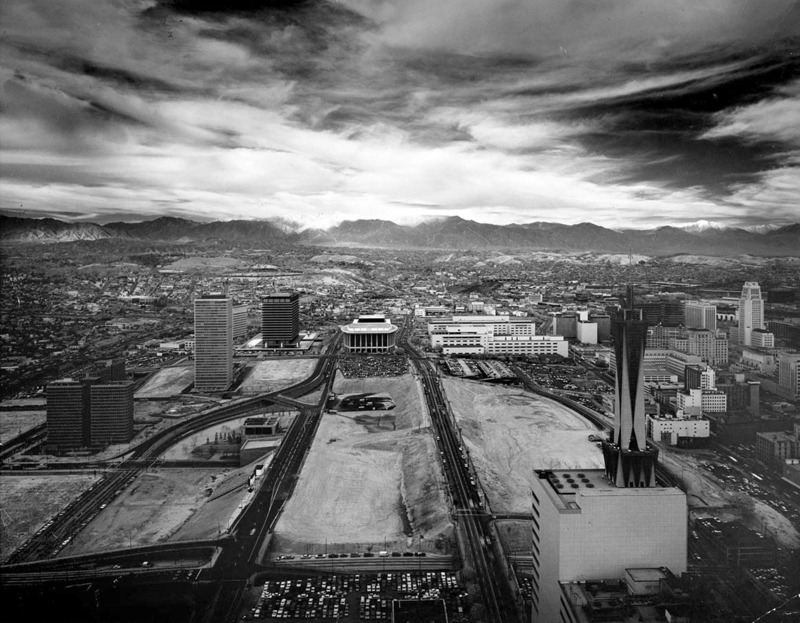 The State Building in the foreground sustained damage in the 1971 San Fernando Earthquake and was demolished in 1976 (see next photo). (1978)^ - View of Bunker Hill from City Hall looking southwest. Same view as previous photo but 10 years later. In the foreground are the remains of the State Building, demolished in 1976. The LA Times Building has a new additon. Also, note how the skyline is beginning to change with the additon of the ARCO Towers, Security Pacific Building, and the Westin Bonaventure Hotel among others. 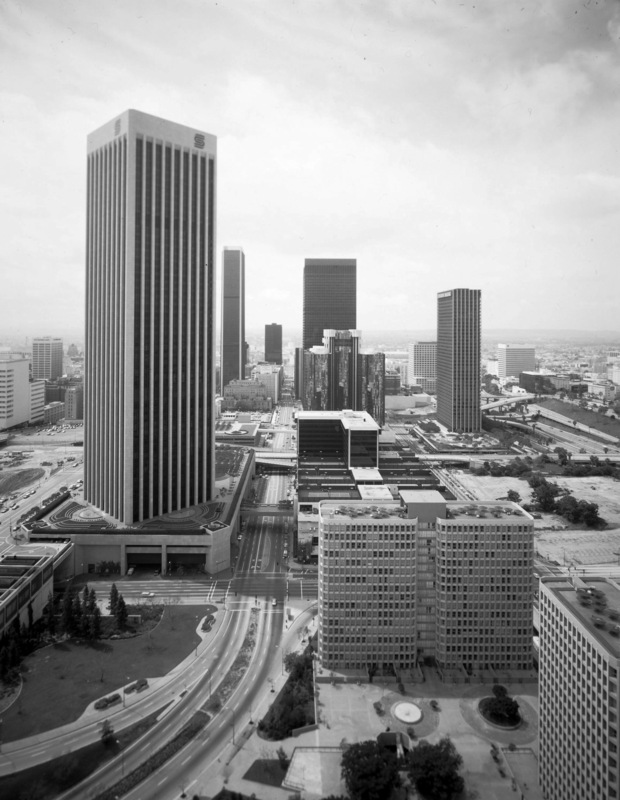 (1980)*++ - View of Bunker Hill from City Hall, looking southwest, with a clear view of the Westin Bonaventure Hotel (built in 1976) in the upper-right. The LA Times Building and Annex can be seen at lower-center. The large building at center-right (SW corner of 1st and Broadway) is the Junipero Serra State Office Building. It would be demolished in 2006 to make way for the First Street U.S. Courthouse. 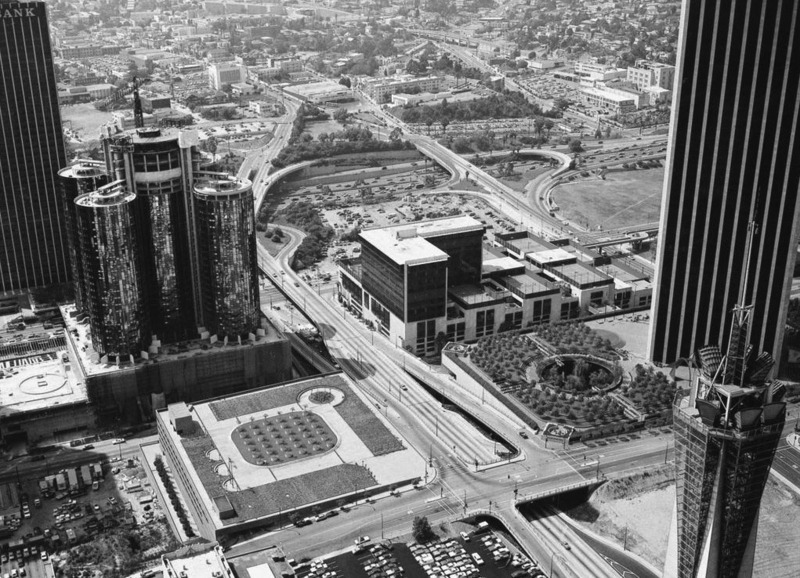 (1976)**^ – Aerial view looking southwest showing the Westin Bonaventure Hotel under construction on the southeast corner of 4th and Figueroa streets. Behind the hotel is the Union Bank Building. At lower right stands the microwave tower on top of the Madison Complex Tandem Office Building. 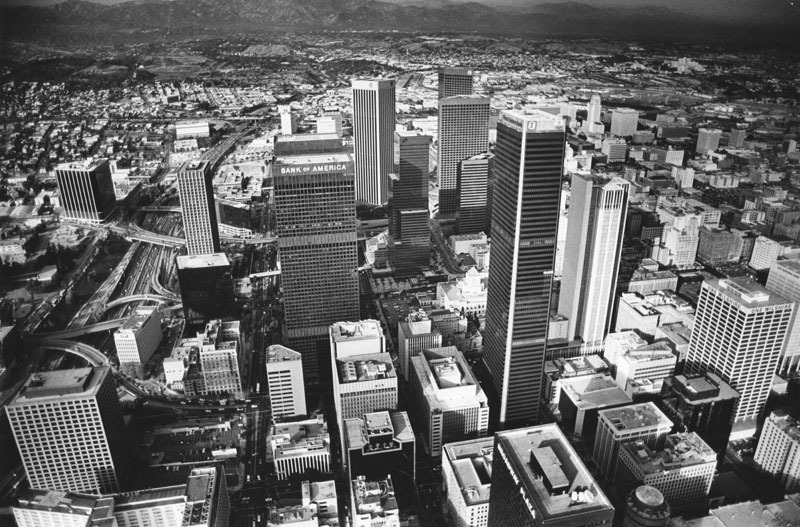 (1980)**^* - View looking west showing from left to right; the Wells Fargo Building (under construction), the Union Bank Building, and the Westin Bonaventure Hotel. 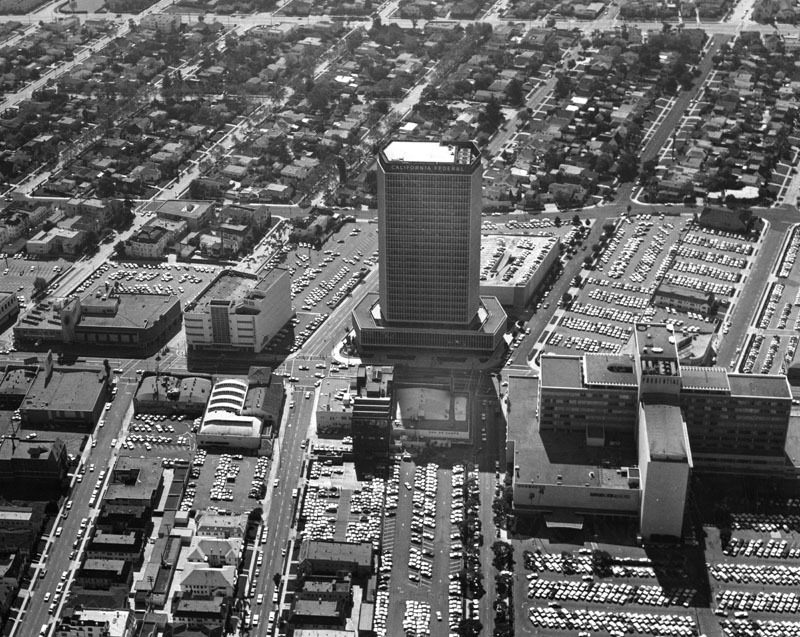 (1960)^ - Aerial view over the Statler Hilton (later Wilshire Grand Hotel) at Figueroa Street and Wilshire Boulevard with the Harbor Freeway seen at right. The Rex Arms Apartments can also be seen at lower-right. 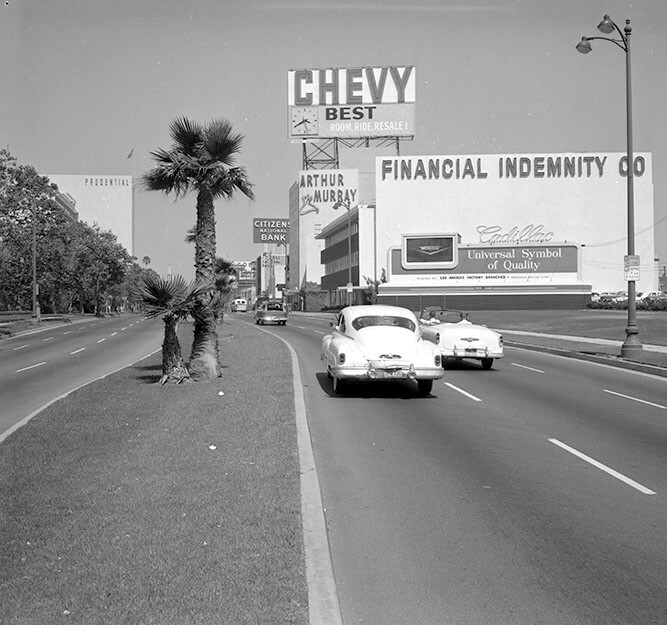 (1954)^.^ – View looking east on Wilshire Boulevard at Beaudry Avenue over the Harbor Freeway. 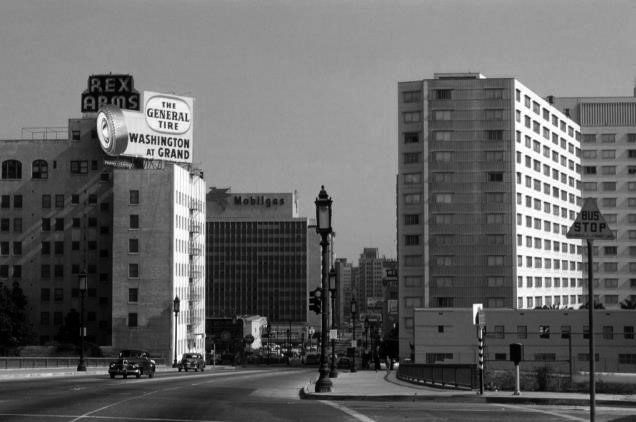 The three buildings seen are the (l to r): Rex Arms Apartments, General Petroleum Building (Mobilgas sign), and Statler Hotel (later Wilshire Grand). Only one building in the above photo has survived to this day, although modified. The 1949-built General Petroleum Building (Mobilgas sign), designed by Welton Becket, was claimed to be the largest office building in the city at the time of its construction in 1948, only to be swiftly dwarfed by its new neighbors. 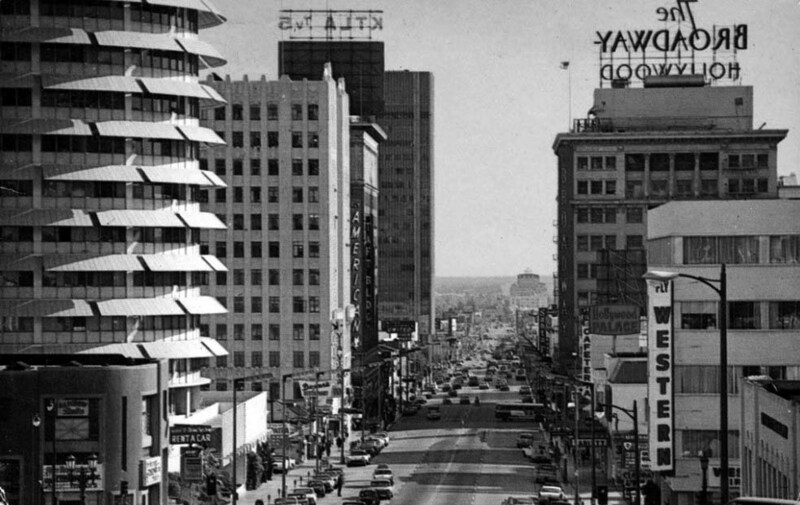 On the right is the Statler Hotel (later Wilshire Grand Hotel) built in 1952. Today it’s the site of the new Wilshire Grand Center, tallest building in Los Angeles. 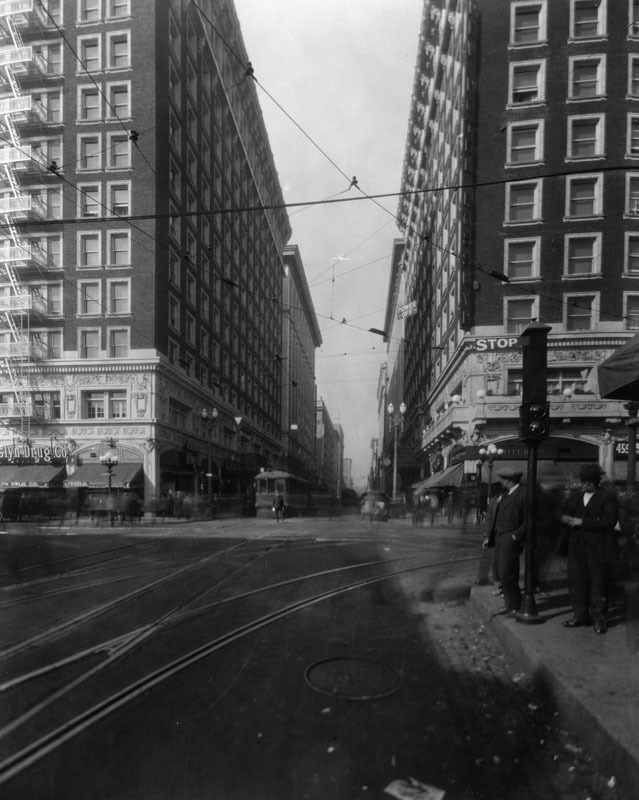 To the left is the 1912-built Rex Arms Apartments, demolished in 1976 to make way for a 22-story office building (915 Wilshire). The General Petroleum Building was vacated in 1994 and converted into 322 apartments in 2003. The apartment building was, and remains, operated under the name Pegasus in tribute to the flying red horse that was displayed for decades atop the structure. The building was added to the National Register of Historic Places based on architectural criteria in 2004. 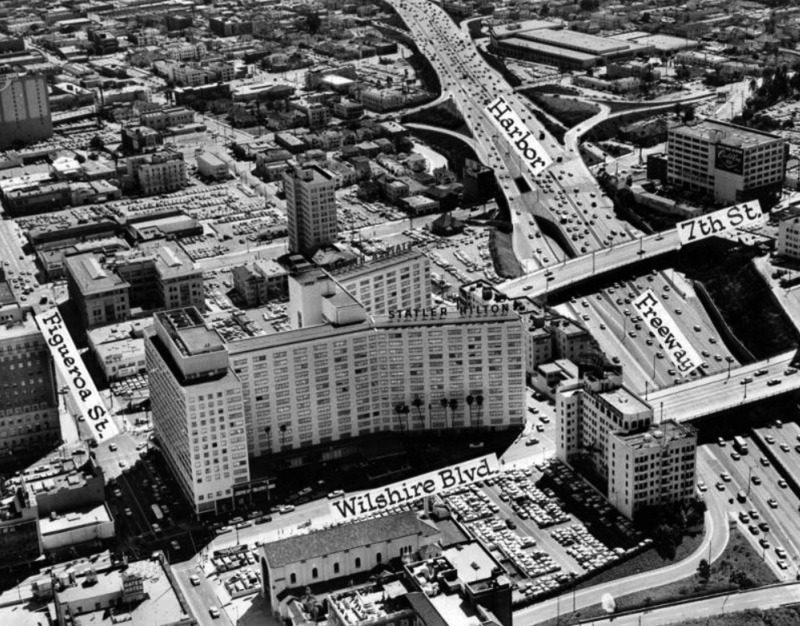 (1954) vs. (2018)* - Wilshire and Beaudry looking east. About the only thing that has stayed the same is the "Wilshire Special" streetlight seen on the corner. (1966)*# – View looking northeast from above Wilshire Boulevard showing two high-rise towers under construction in downtown Los Angeles with the Harbor Freeway and Rex Arms Apartments seen in foreground. 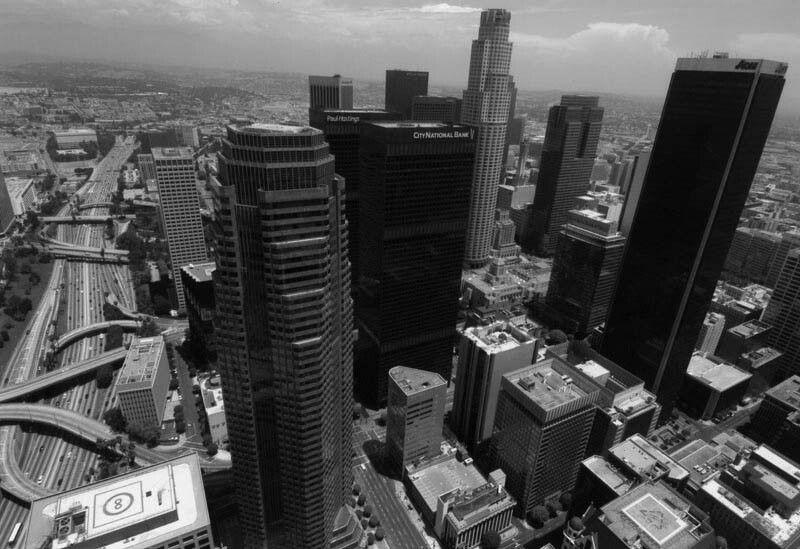 The tall new building at top-left is the 42-story Union Bank Building, 455 S. Figueroa Street. 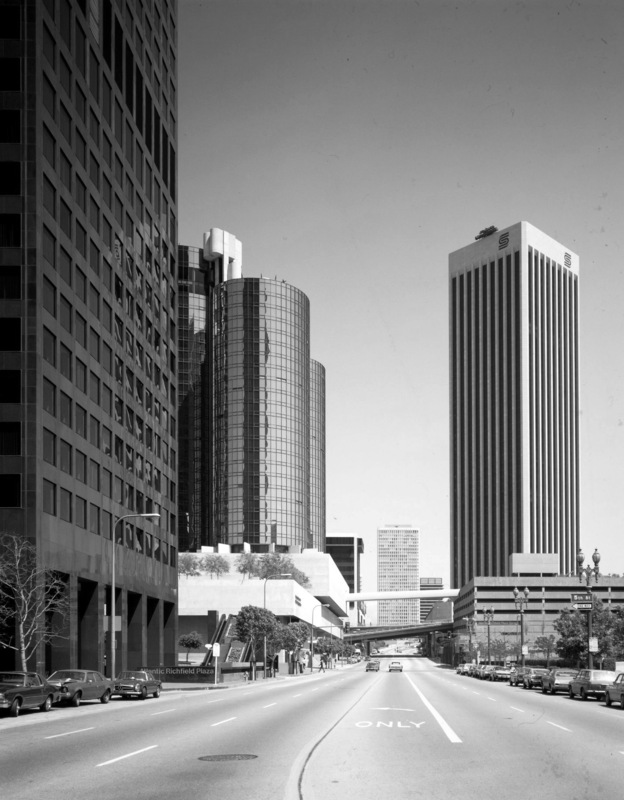 The other high-rise (center-right) is the 30-story One Wilshire Building (1966), 624 S. Grand Ave.
(ca. 1969)^ – Postcard view looking northeast over the Harbor (110) Freeway with the Union Bank Building, Jonathan Club, Crocker-Citizens Bank (now 611 Place), One Wilshire, SBC/PacBell Tower (now AT&T Switching Station), Carpenters Building, and Rex Arms Apartments featured in the foreground. City Hall and the John Ferraro (DWP) Building can be seen in the distance. 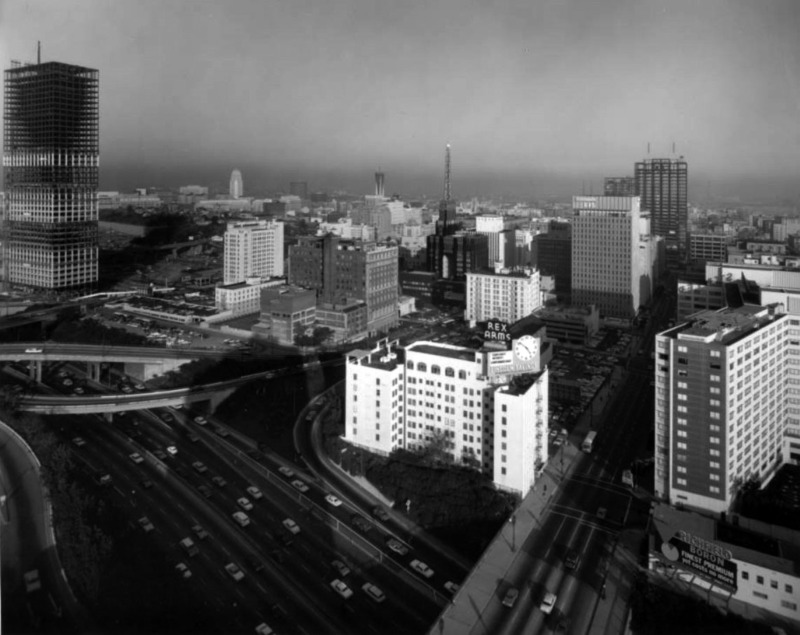 (1972)^ – Panoramic view looking NE over the Harbor (110) Freeway at Wilshire Boulevard. 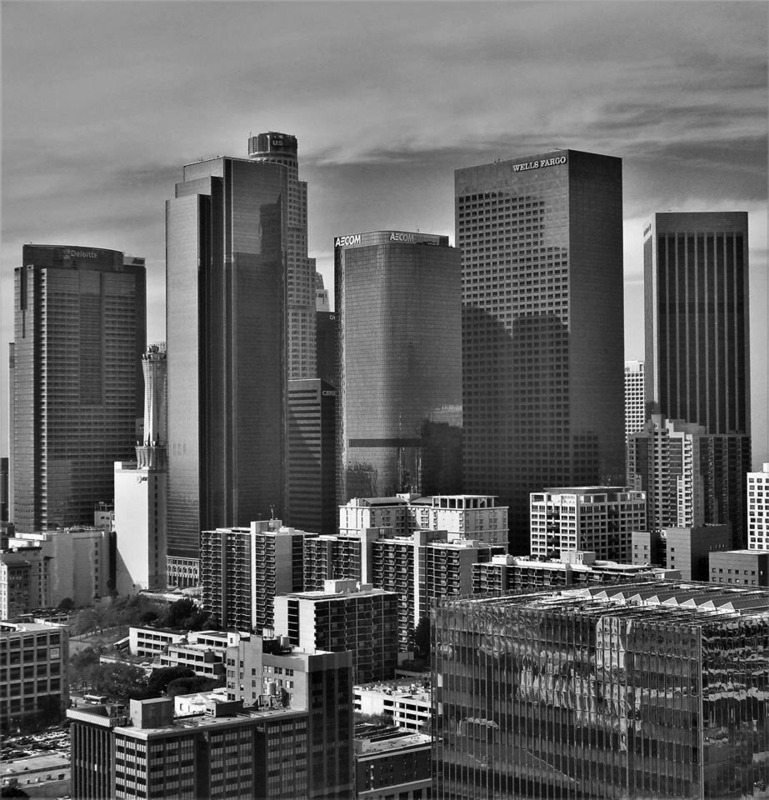 Featuring the 'new' ARCO Plaza Towers, Union Bank Building, Jonathan Club, Crocker-Citizens Bank (now 611 Place), One Wilshire, Carpenters Building, and Rex Arms Apartments in the foreground. 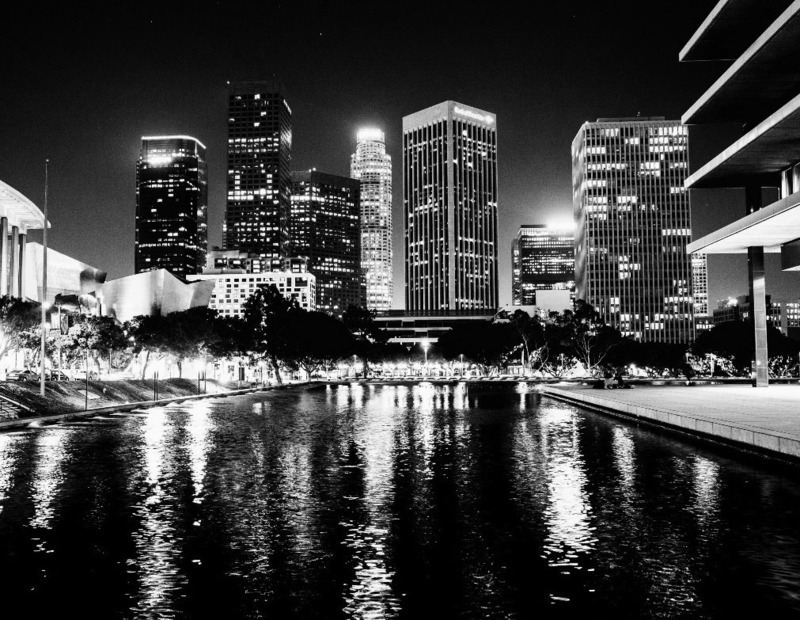 City Hall and the John Ferraro (DWP) Building can be seen in the distance. A construction site (Bunker Hill Development) can be seen east of the Union Bank building. 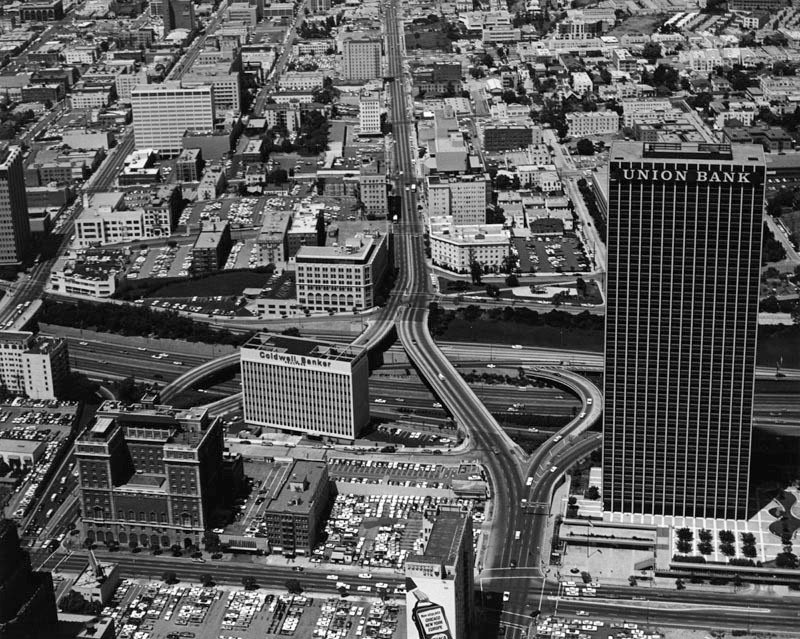 (1968)*# - Aerial view looking northeast showing the Union Bank Building, the first high-rise built on Bunker Hill in Downtown Los Angeles. The building under construction in the upper left is Bunker Hill Tower. The white building in lower-right is the Douglas Oil Building. The Harbor Freeway is seen at lower left. 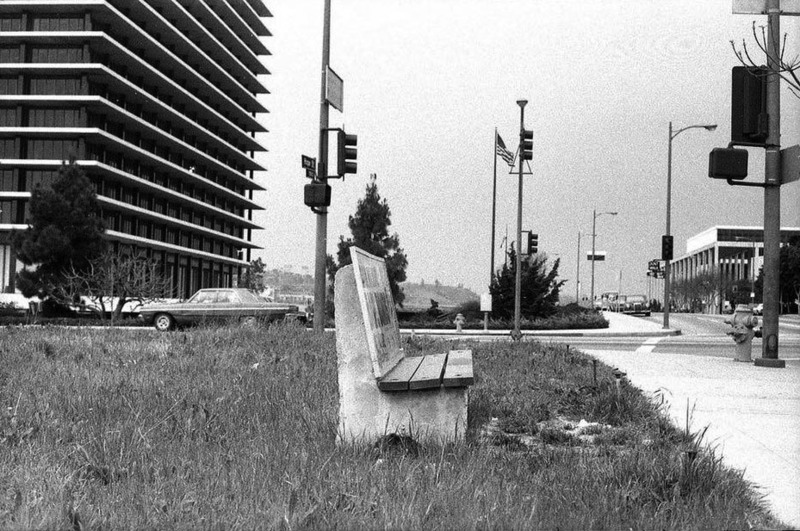 Also seen in the background is the DWP Building, Dorothy Chandler Pavilion, and County Courthouse. (ca. 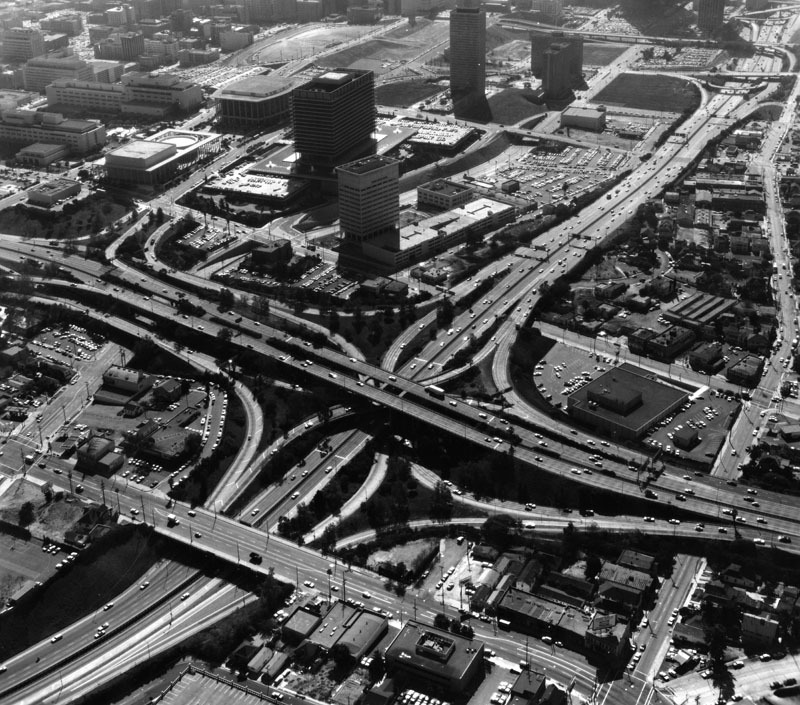 1968)^ - Aerial view looking north along the Harbor Freeway in downtown Los Angeles. Union Bank Building stands tall east of the freeway. Also seen at lower-center is the Coldwell Banker Building and the Jonathan Club. (ca. 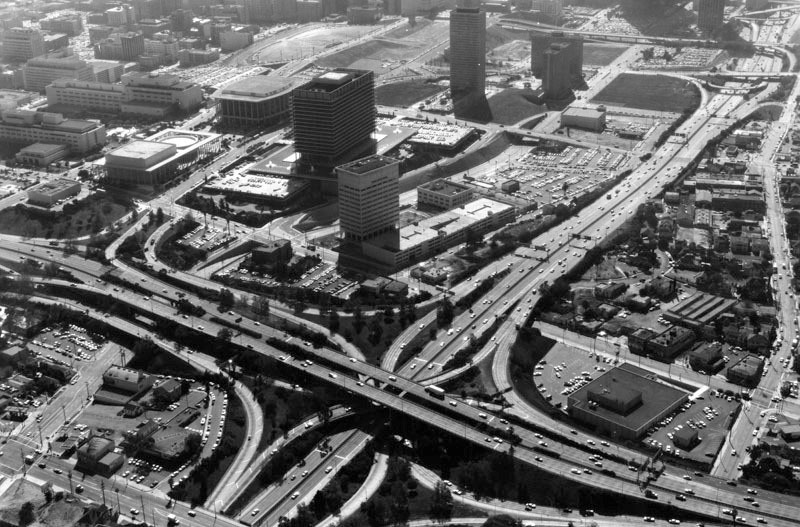 1968)^ - Aerial view looking west along 5th Street toward the #110 Harbor Freeway. The three dominant buildings east of the freeway are (l to r): the Jonathan Club, Coldwell Banker, and Union Bank Building. 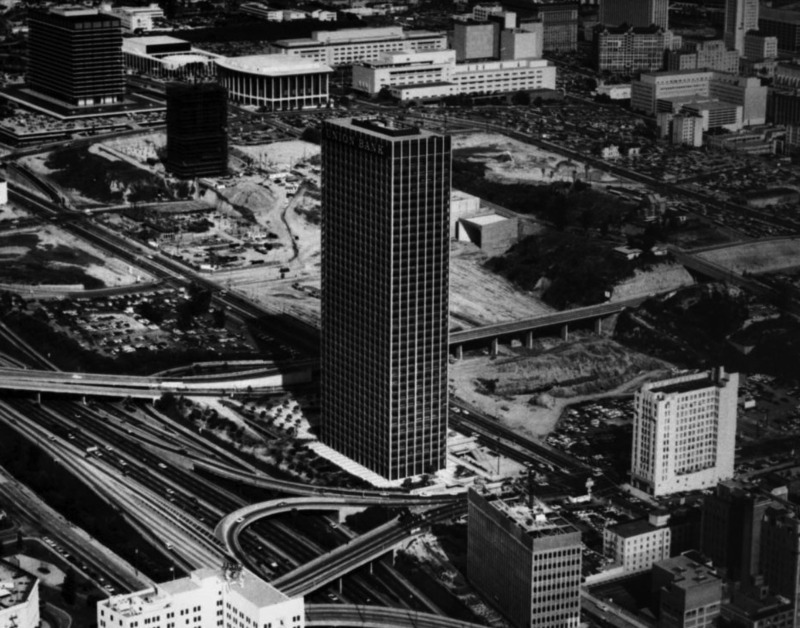 (1969)^ – View looking northeast across the Harbor Freeway showing the 42-story Union Bank Building, the first skyscraper* on Bunker Hill. At left can be seen the Bunker Hill Tower Apartments, still under construction, and the Bunker Hill Tower behind them. To the right stands the Madison Complex Tandem Office Building with its towering microwave tower. The building to the far right is the Douglas Oil Building. 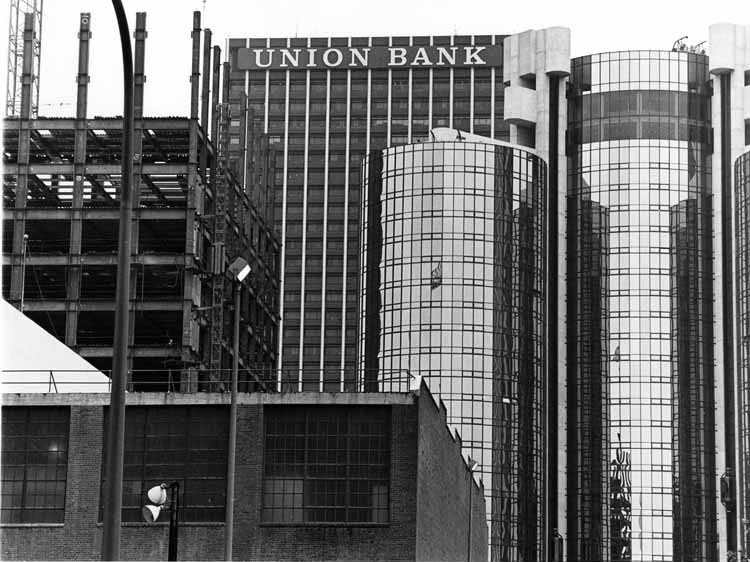 In the southern end of the Bunker Hill redevelopment zone, in what’s typically thought of as the Financial District, the 40-story, 157 meter tall Union Bank Plaza became the first skyscraper to be built as part of the Bunker Hill Redevelopment Project. 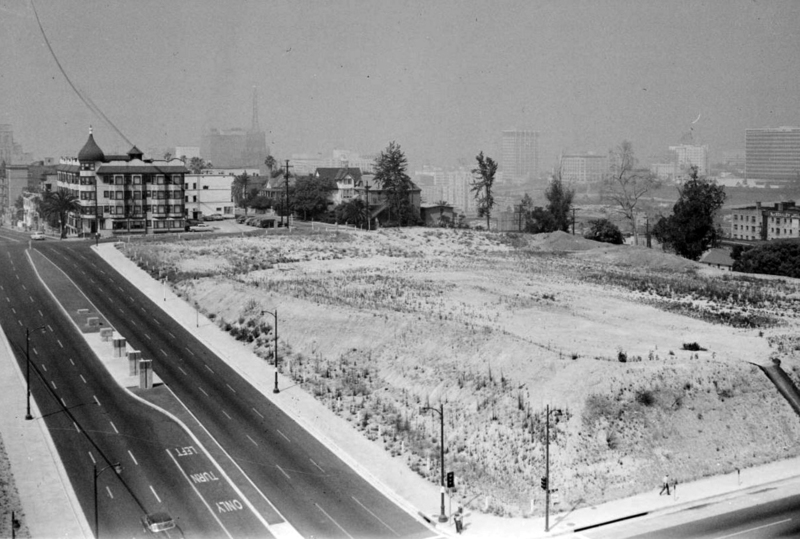 (1971)^ – View looking north showing (L to R) Bunker Hill Apartments, Bunker Hill Tower, and the DWP Office Building rising up from a flattened Bunker Hill. Atop the actual Bunker Hill (but generally thought of as lying within the Civic Center) are two of the first buildings to follow the neighborhood’s redevelopment, the beautiful John Ferraro Building (formerly known as the Department of Water and Power’s General Office Building), completed in 1964, and the Los Angeles Music Center’s Dorothy Chandler Pavilion (1964), Ahmanson Theater (1967), and Mark Taper Forum (1967). (ca. 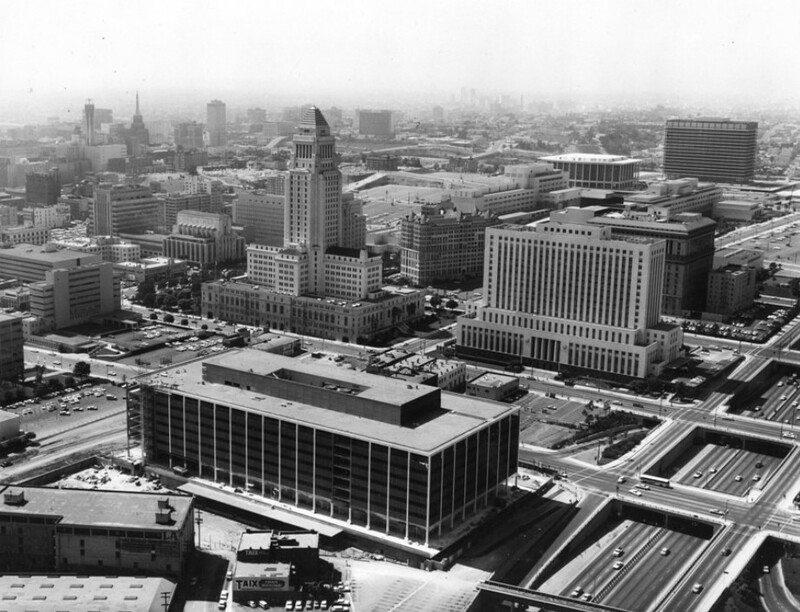 1971)*# - Overlooking Downtown Los Angeles and the Civic Center from an overpass above the Harbor Freeway. The two 19-story Bunker Hill Tower Apartments are in the foreground with the taller Bunker Hill Tower behind them. DWP's office building is on the left and City Hall is in the background on the right. West Second Street, West Third Street, General Thaddeus Kosciuszko Way can all be seen. 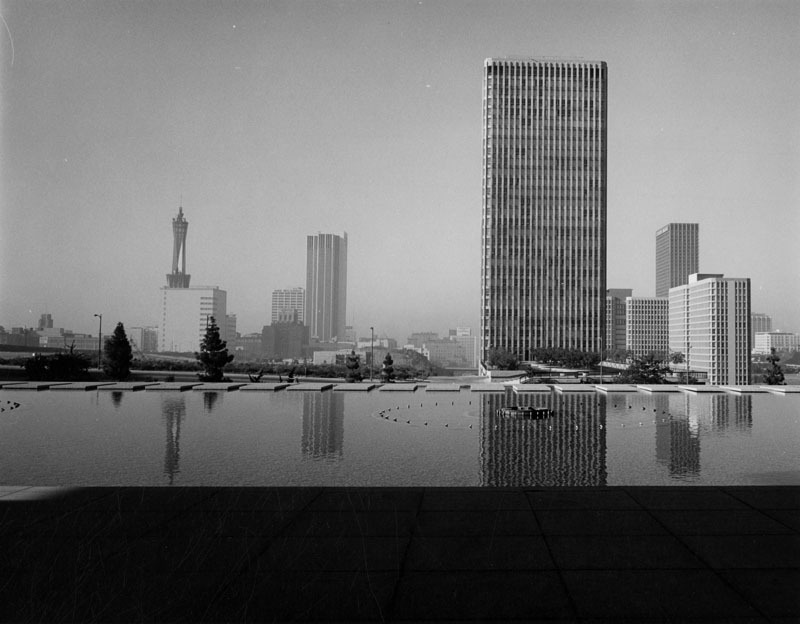 (1974)^ - Looking south from the water courtyard of the General Office Building of the Department of Water and Power. Bunker Hill Tower can be seen across the street (1st Street) and the Pac Bell Tower is at center-left. 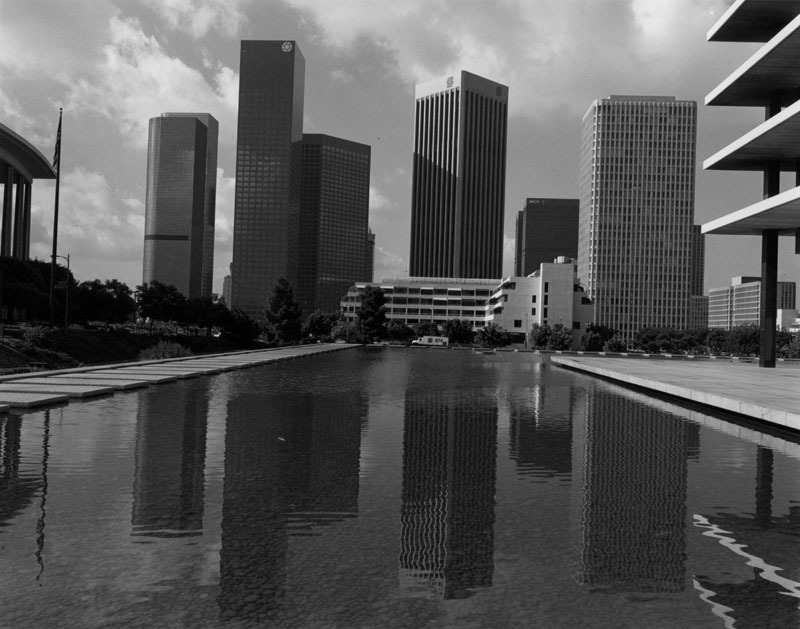 (1986)^ - Another view looking south from the water courtyard of the DWP Building 12 years later. Notice how the skyline has changed. The 32-story Bunker Hill Tower now looks small when compared to the other buildings in the background. Click HERE to see more in Construction of the DWP's General Office Building. (1980)*++ – Aerial view looking south on Flower Street from over 2nd Street showing how the Bunker Hill Redevelopment area is taking shape. To the left is the 55-story Security Pacific Tower and at lower-right are the Bunker Towers. 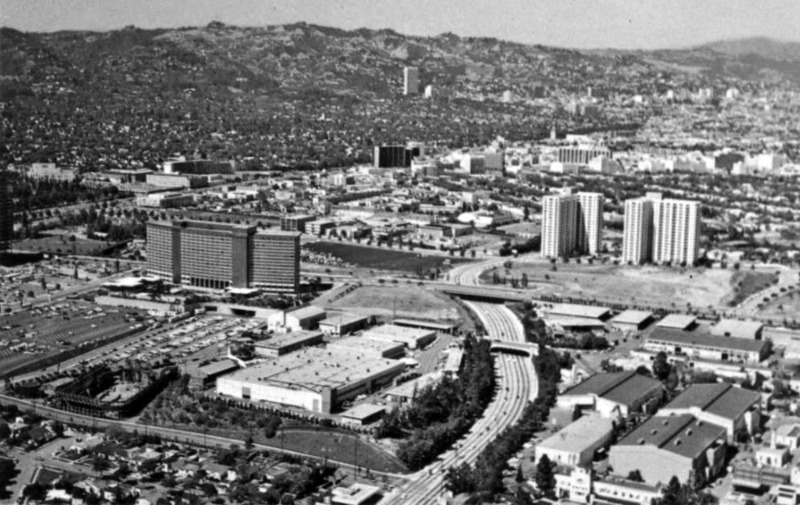 The Westin Bonaventure Hotel is seen at upper-center, with the Union Bank Building to its right. (1980)*++ – Street view looking north on Flower Street from near 5th Street. 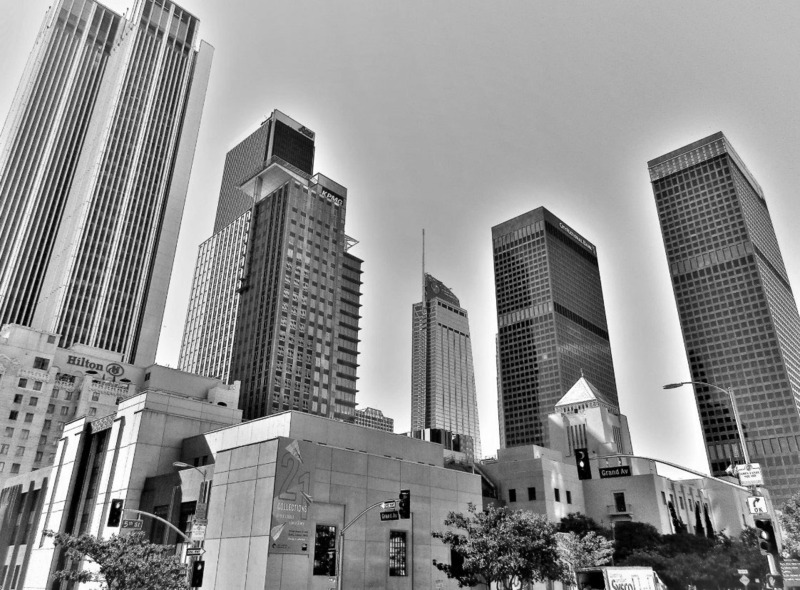 Buildings from left to right include: Atlantic Richfield Plaza, Westin Bonaventure Hotel, Bunker Hill Tower, DWP Office Building, and theSecurity Pacific Tower, now known as Bank of America Plaza. 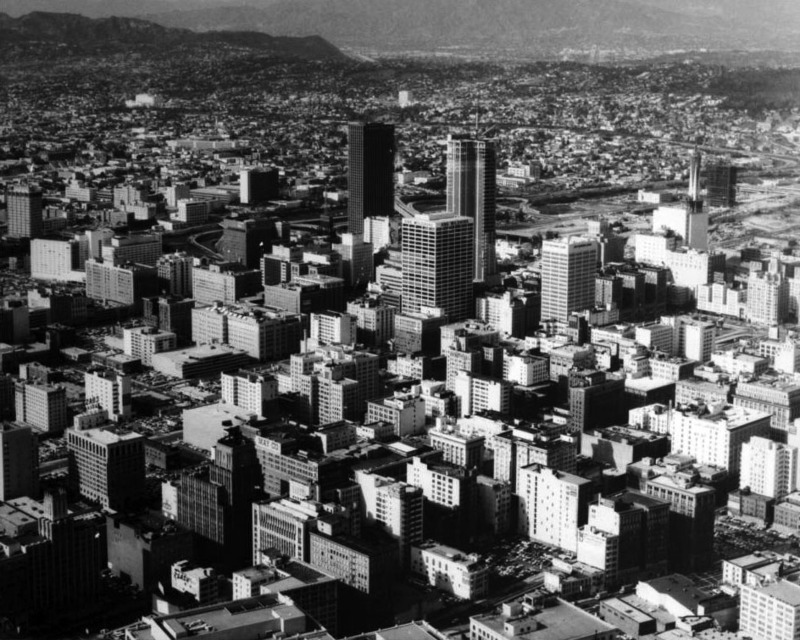 (1982)^ - Older homes, apartments, and businesses (foreground) contrast greatly with the shiny office buildings of downtown Los Angeles. This view, taken on January 23, 1982, is seen from the Hollywood Freeway, just south of Glendale Boulevard. The above photograph was also used for article dated March 10, 1985; the caption reads, "Mayor Bradley cites downtown boom as his major feat, but critics say redevelopment funds would have been better spent for low-and moderate-income housing." 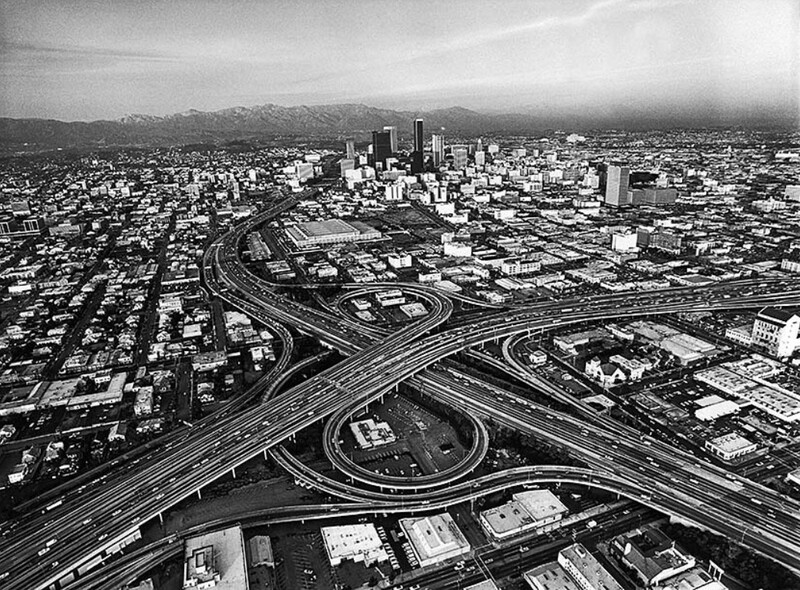 (1983)* - Aerial view looking north at downtown Los Angeles, with Harbor Freeway on the left. 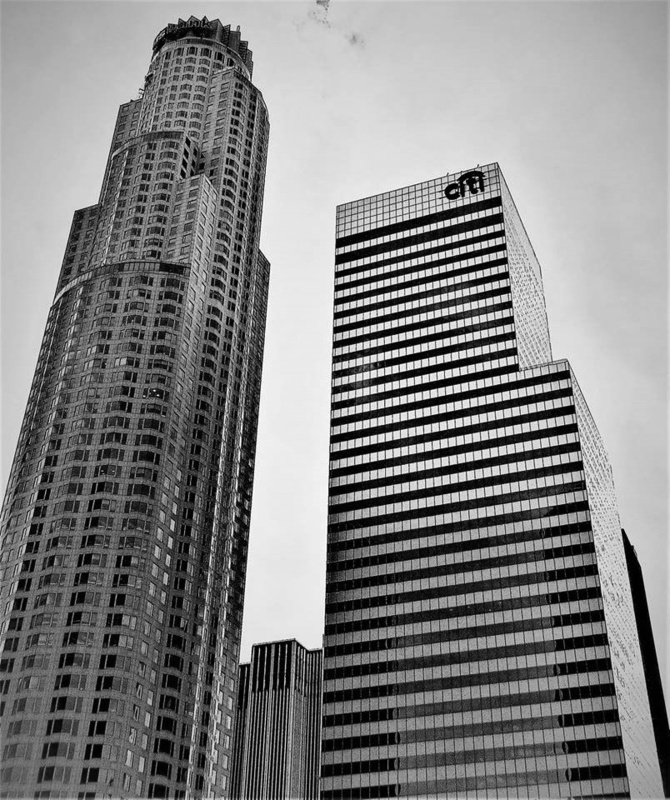 Some identifiable buildings include offices for First Interstate, Bank of America, City National Bank, One Wilshire, and Security Pacific. 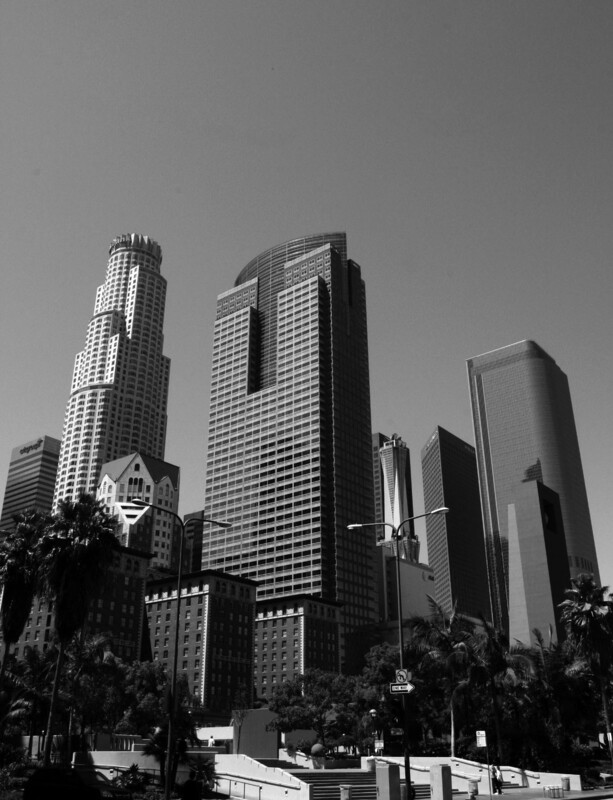 Also seen are Los Angeles Public Library, Broadway Plaza, and City Hall. 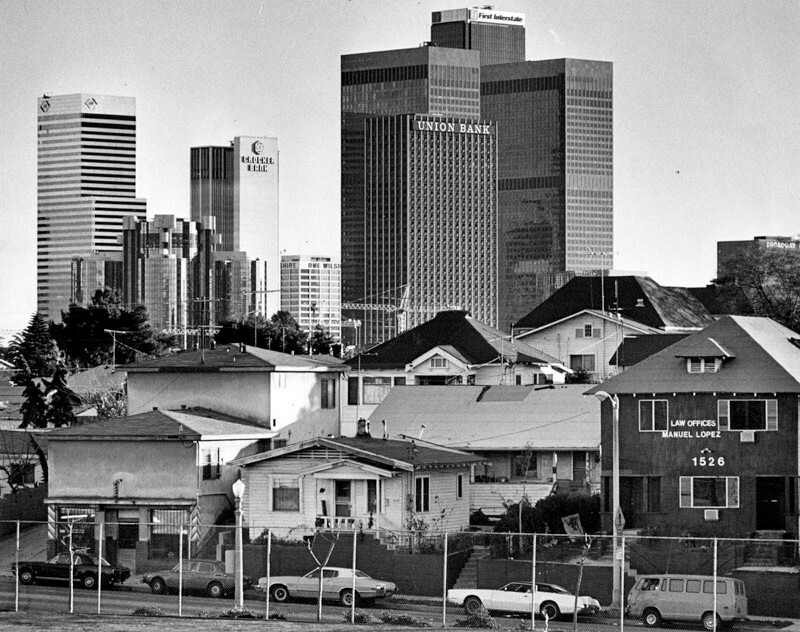 (1981)^ - The downtown skyline, as seen from the Occidental Center. Broadway Plaza, Robinson's, hotels and office buildings make up the skyline. The First United Methodist Church (lower left) was demolished not long after this photograph was taken, and a few skyscrapers are under construction in the background. 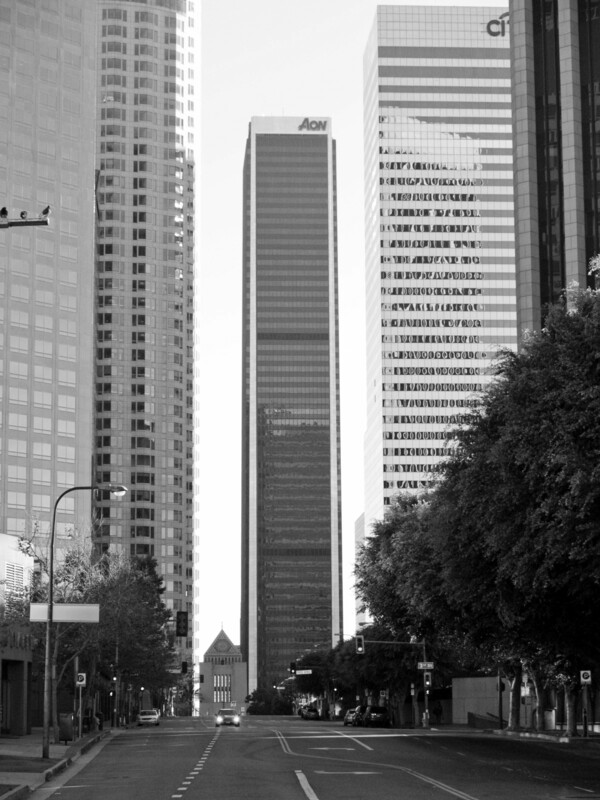 (2010s)#* – View looking south on Hope Street at 3rd Street toward the LA Central Library and Aon Center Building (originally United California Bank Building), 707 Wilshire Boulevard. Also seen is the U.S. Bank Tower (left) and Citigroup Center (right). 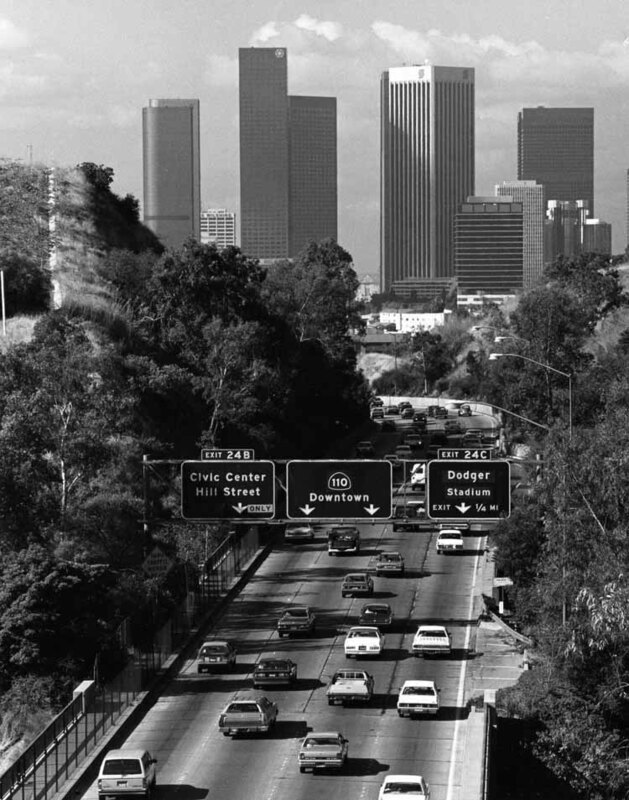 (1980)**^* - Pasadena Freeway westbound with the Downtown LA skyline in the background. 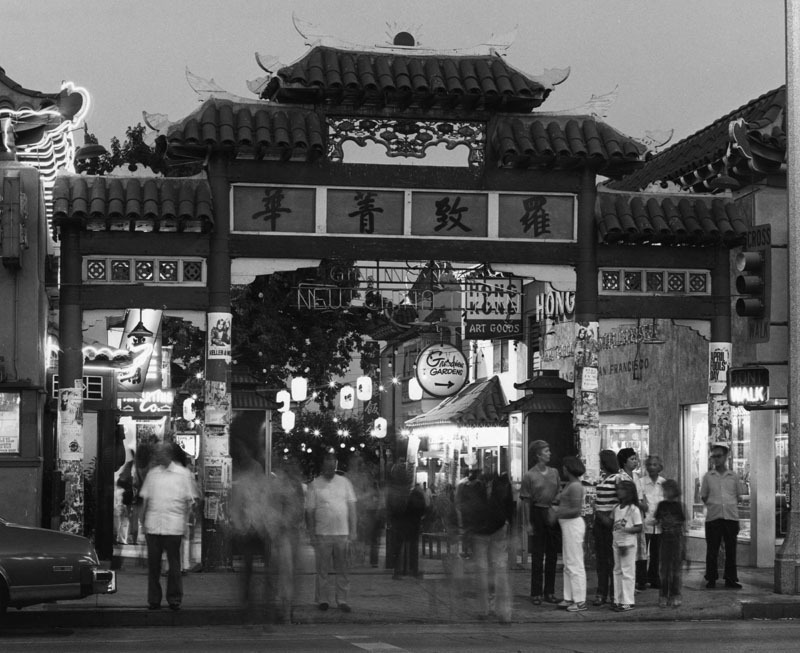 (1988)^ - City Hall stands tall in the background as darkness descends on Chinatown and North Broadway Street. 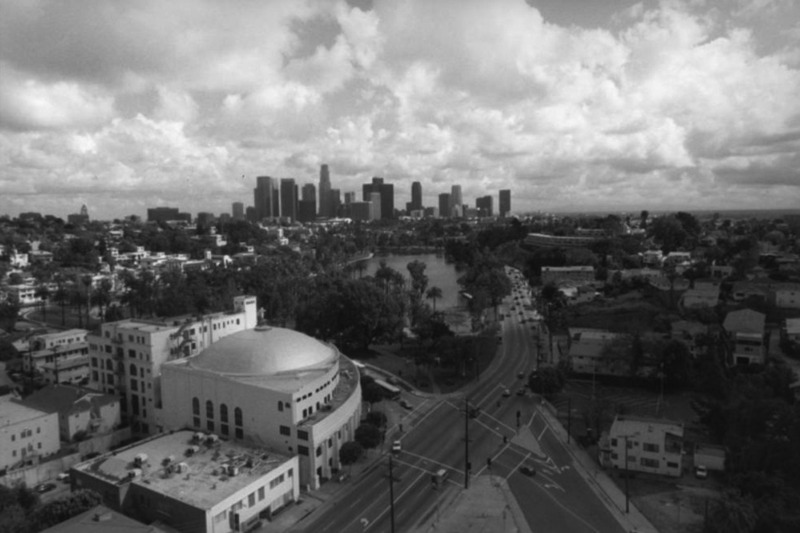 (1998)^ – View looking east in downtown Echo Park showing Sunset Blvd as it crosses Glendale Blvd and heads east with the Jensen's Recreation Center seen at upper-right. The northern portal of the Glendale Blvd Tunnel (under Sunset Blvd) is on the left near Burger King. 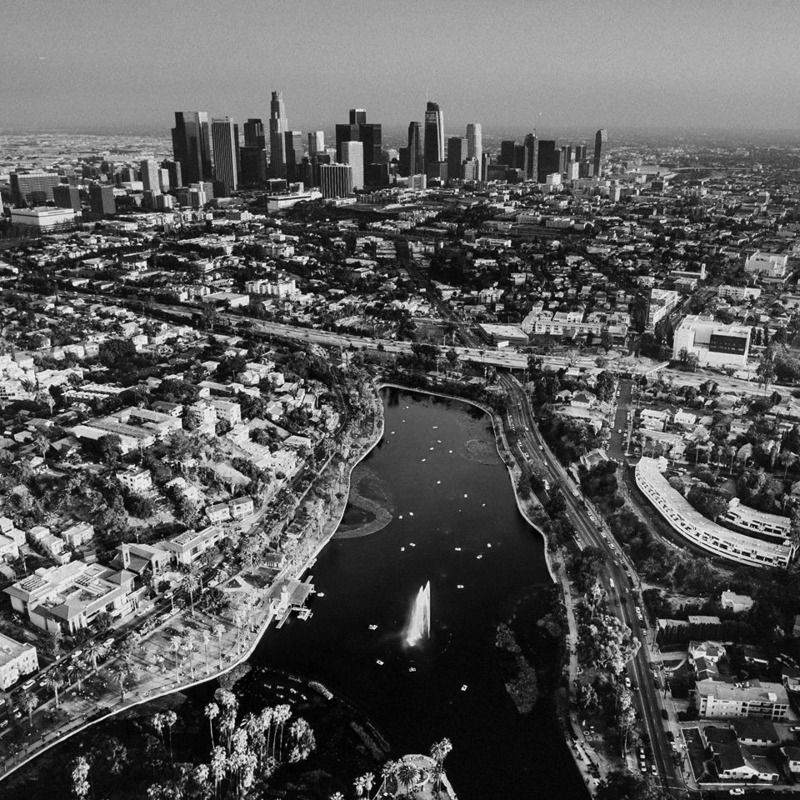 Echo Park is a neighborhood that is flanked by Elysian Valley to the north and northeast, Elysian Park to the east, Chinatown and Downtown to the southeast, Westlake to the southwest and west, and Silver Lake to the northwest. 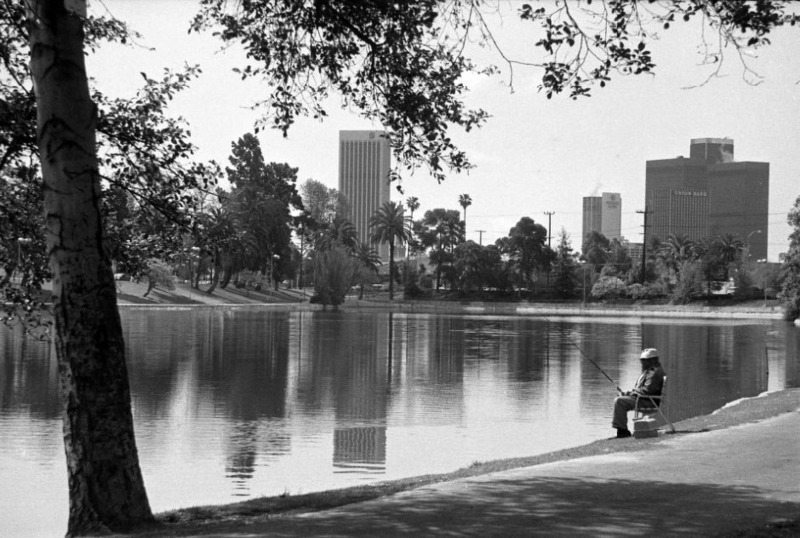 (1975)^* - View looking south showing a man fishing in Echo Park Lake with buildings of Bunker Hill in background. Echo Park Lake began life as one of the City of Los Angeles' water reservoirs in 1868 and it was later developed into one of the city's early parks. 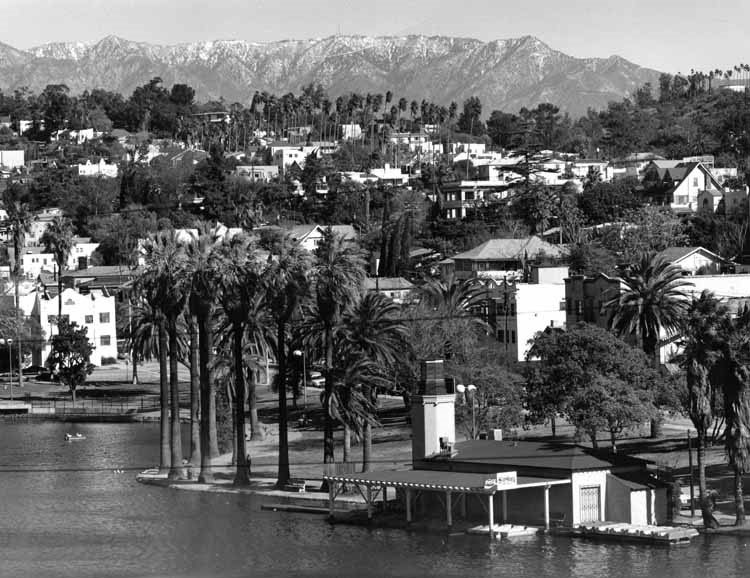 (1988)^ - View looking NE showing Echo Park Lake with residences on hillside, snow-capped mountains in the distance, and palm trees throughout. (ca. 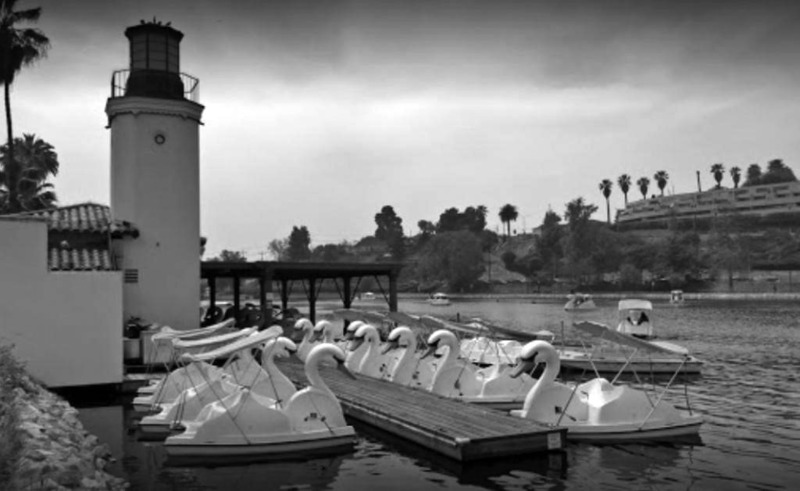 2018)* - Close-up view looking SW showing the Echo Park Lake lighthouse and Pedal Boats Concession. The Spanish Colonial boathouse and 35 foot tall lighthouse were built in the 1930s (renovated in 2014). 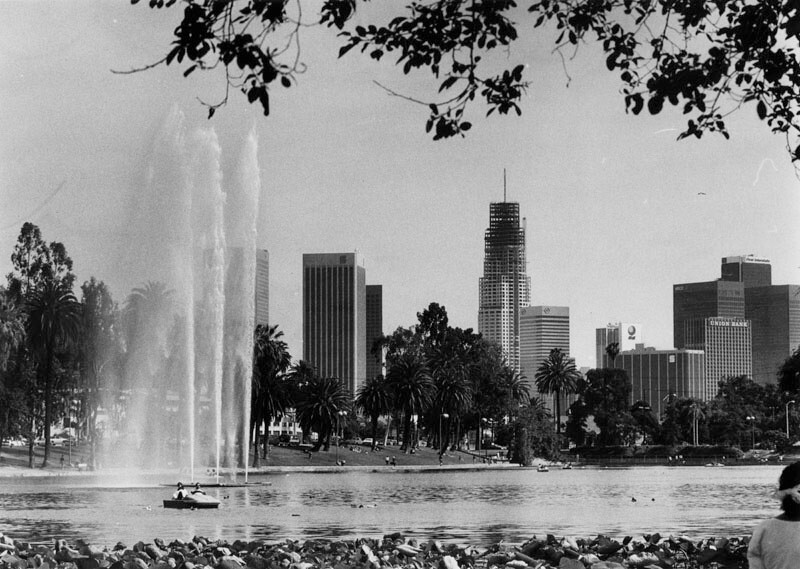 (1989)^ - Panoramic view of Echo Park Lake on a bright sunny day. The city's skyline can also be seen clearly in the background. (ca. 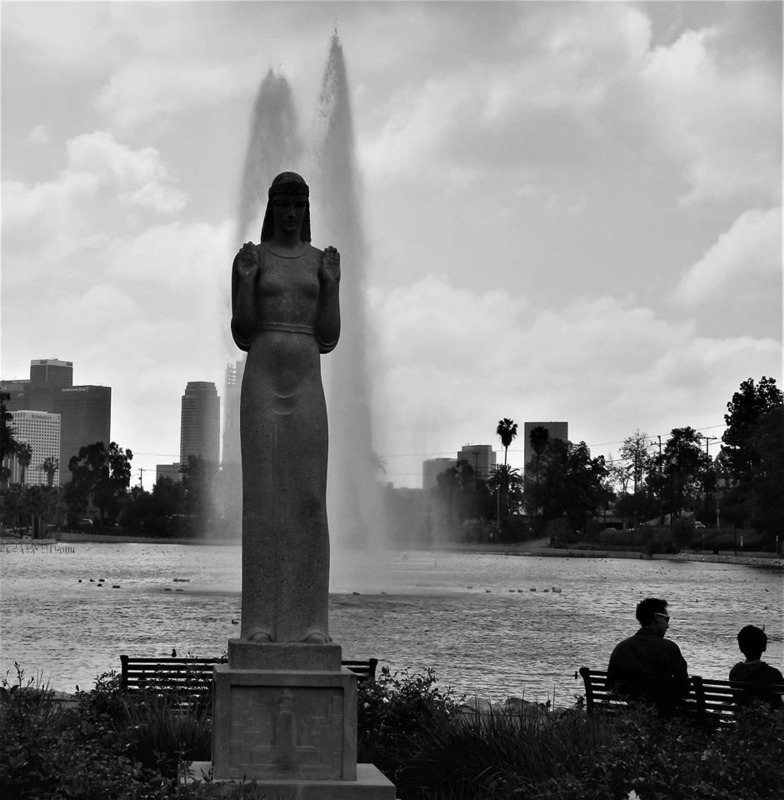 2000)^.^ – View showing the “Lady of the Lake” statue at Echo Park with fountain in the background. Click HERE to see more Early Views of Echo Park. 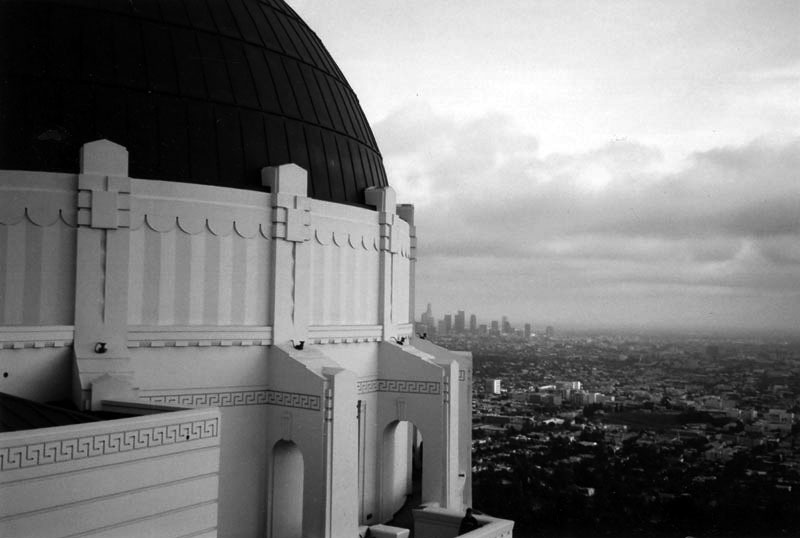 (1998)^ - Echo Park and its Lake are visible in the center of the photo, the famed Angelus Temple with its domed roof can be seen on the lower left, and Downtown L.A. skyscrapers sit majestically in the background. Angelus Temple was dedicated on January 1, 1923. It was added to the National Register of Historic Places in 1992, Building #92001875. On July 2002 the historic Temple completed major renovations, returning it to the classic and elegant look of the 1920's while also making it modern enough to have contemporary services suitable for today, without changing its historic elements. Nearly century-old homes, hillside bungalow courts, apartment buildings and pubic stairways also surround the landmark Echo Park. The visible street running along Angelus Temple and Echo Park is Glendale Boulevard. 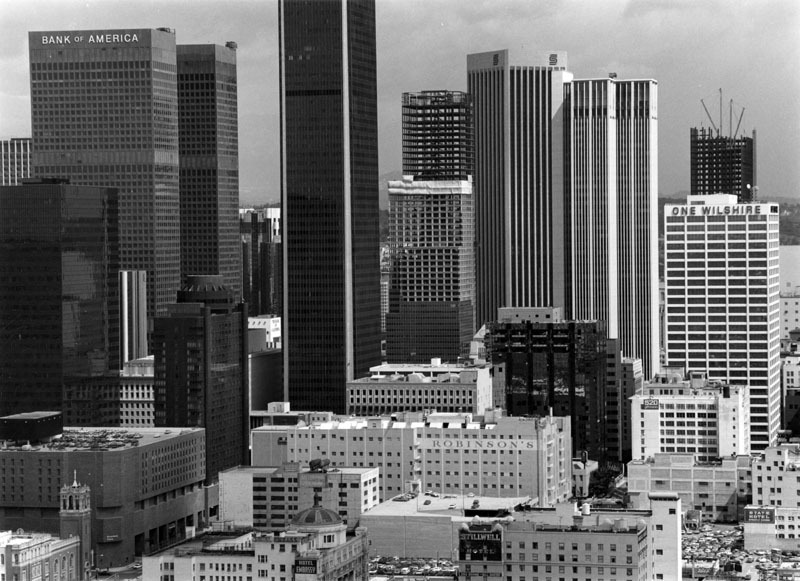 (2005)* - Panoramic view of Downtown Los Angeles. Photo shows numerous highrise buildings; among them are Ernst & Young, TCW, AON, U.S. Bank, One Wishire, Citigroup, etc. The Harbor (110) Freeway is visible at middle left. (ca. 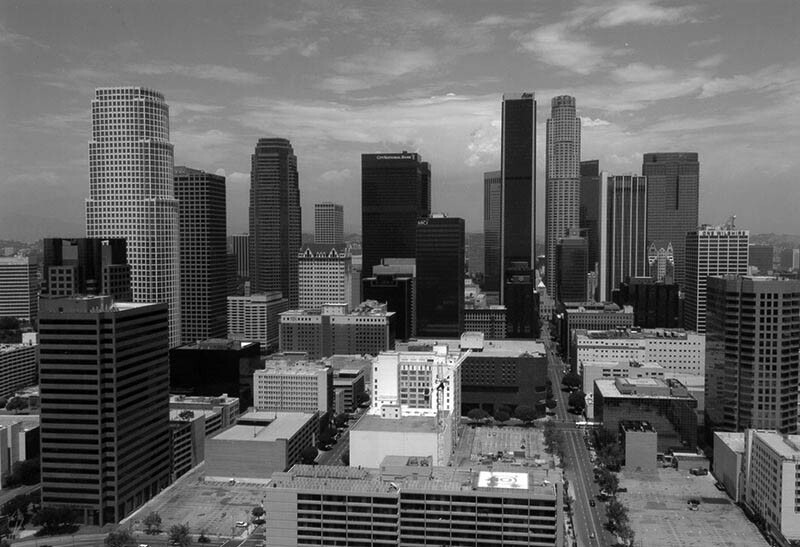 2012)**^ - Aerial view of the Downtown skyline, looking northeast, as seen from west of the Harbor Freeway. (2016)^* - View looking SW from City Hall showing the Downtown skyline. The large cubed building at center is the 10-story First Street U.S. Courthouse located on the SW corner of 1st and Broadway. 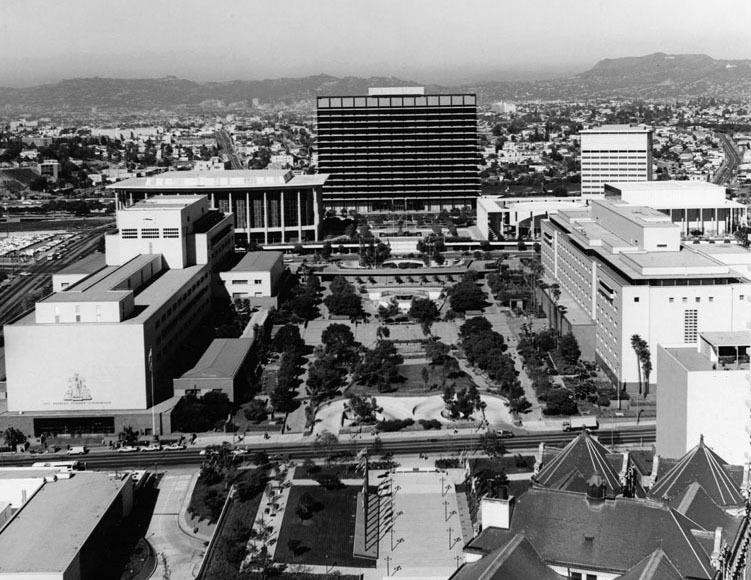 In the foreground can be seen the LA Times Building (lower-left) and the LA Law Library (lower-right). At center-right is the Walt Disney Concert Hall and the Bunker Hill Tower behind it. 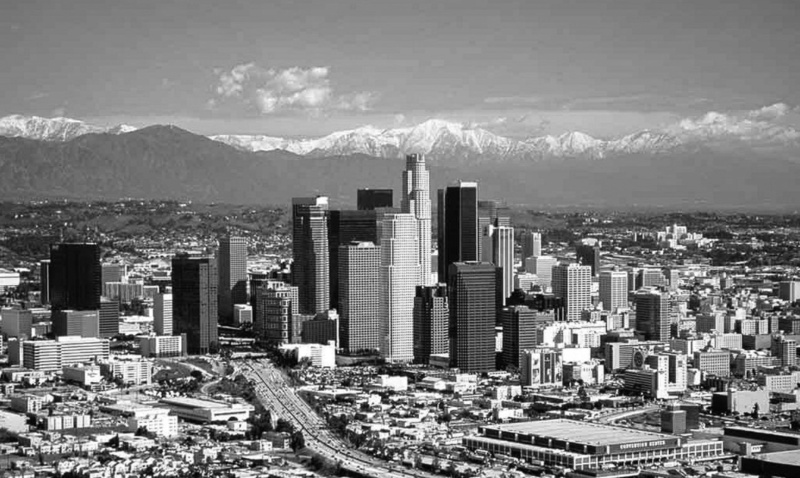 (2004)^* - View of the Los Angeles skyline as seen from the Grand Central Market. 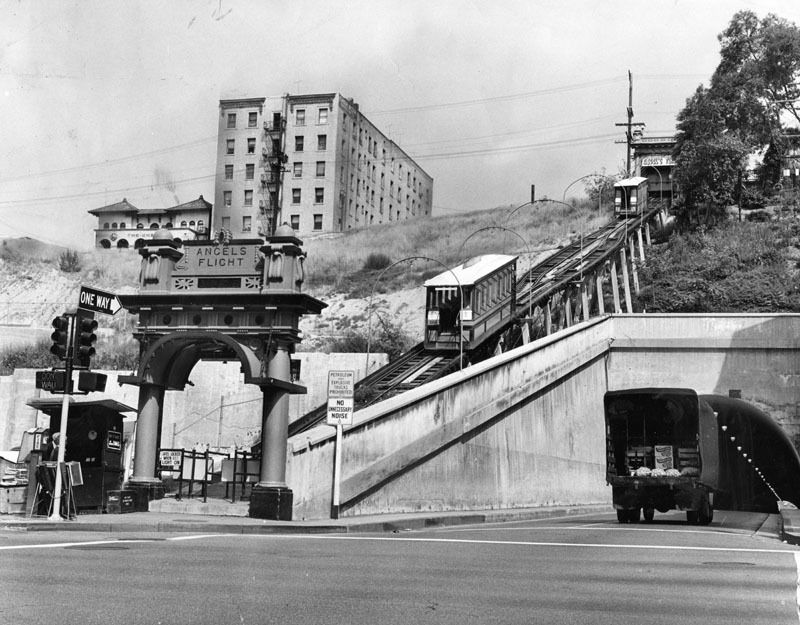 Angels Flight terminal on Hill Street is seen at the lower right. (2018)^.^ – View showing (l to r): U.S. Bank Tower (1,018 feet), 611 Place (620 feet), and Citigroup Center (627 feet). 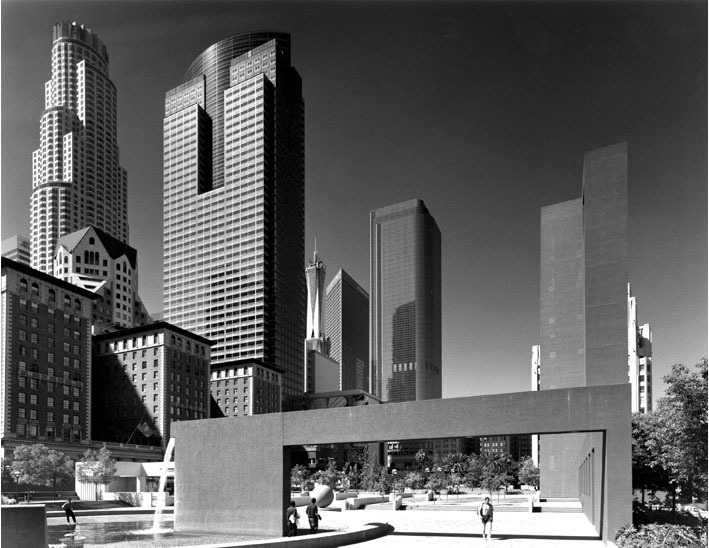 (2007)^* - View looking northwest from Pershing Square showing the Downtown skyline. The tallest building, the 73-story. U.S. Bank Tower, is at upper-left. The Biltmore Hotel is directly across Olive Street at lower-left. (ca. 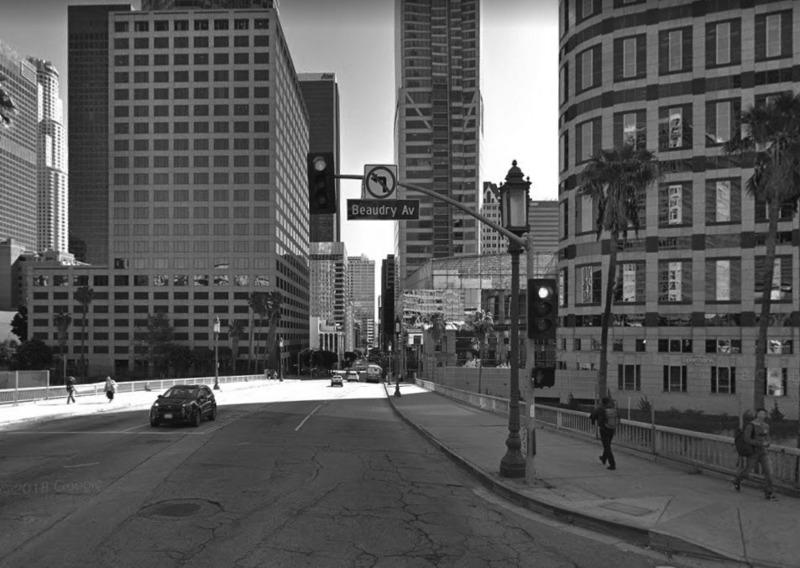 2011)**# – View looking southwest from over the intersection of 5th and Hill streets showing Pershing Square with the Biltmore Hotel on the right and the Downtown skyline in the background. 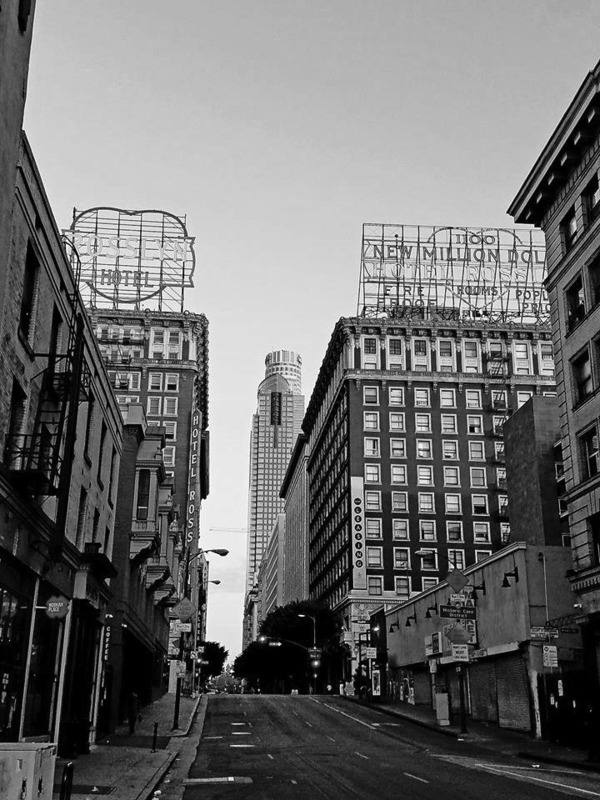 (2018)^.^ – View looking west on 5th Street toward Los Angeles Street. Sign at right reads “Old Bank District”. Rosslyn Lofts (formerly the Rosslyn Hotel and Annex) with large roof-mounted sign can be seen at left. In the background can be seen several skyscrapers including (l to r): The U.S. Bank Tower, Gas Company Tower, Two California Plaza, One California Plaza (AECOM), and Wells Fargo Center. (ca. 2018)^.^ - View looking west on 5th Street from Los Angeles Street showing the Rosslyn Lofts (formerly the Rosslyn Hotel and Annex) as they appear today. The U.S. Bank Tower and Gas Company Tower are seen in the background. The 1913-built Hotel Rosslyn has a history unique in all of the city of Los Angeles. 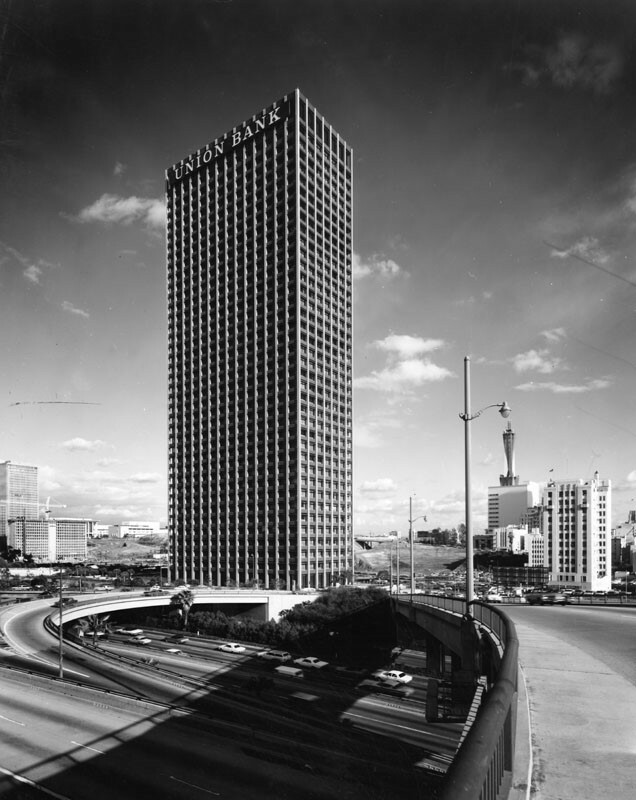 Once the tallest building in LA, the 12-story Rosslyn boasted in it's large rooftop sign as being the "Fireproof Million Dollar Hotel." Click HERE to see more Early Views of the Rosslyn Hotel and Annex. 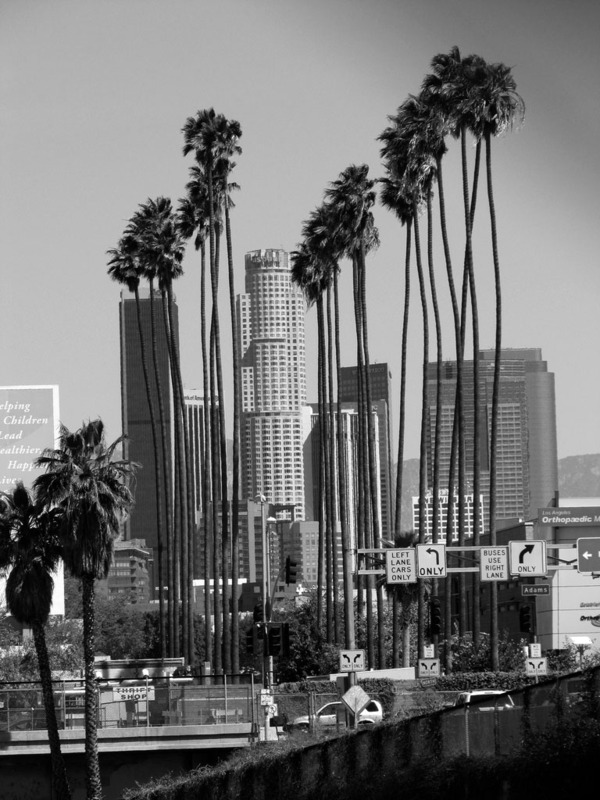 (2010)^* - View looking north toward the downtown skyline through what is the LA's oldest palm trees. The trees are located on what was Palm Avenue at Adams Boulevard and were planted cira 1875. Click HERE to see more on LA's oldest palm trees. (ca. 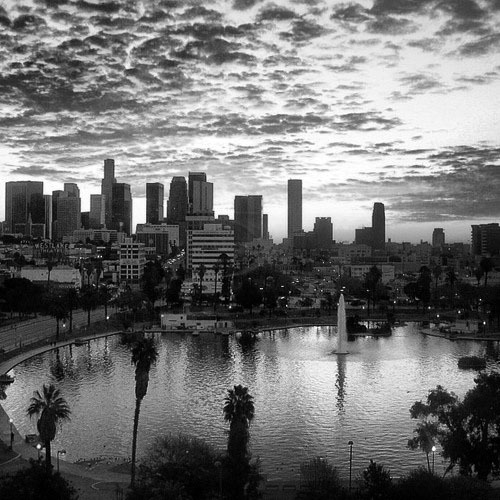 2010)**** - View of MacArthur Park with the Los Angeles Downtown skyline in the background. (ca. 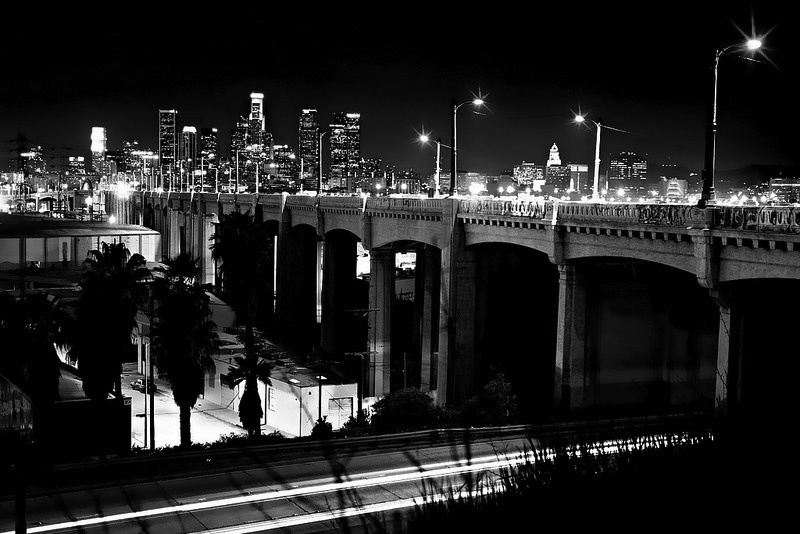 2010s)##^# – View looking west showing the Sixth Sthreet Bridge with the Los Angeles Downtown skyline in the distance. 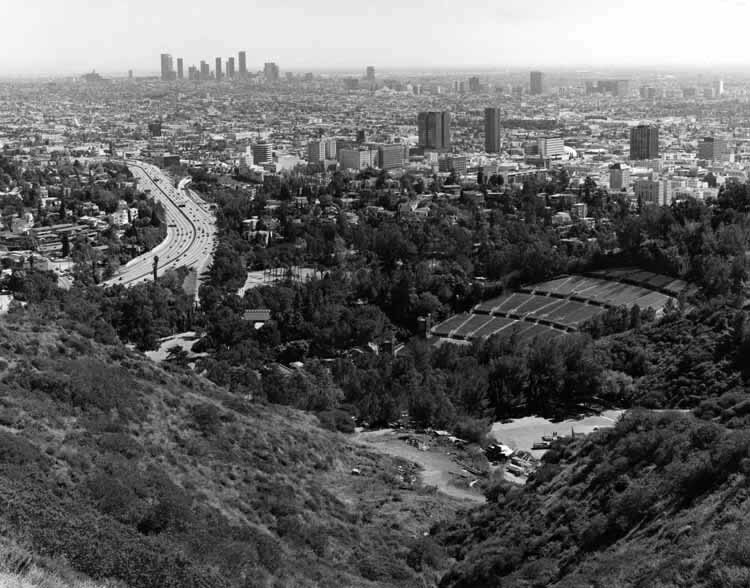 (1989)**^* - View of Hollywood from Mulholland Drive. 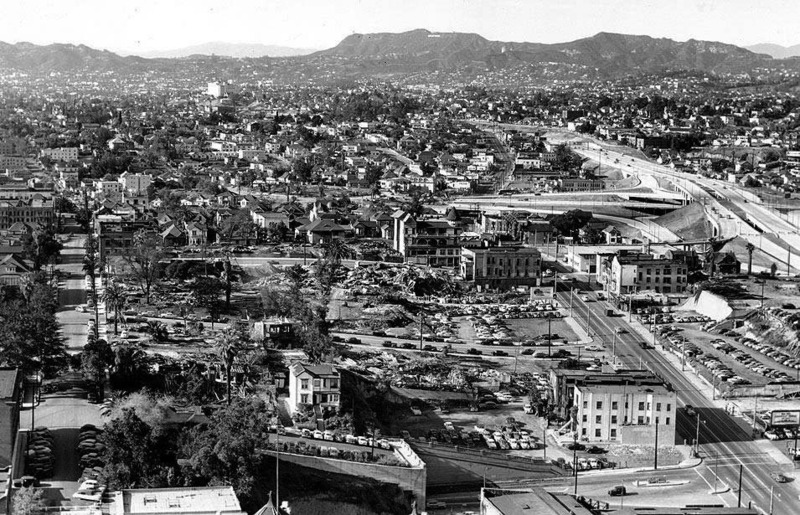 The Hollywood Bowl can be seen in the foreground and the Hollywood Freeway is to the left. In the far distance can be seen Downtown L.A. and the Wilshire corridor. 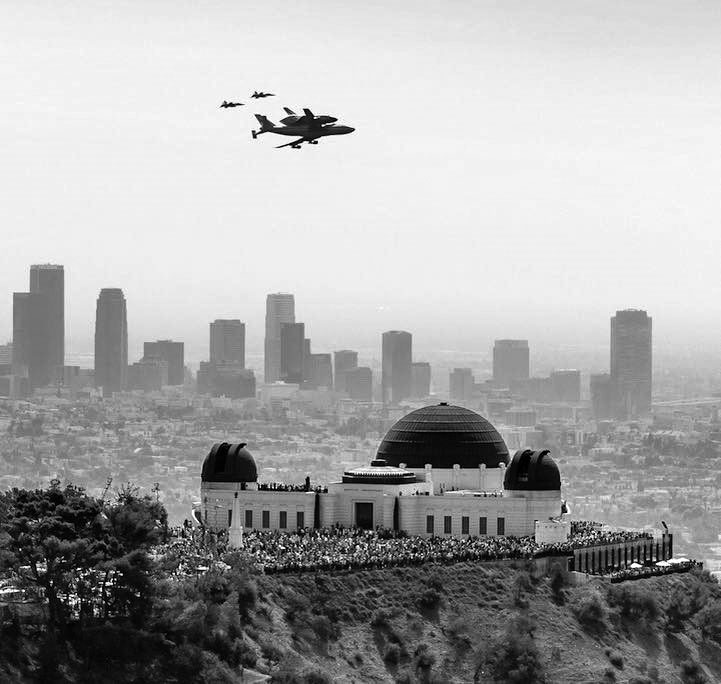 (1987)^ - Looking east from the Hollywood Hills, L.A.'s skyline appears clear and bright as does Hollywood and its distinctive Cinerama Dome. Click HERE to see more in Early Views of Hollywood. (ca. 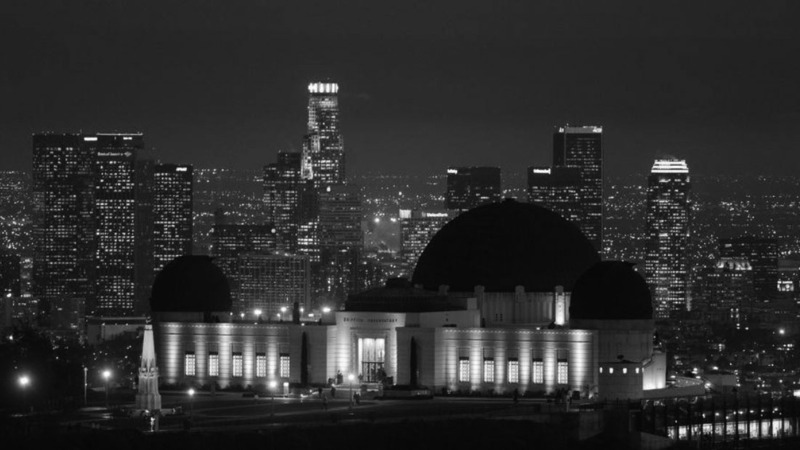 2006)^ - Panoramic view of Los Feliz, Hollywood and downtown Los Angeles, taken from outside of the Samuel Oschin Planetarium at Griffith Observatory. 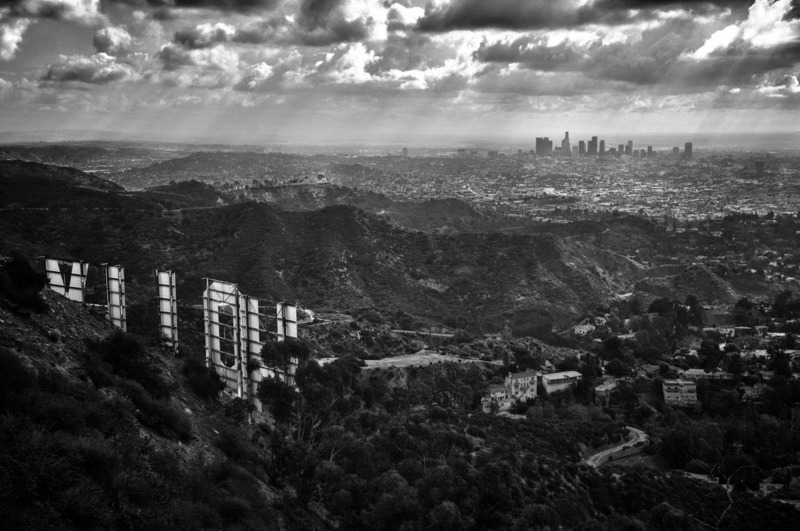 (2011)#^*# - View of Downtown Los Angeles from behind the Hollywood Sign. 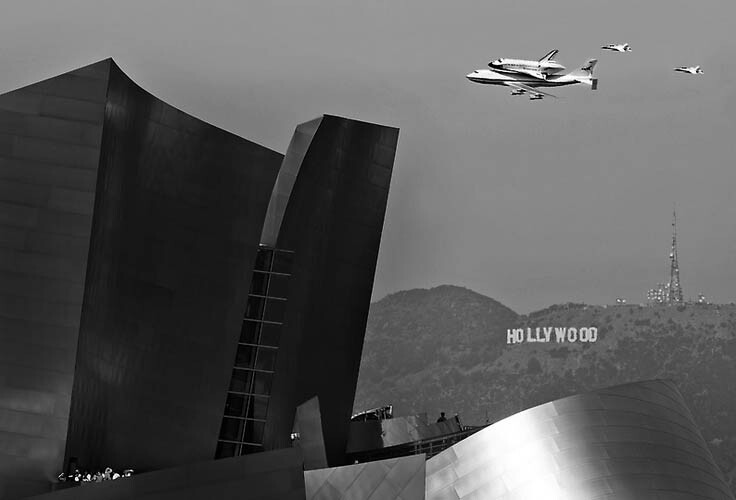 (2012)#** - Space Shuttle Endeavour makes its final flight to LAX on September 21, 2012 as it passes over Disney Hall and the Hollywood Sign. 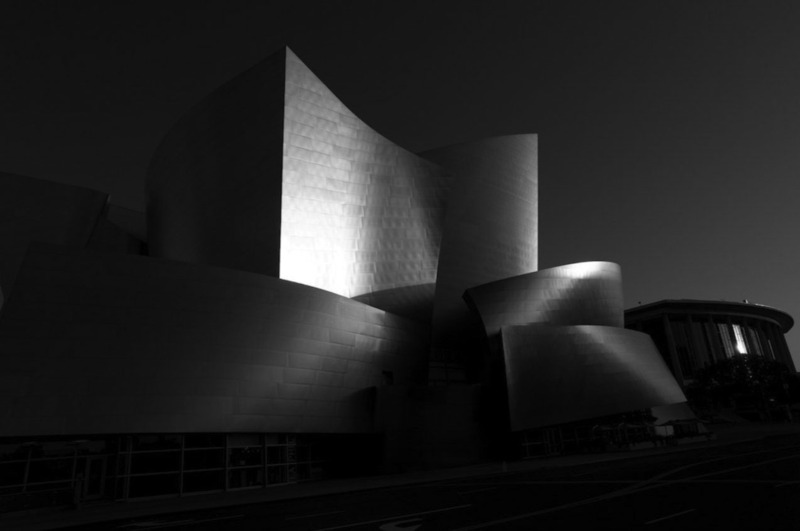 (2012)^** - View of Disney Hall at sunrise as seen from Grand Avenue. The Dorothy Chandler Pavilion stands at right, across 1st Street. 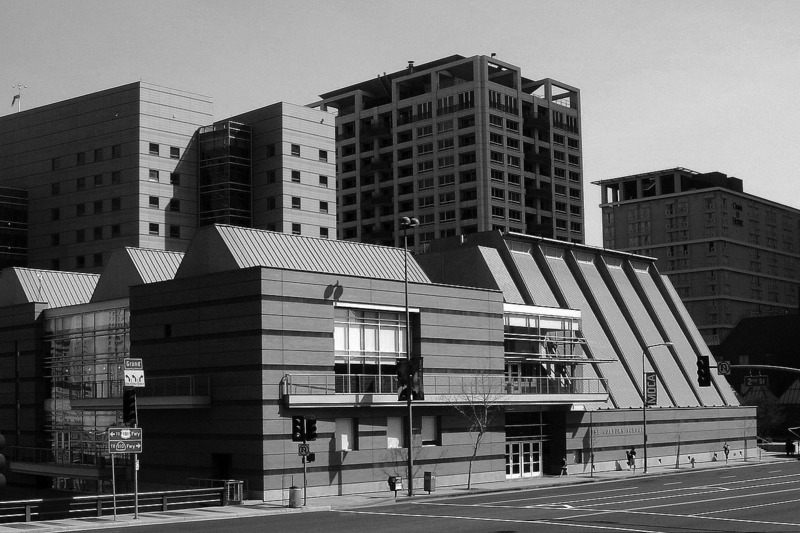 (2007)*^ – View looking at the Colburn School located on Grand Avenue at 2nd Street. (2010s)^.^ – View looking southeast showing the DWP Building at sunset with the Dorothy Chandler Pavilion at left and the downtown skyline in the background. 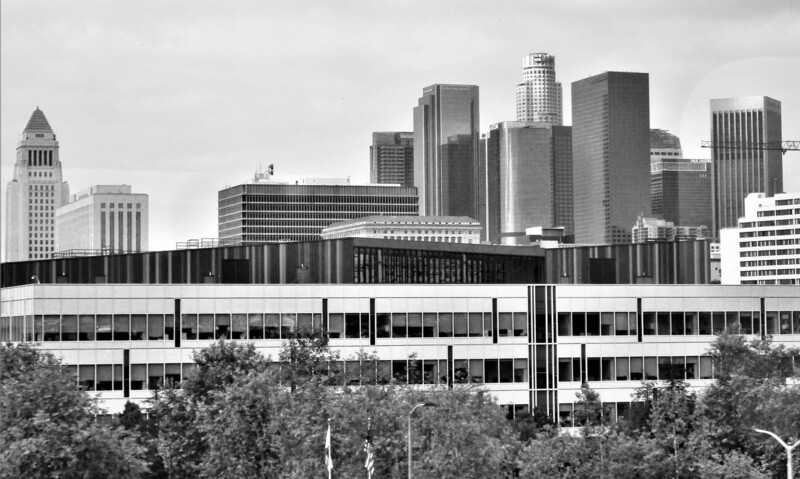 (2016)^.^ - View looking southeast showing the Downtown skyline as seen from the Edward R. Roybal Learning Center on 2nd Street just west of Beaudry Avenue. The tallest building seen here is the U.S. Bank Tower at center-right with the Westin Bonaventure Hotel at far right. At lower-left is an art deco-style building located within Department of Water and Power’s Boylston Street Yard. Click HERE for contemporary street view. 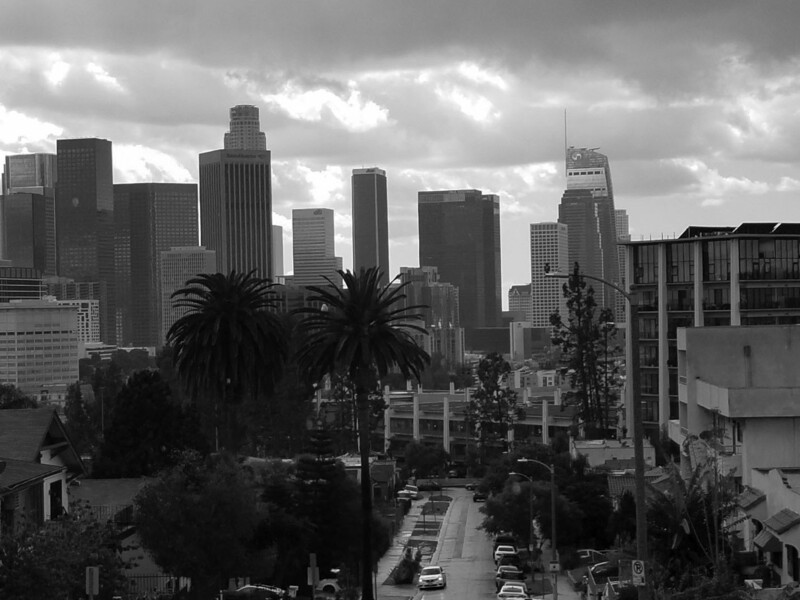 (2019)* - View looking South at the Los Angeles skyline as seen from Marview Ave and Figueroa Terrace in Victor Heights. Photo by Jack Feldman. Victor Heights is named after Victor Beaudry. 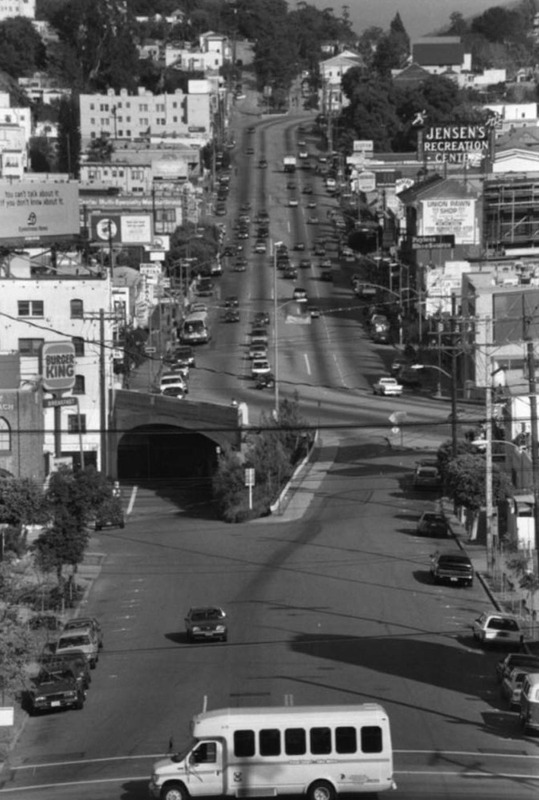 Also, Victor Street, a short two block span between Temple Street and Bellevue Ave that is bisected by the 101 Freeway. Canadian brothers Victor and Prudent Beaudry helped construct LA’s early water works system in the late 1800’s. They were also successful in local real estate. Prudent would go on to develop Bunker Hill. He also became Los Angeles' thirteenth mayor from 1874 to 1876. Beaudry Avenue was named after him. 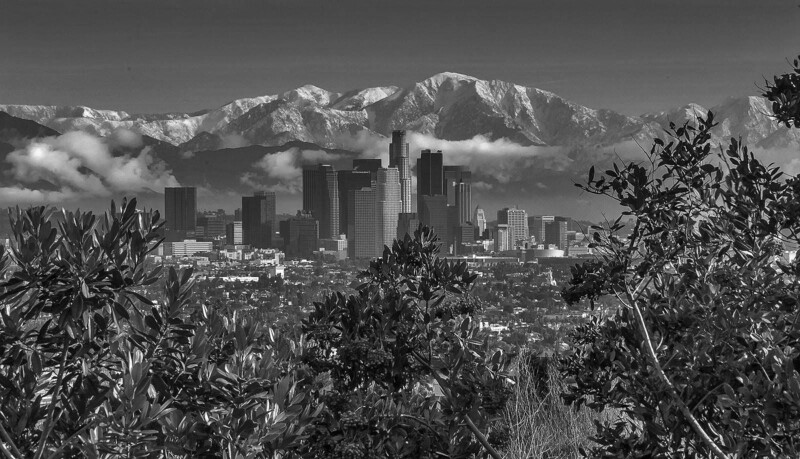 (2010s)^.^ – Panoramic telephoto view showing downtown Los Angeles with the snow-capped San Gabriel Mountains as a backdrop. 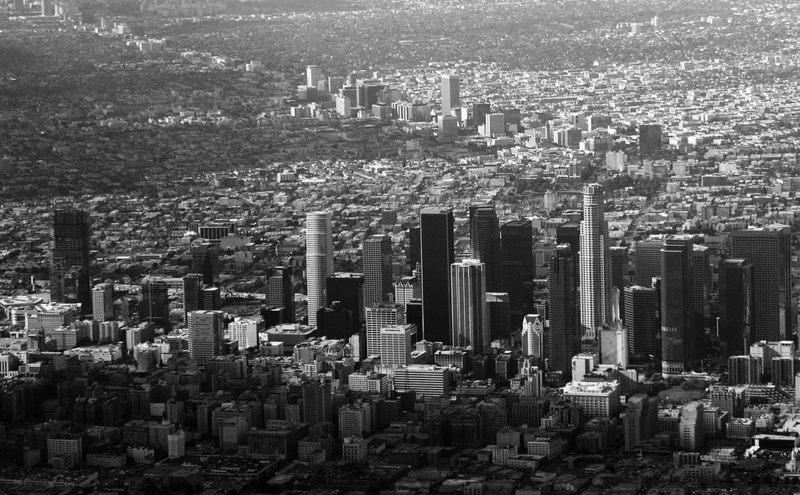 (2011)###* - Aerial view of Downtown Los Angeles on a clear day. Hollywood and the Hollywood Hills are in the background and the San Fernando Valley can also be seen in the distance. 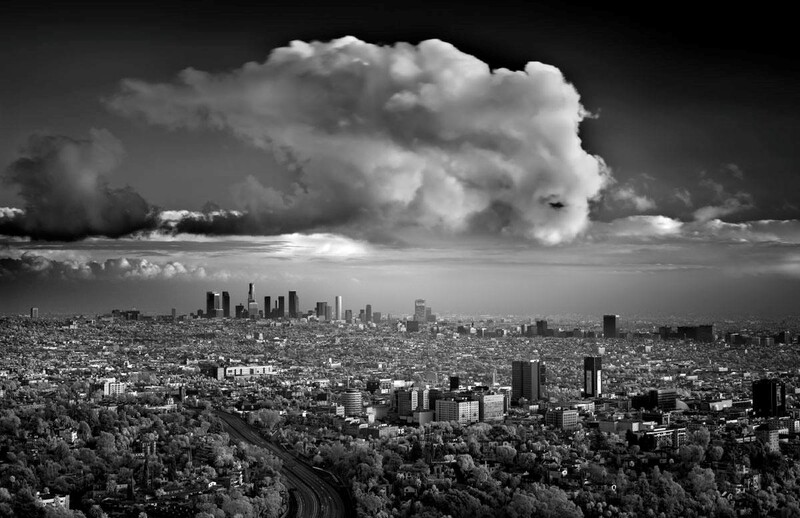 (2010s)++# – Los Angeles on clear day as a storm passes through the area. 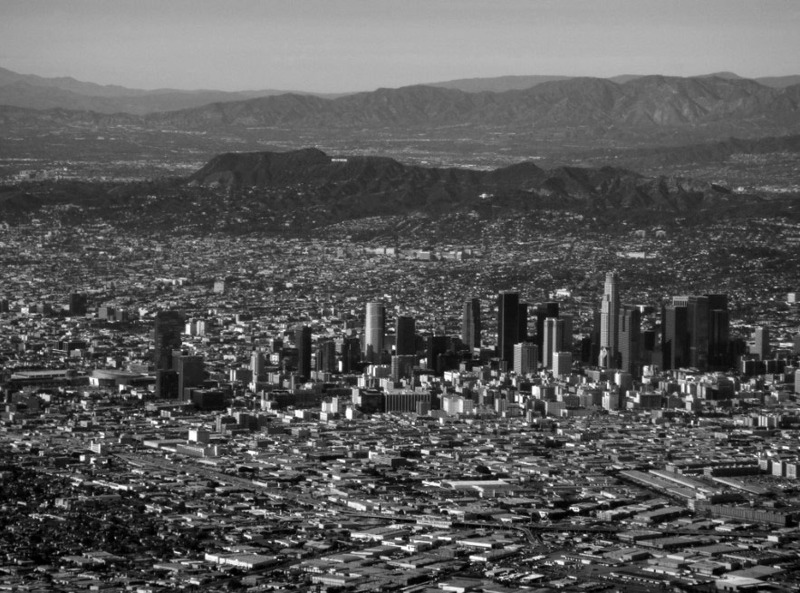 View is looking southeast as seen from above Cahuenga Pass with Hollywood is in the foreground, the Wilshire corridor at center-right, and Downtown at center-left. (2018)^.^ - Aerial view over Echo Park looking southeast toward Downtown Los Angeles.